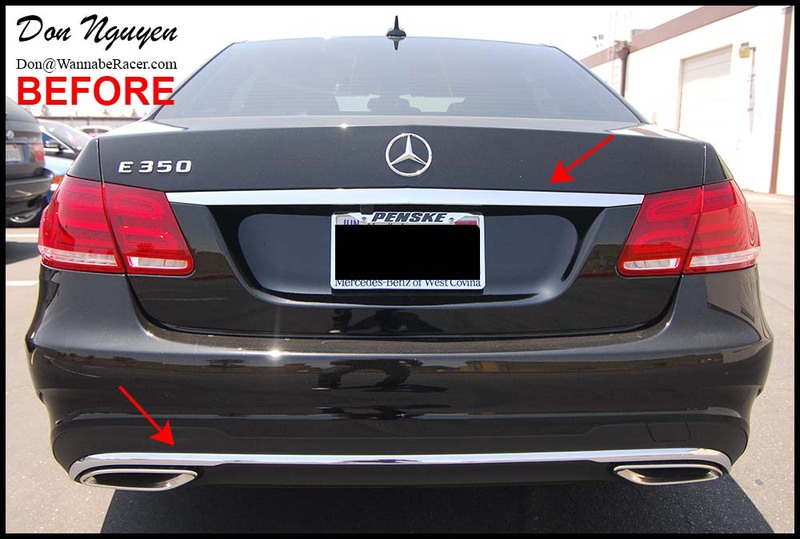 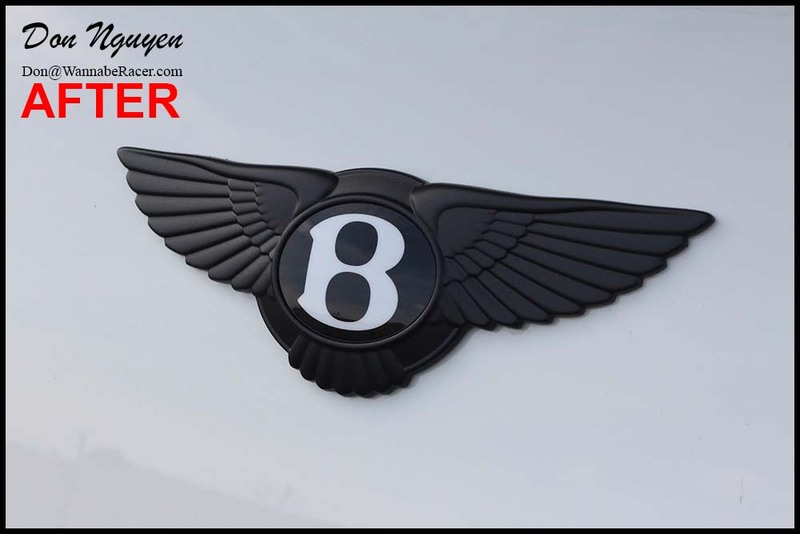 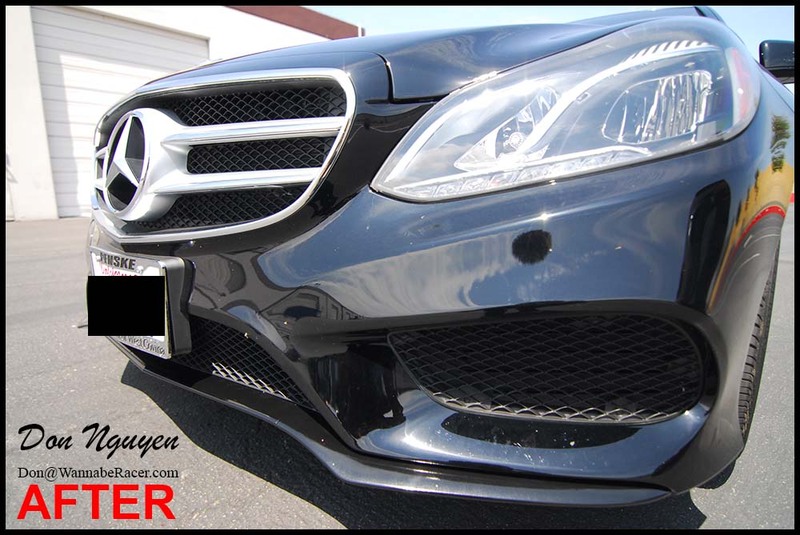 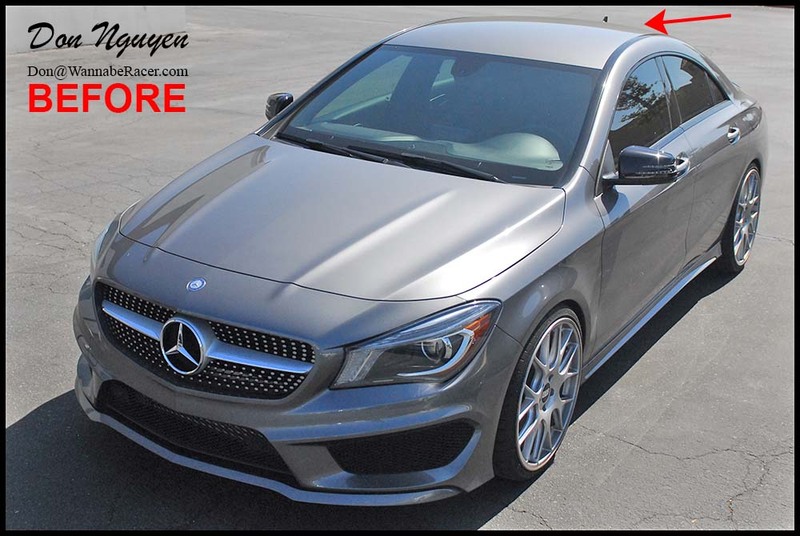 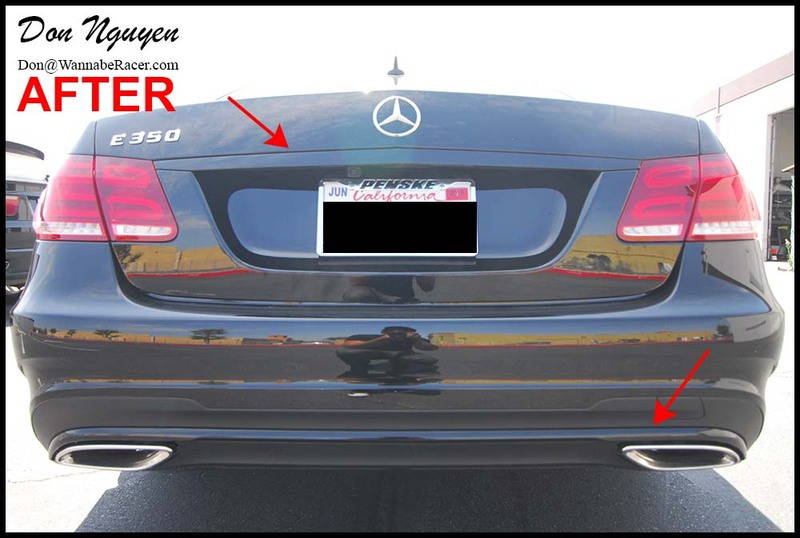 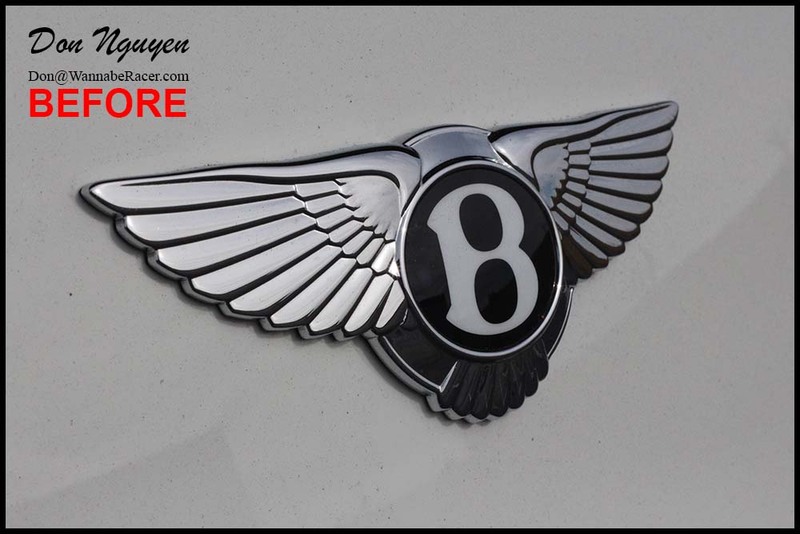 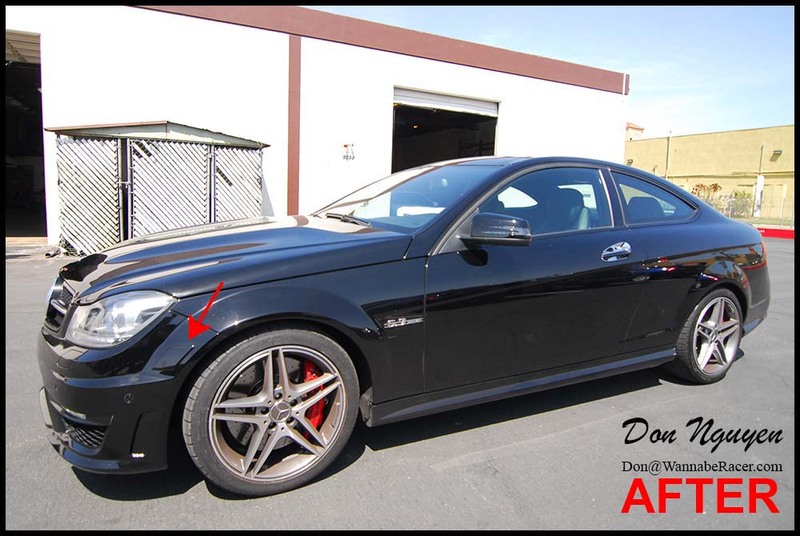 This is not a Mercedes, but I had several people ask me for some more detailed or close up pictures of my plasti dip work and I happen to already have these resized and ready to go. 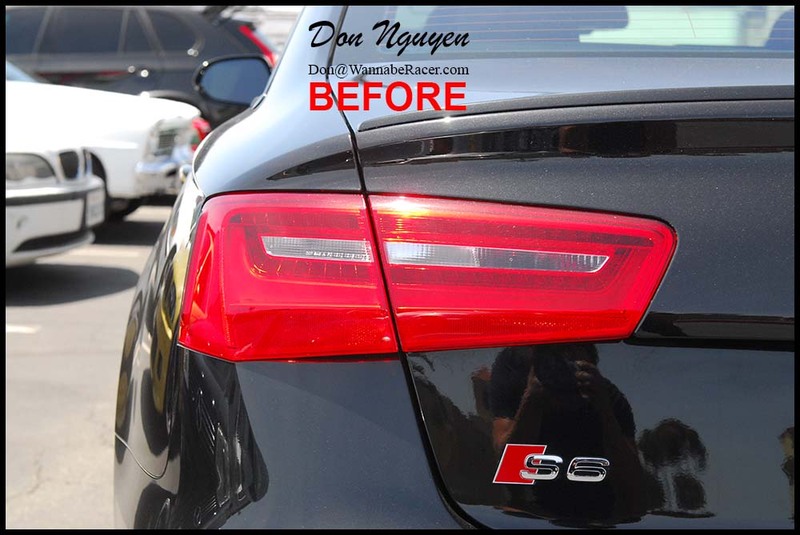 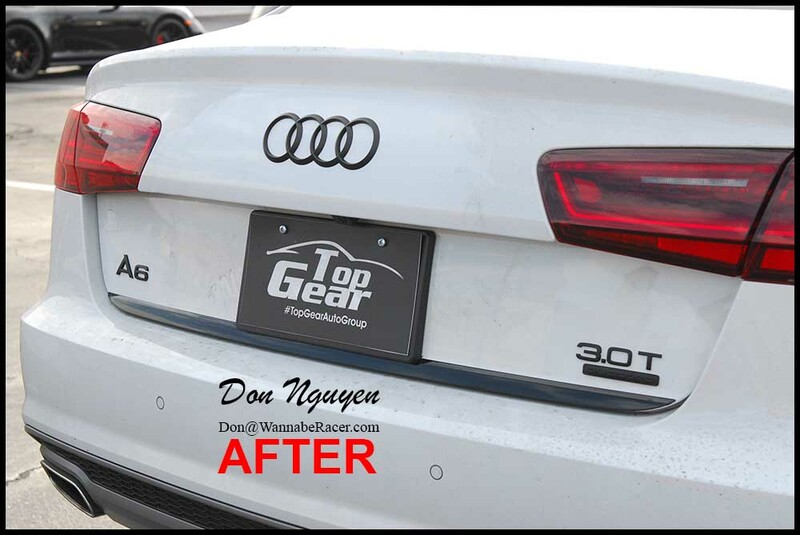 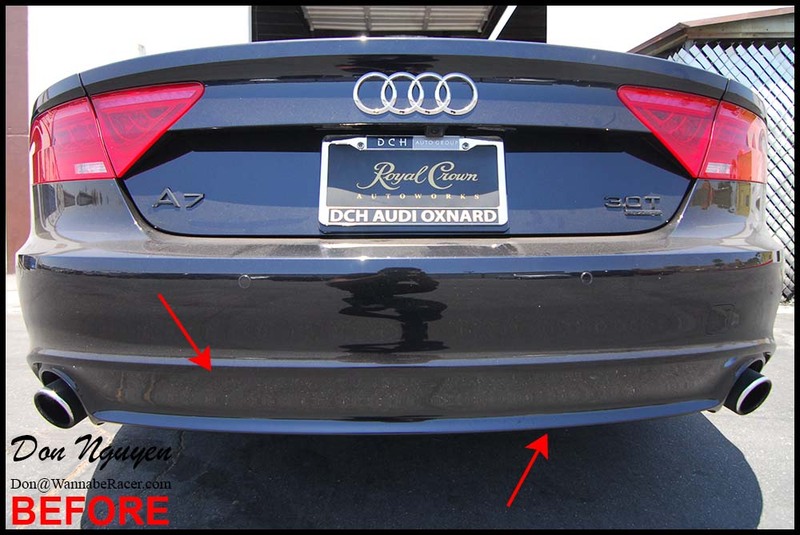 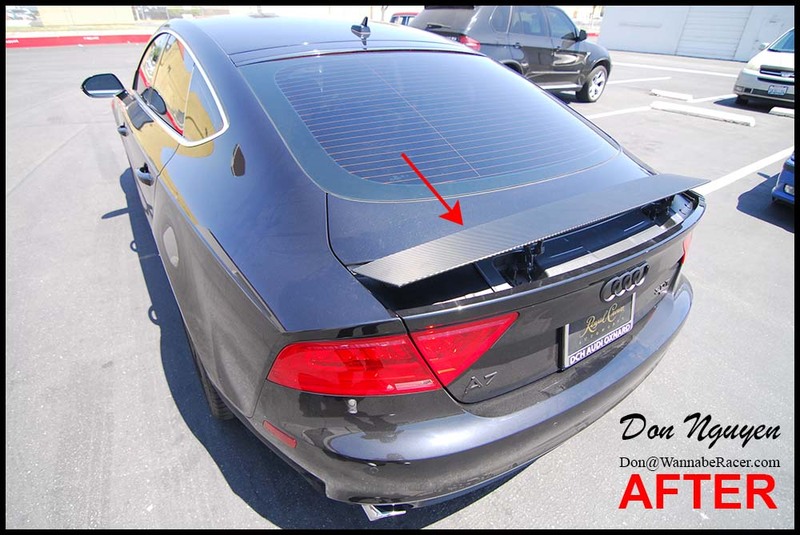 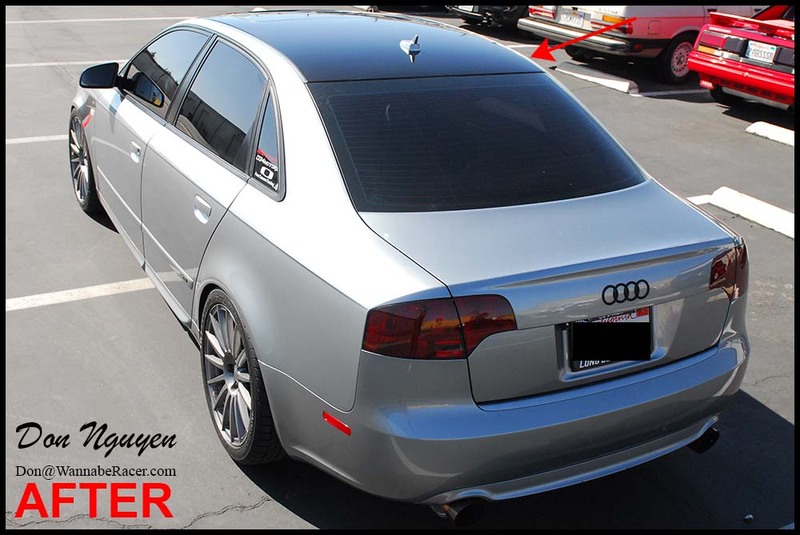 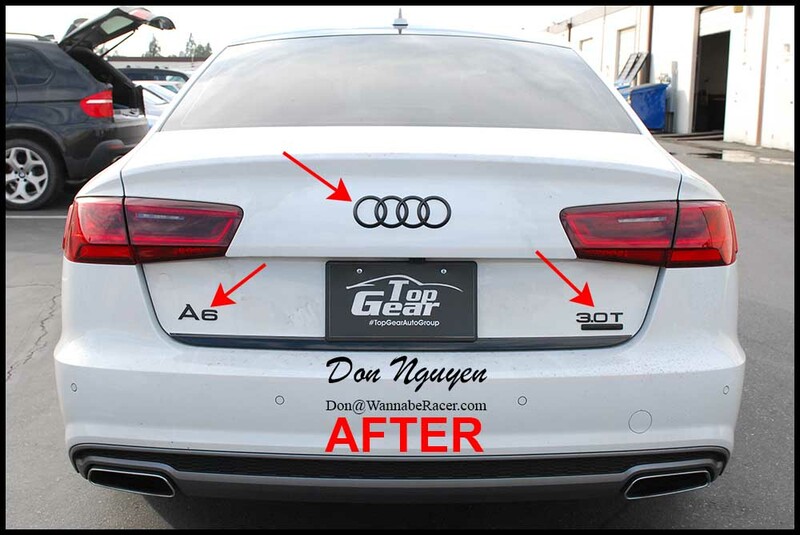 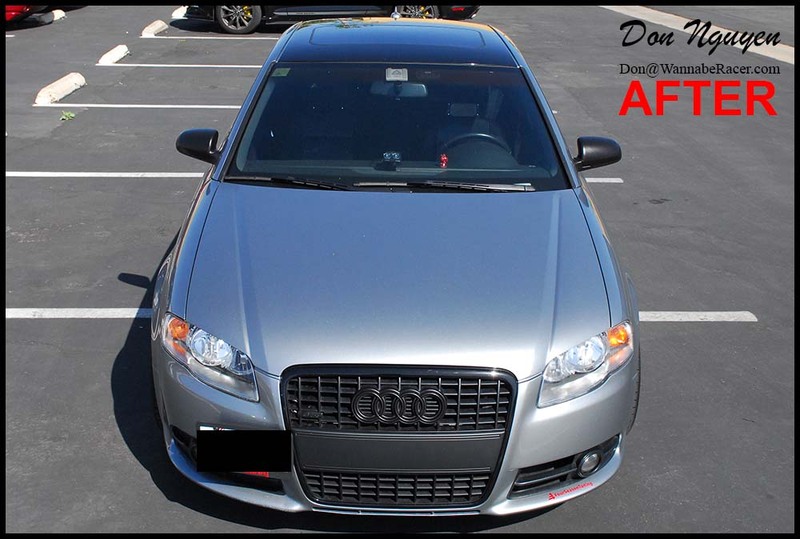 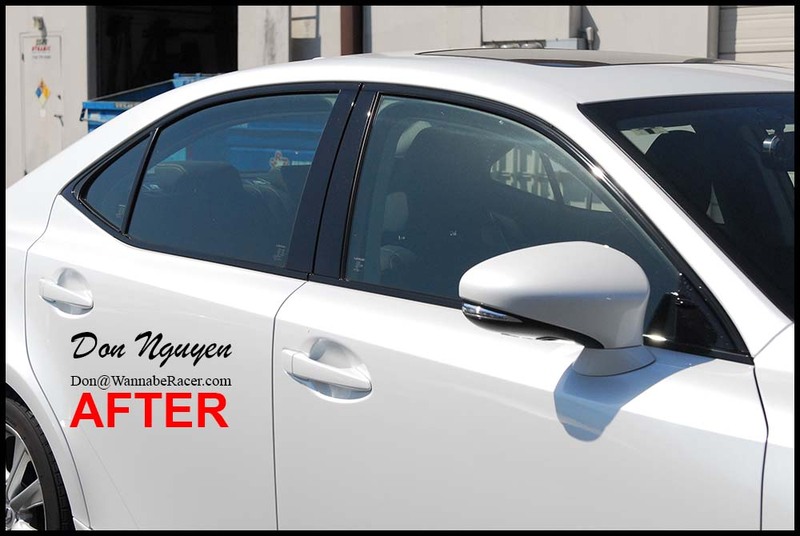 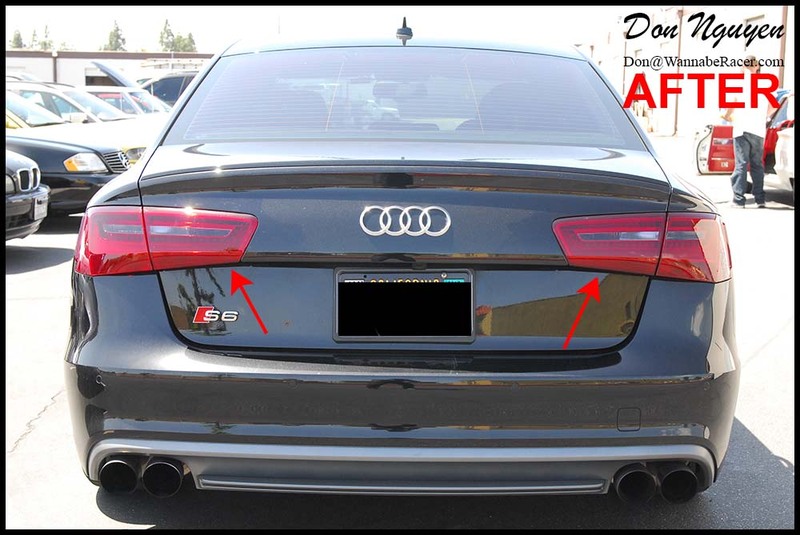 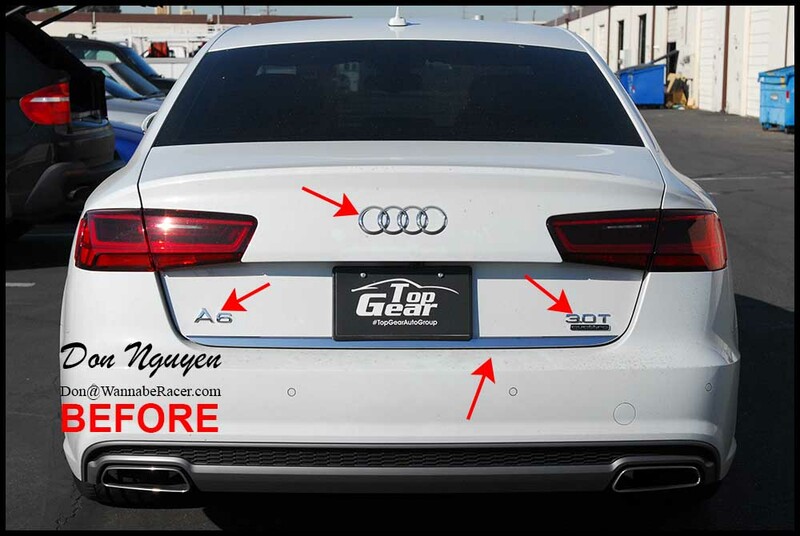 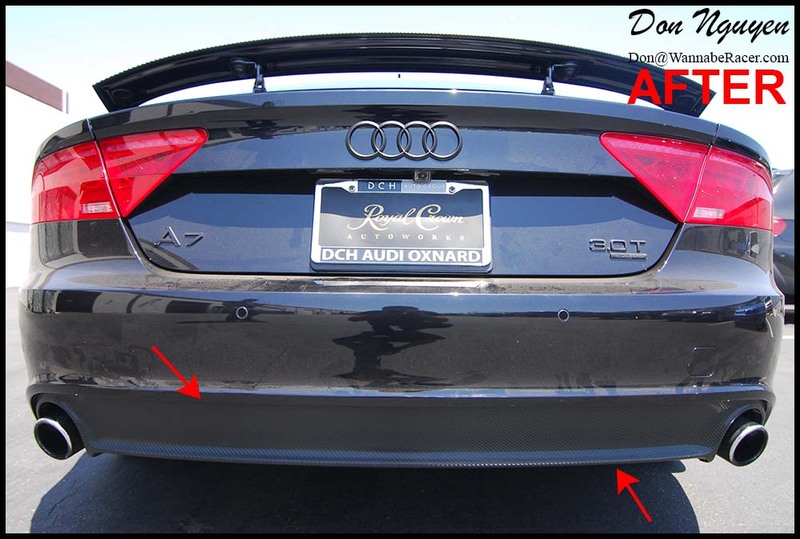 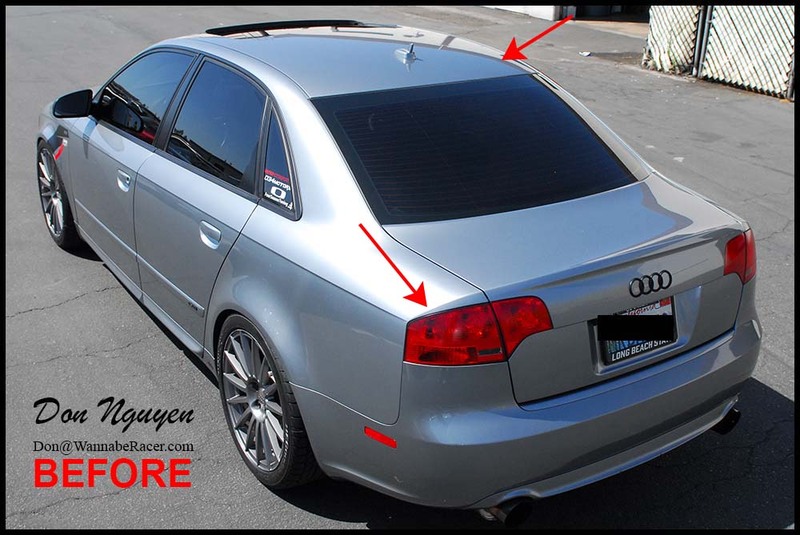 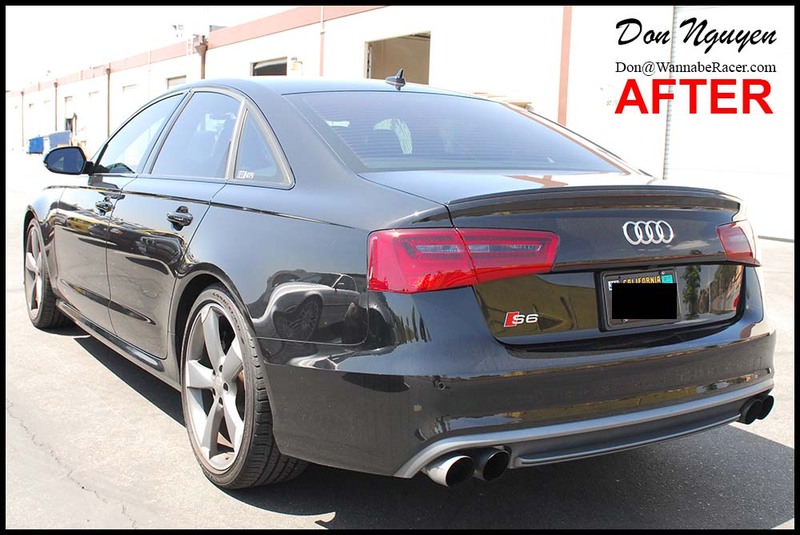 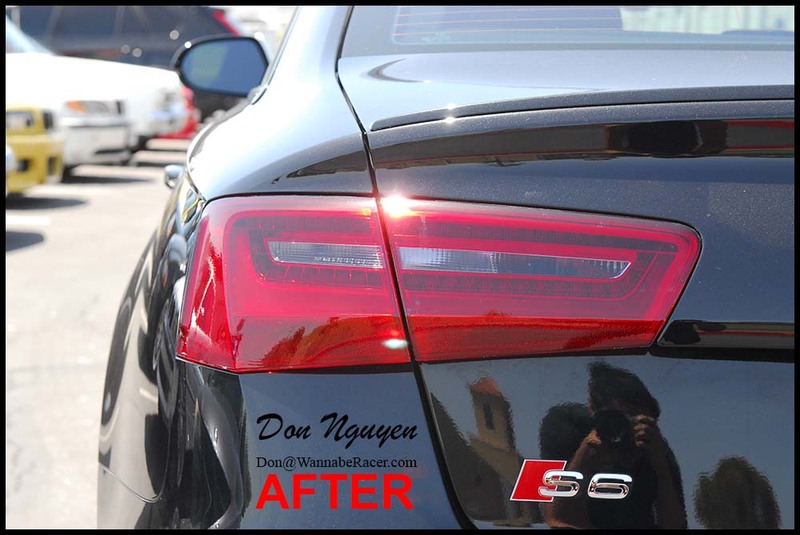 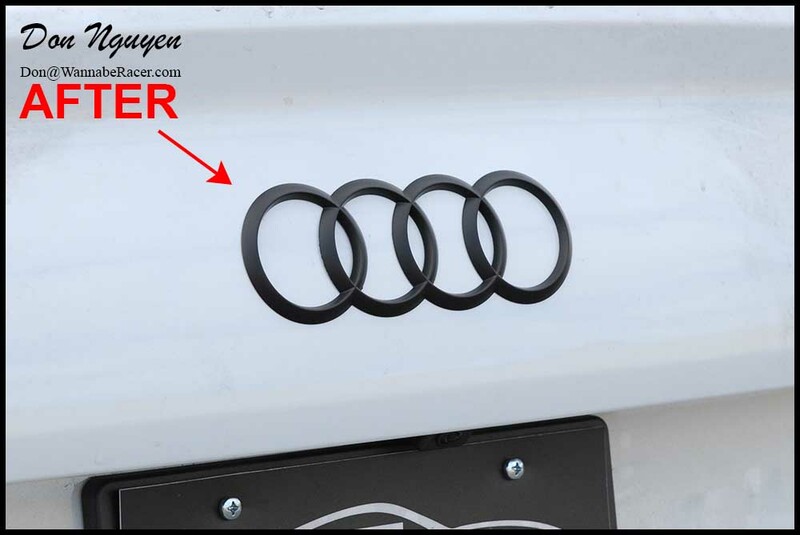 The owner of this white Audi A6 sedan came by my shop in Anaheim Hills / Orange County to have the plasti dip work done, along with getting his roof wrapped and chrome window trim blacked out. 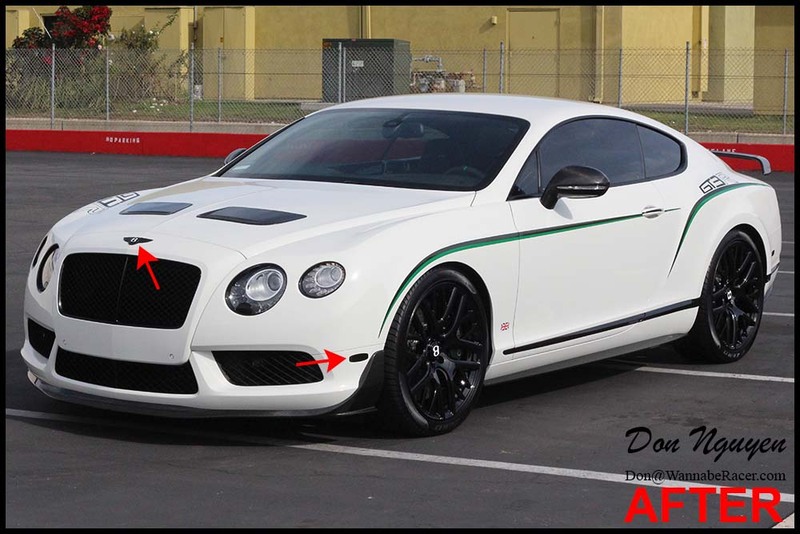 Since he was blacking out everything else, blacking out the chrome badges made everything flow together fairly well. 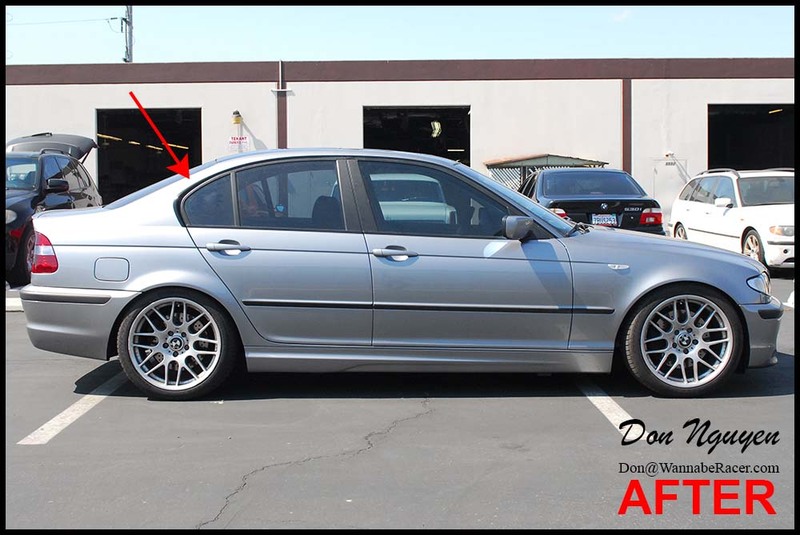 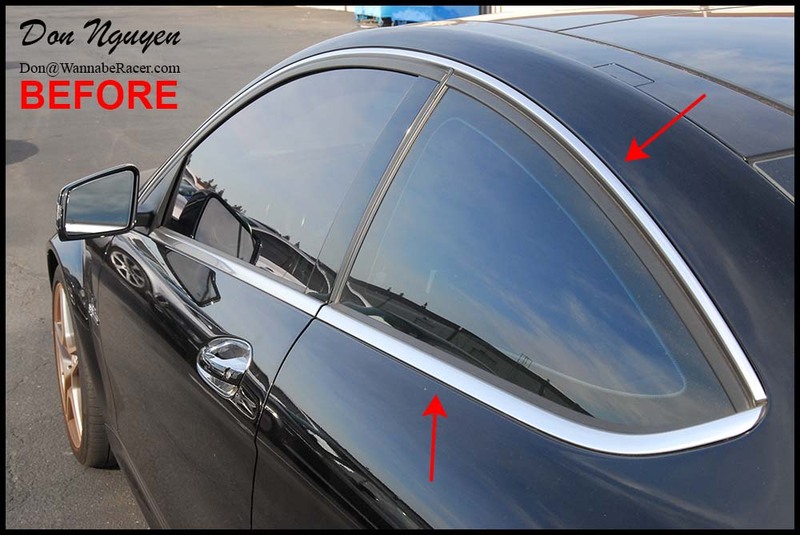 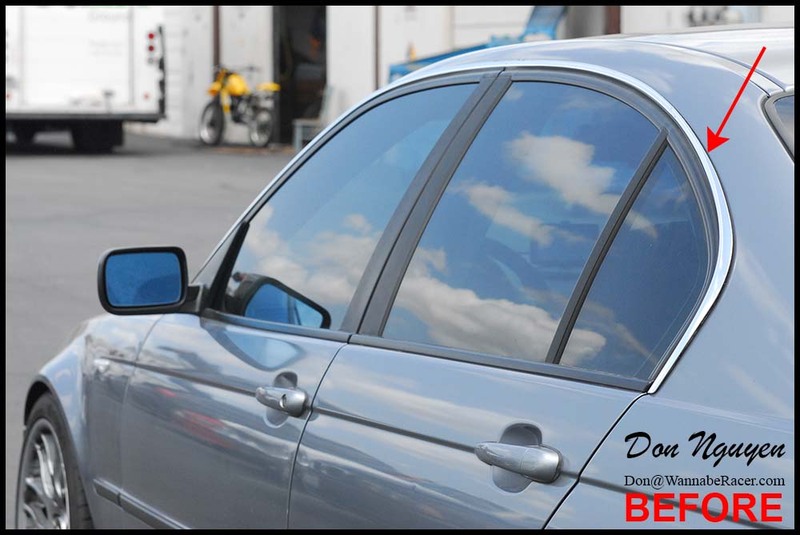 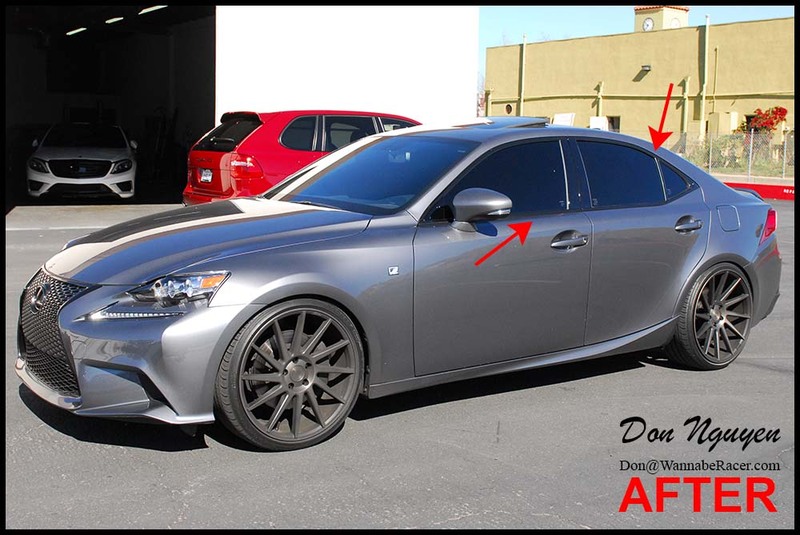 Blacking out the chrome window trim or most chrome pieces in general, changes the look of the car quite dramatically, in my opinion. 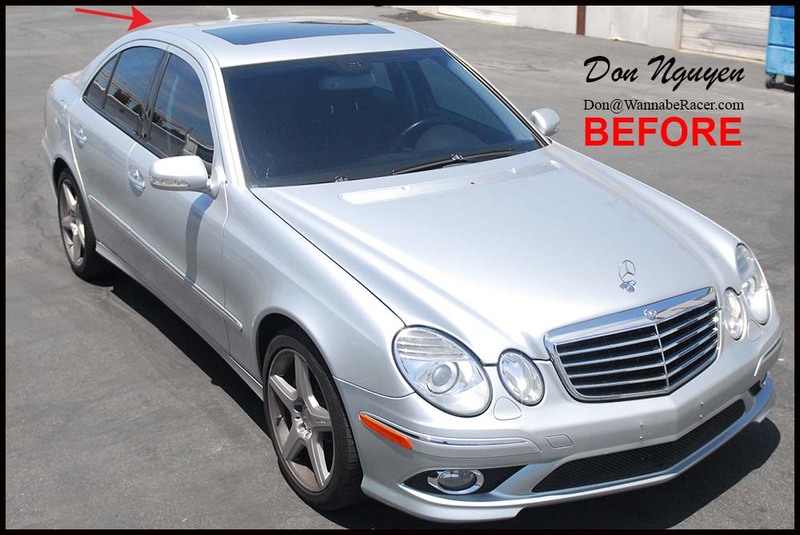 It’s ok to have a little bit of chrome, to provide some contrast, but cleaning up the majority of the chrome around the car really cleans up the lines of the car and makes it look more aggressive as well. 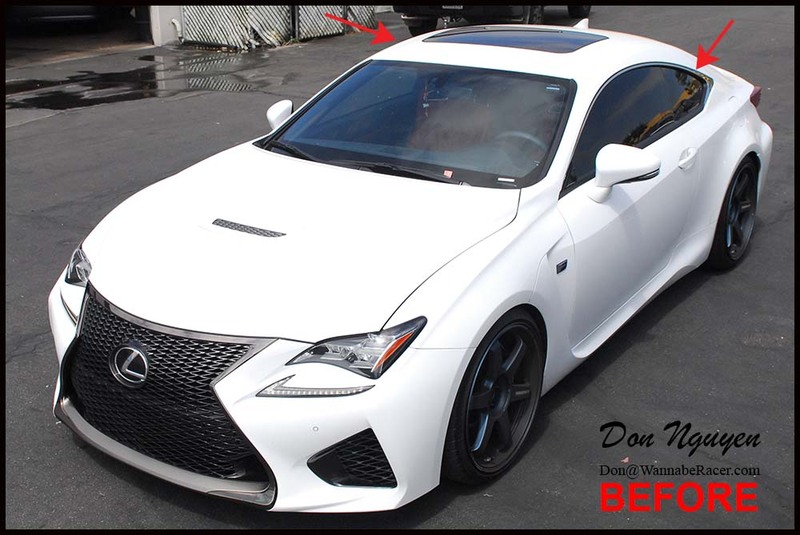 The owner of this car had me wrap his window trim, front grill surround, lower fog lights and amber bumper reflectors in my gloss black vinyl material. 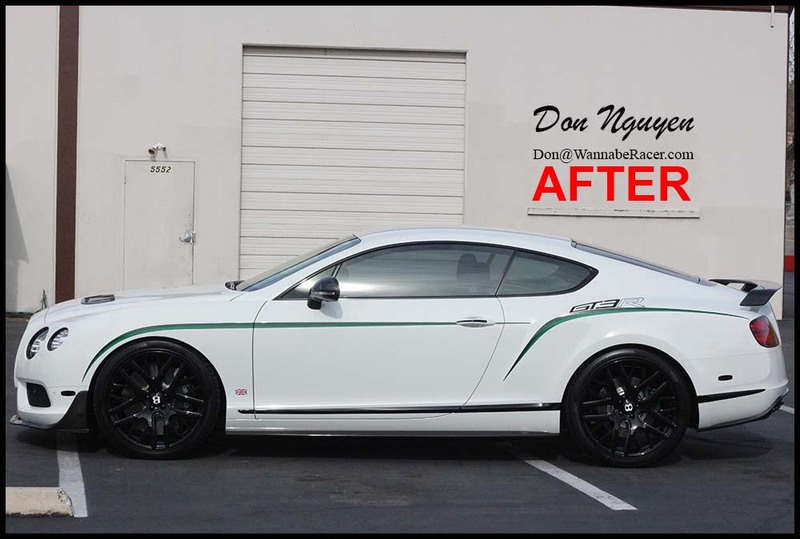 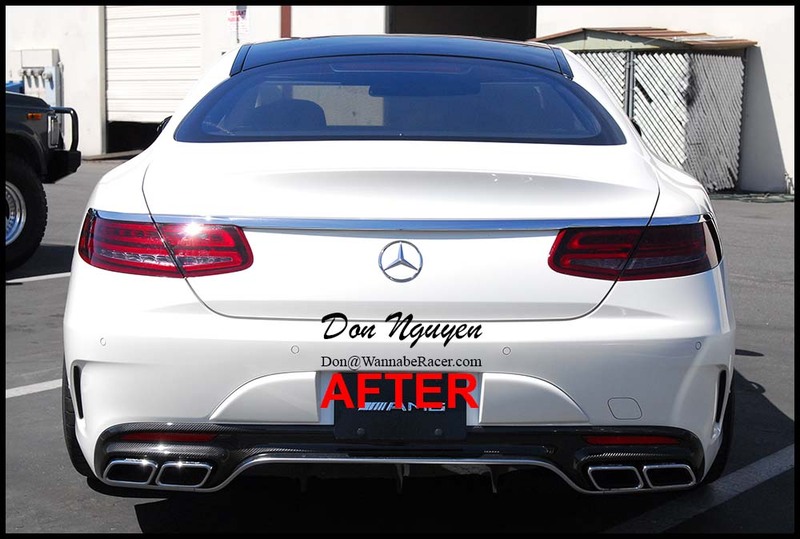 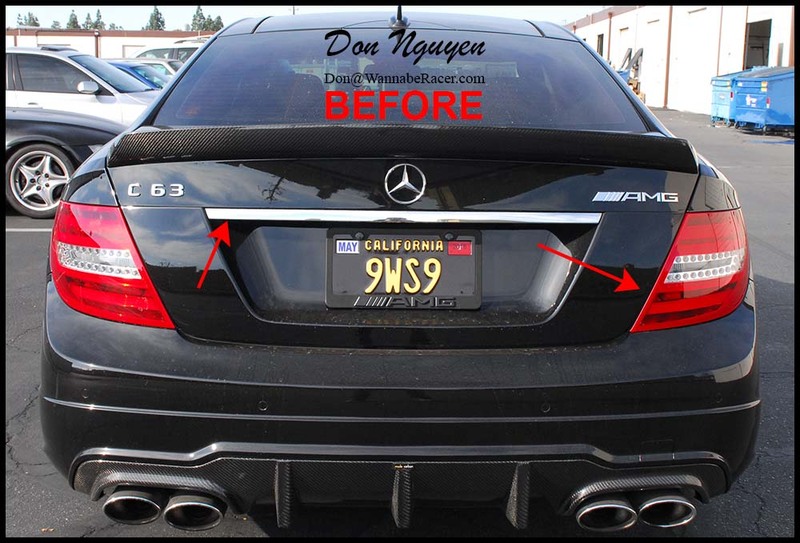 He came out to me in Anaheim Hills / Orange County from Cerritos to have the vinyl work done. 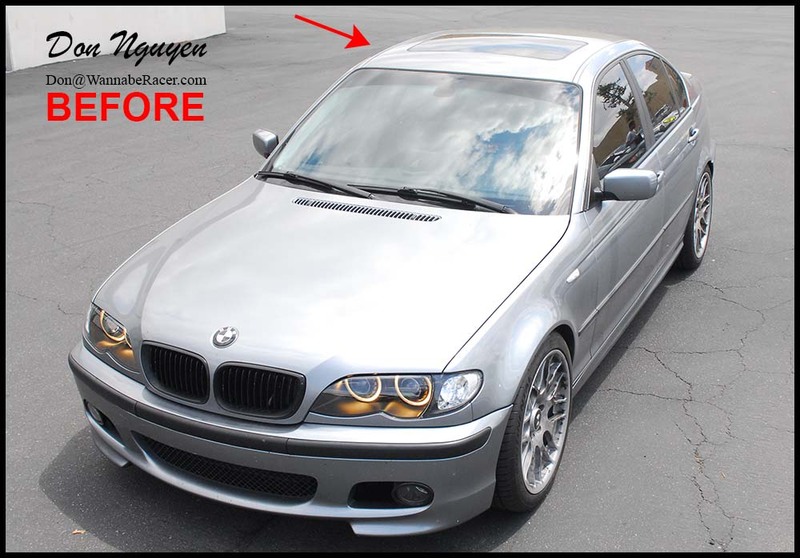 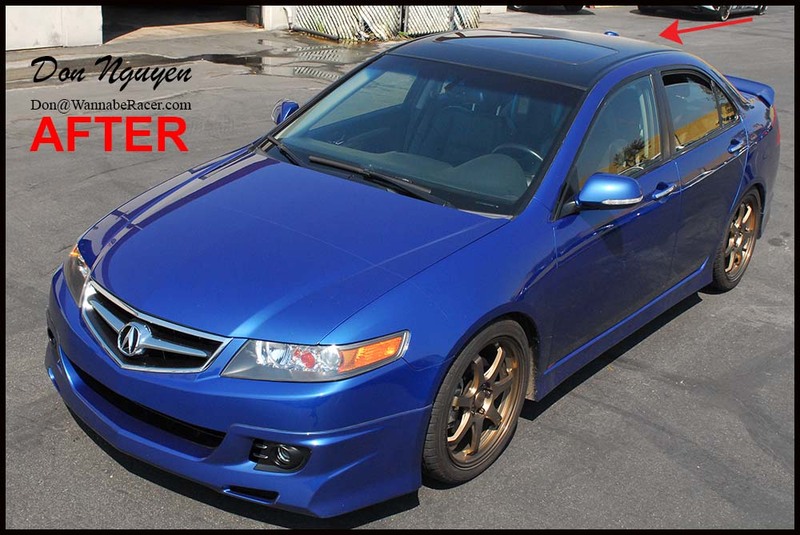 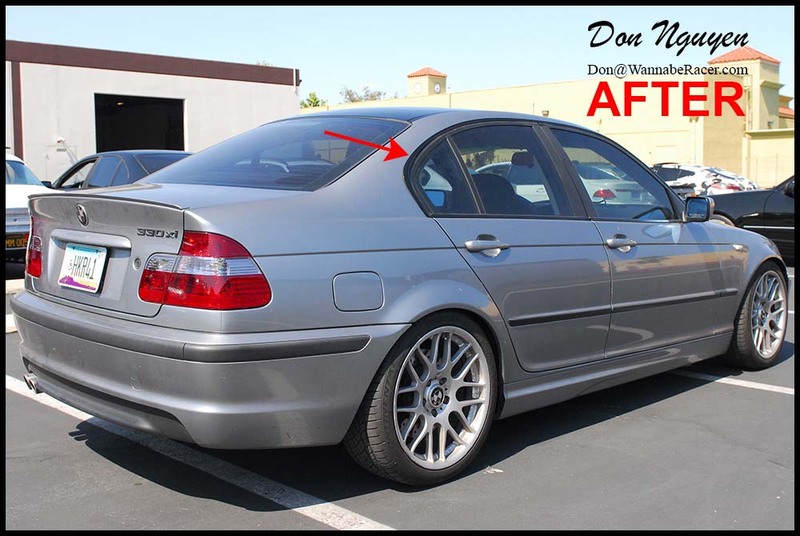 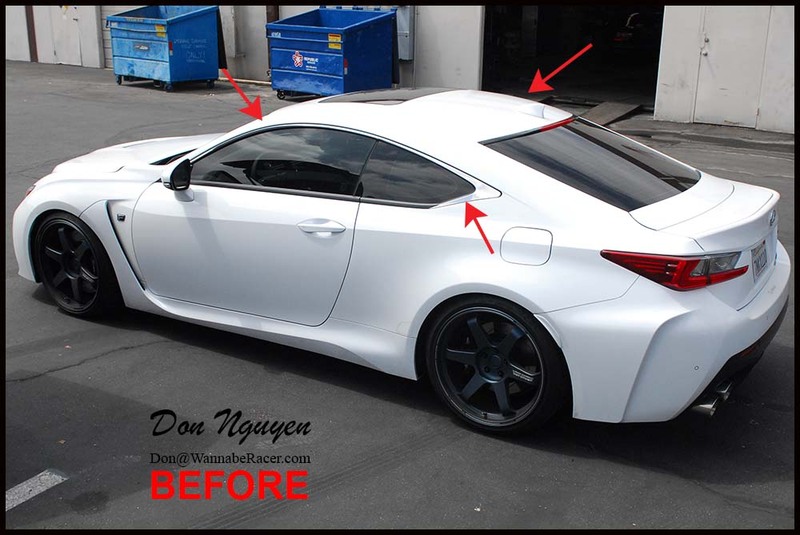 I always enjoy how a simple thing such as a gloss black roof wrap and blacking out the chrome on a car can completely change the look of the car, but still retain an OEM / factory look and not look aftermarket or overly modified. 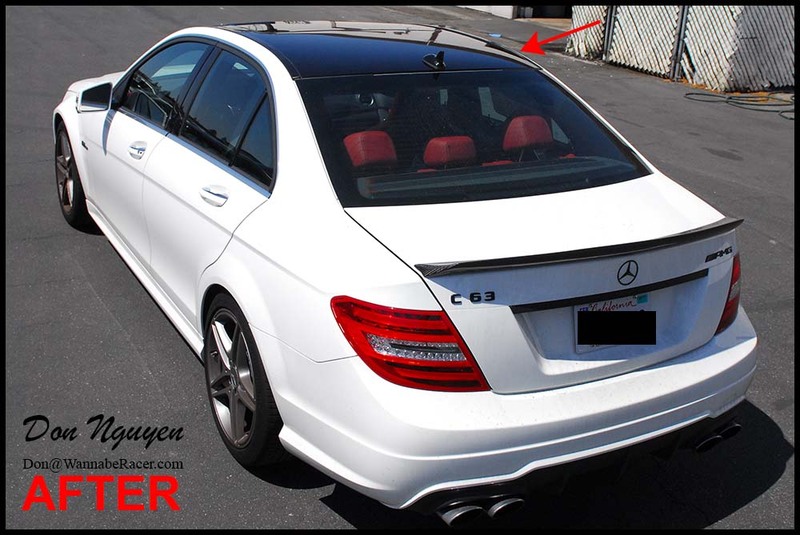 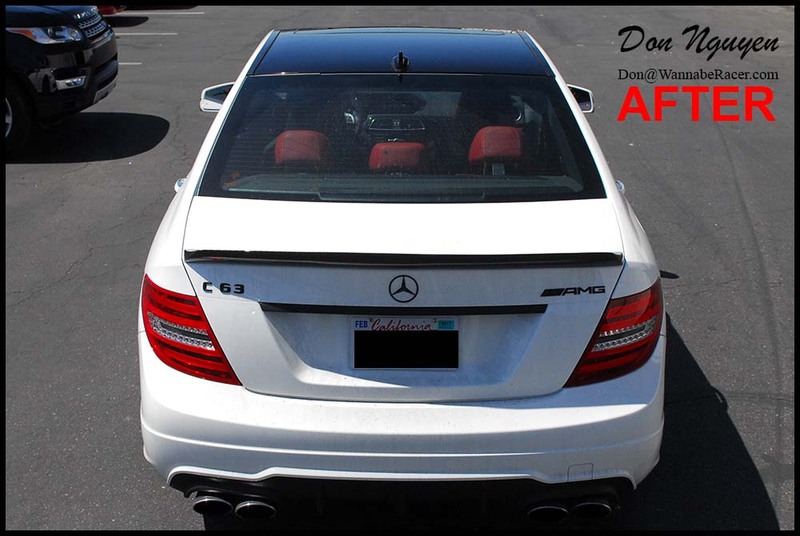 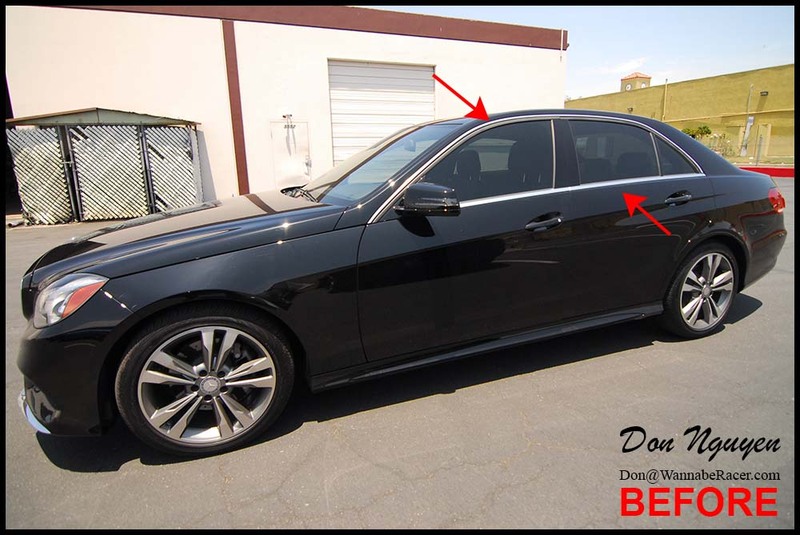 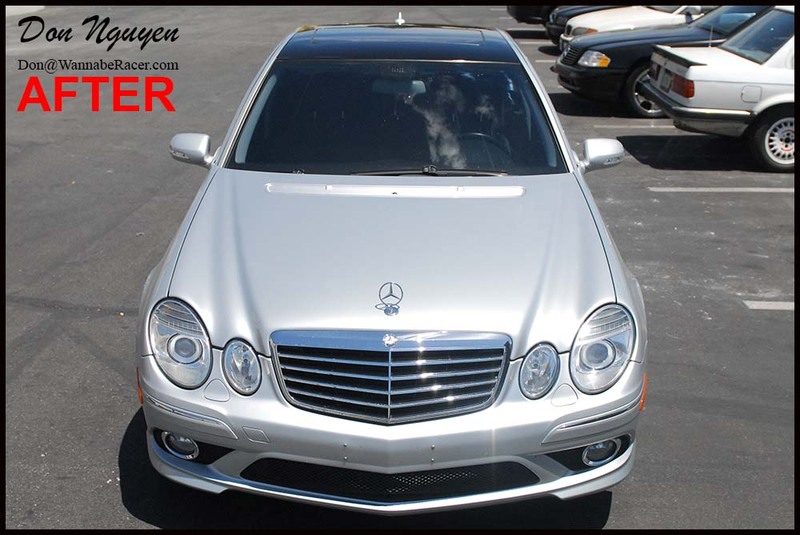 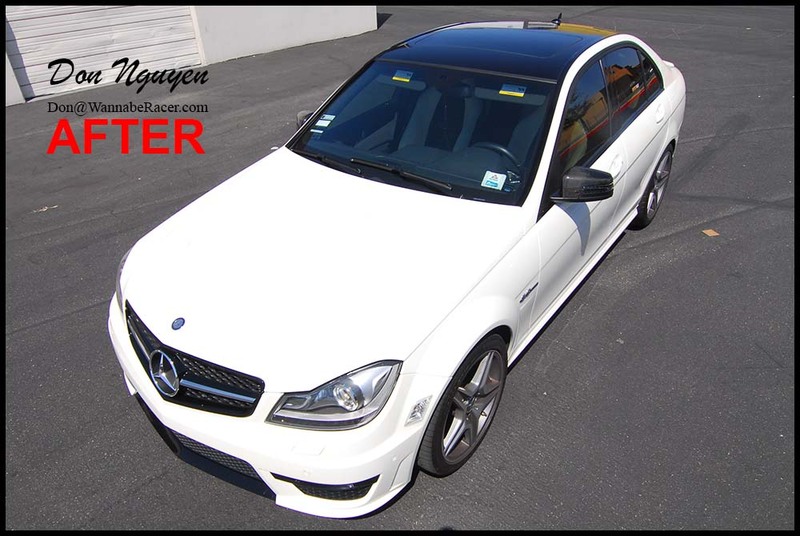 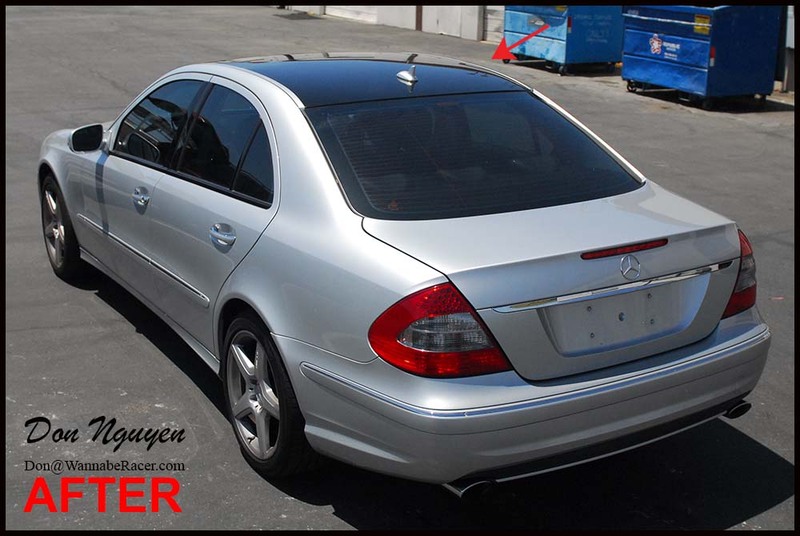 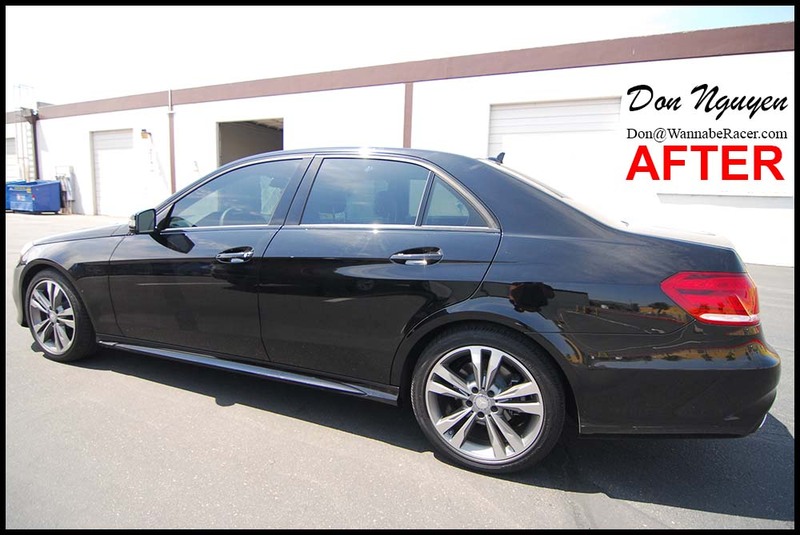 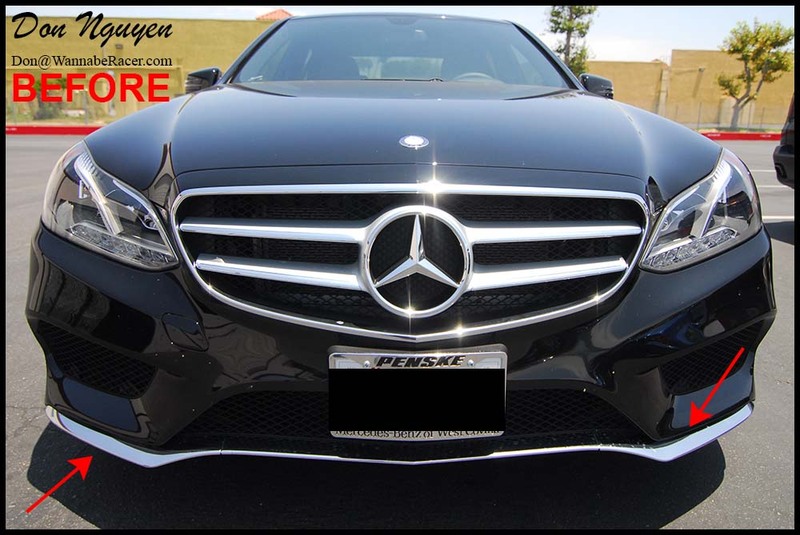 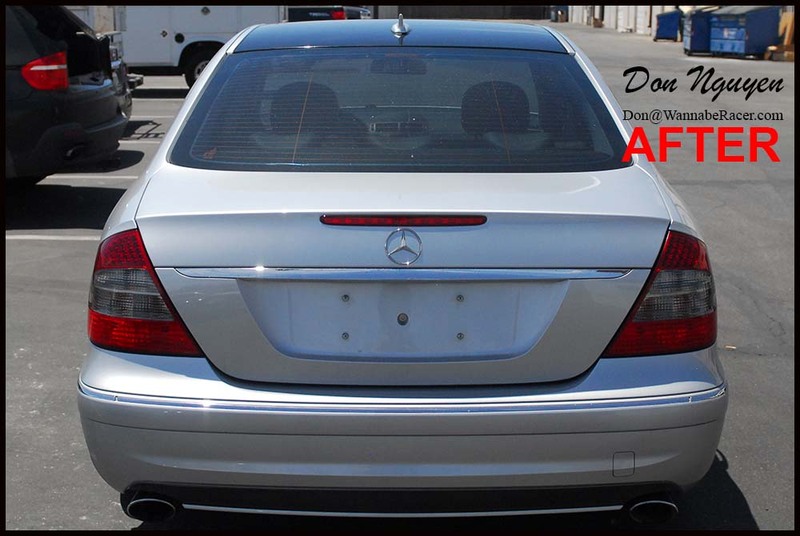 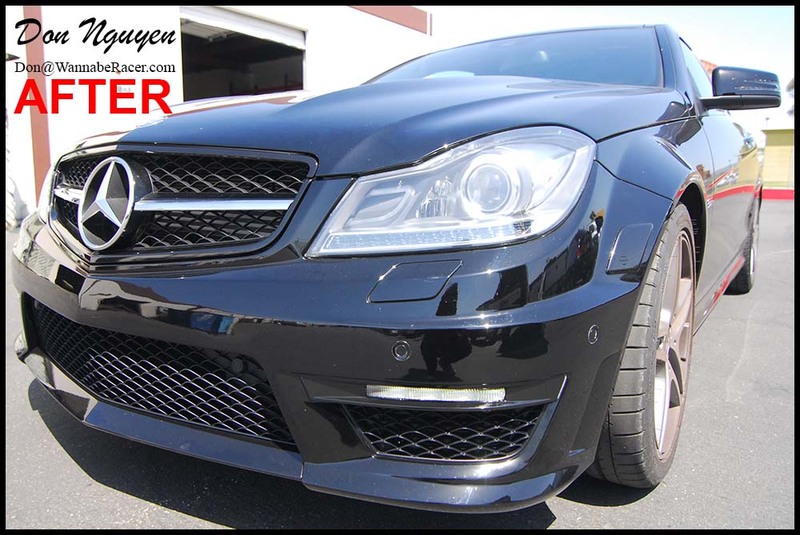 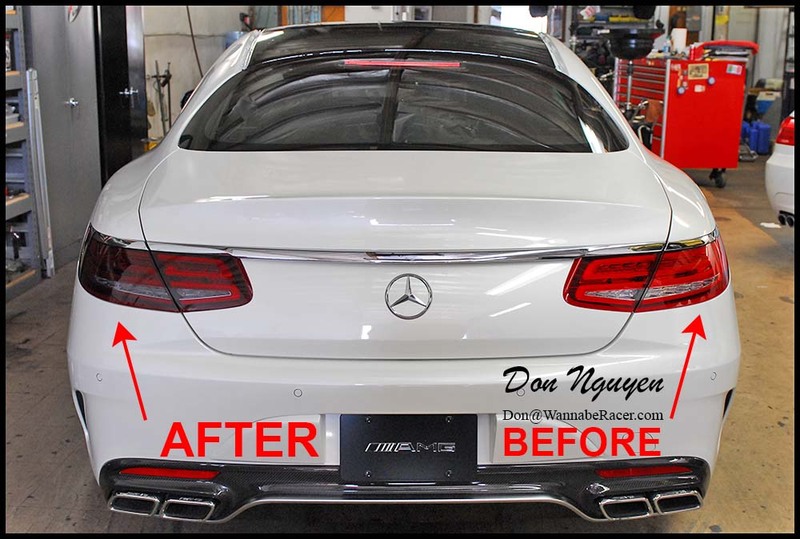 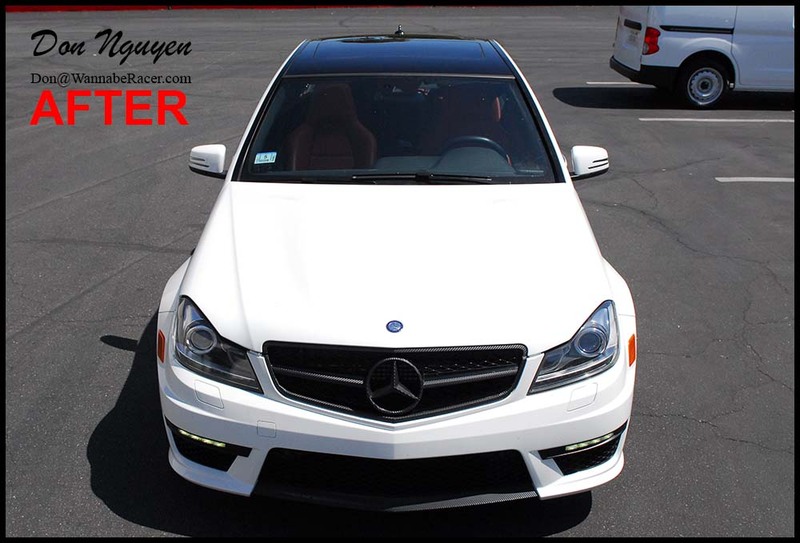 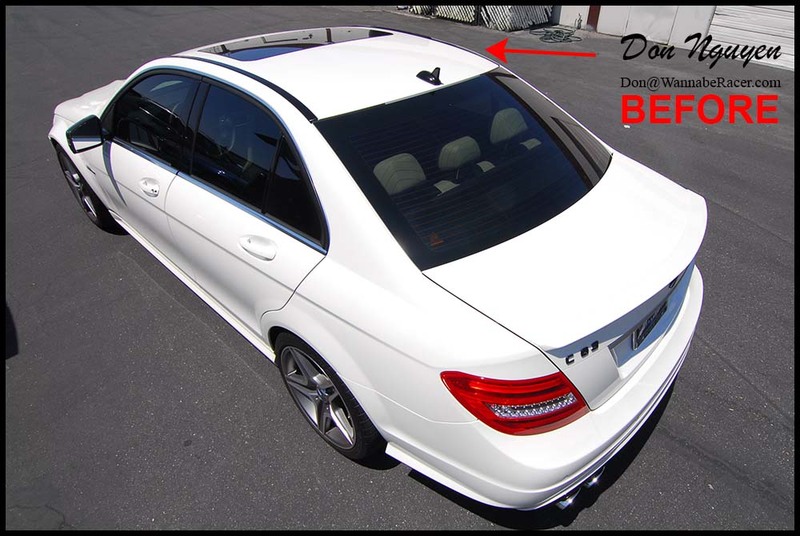 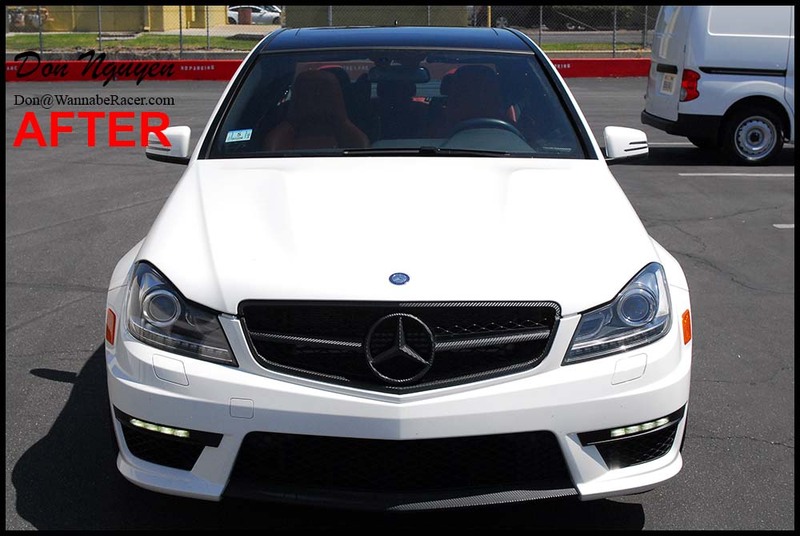 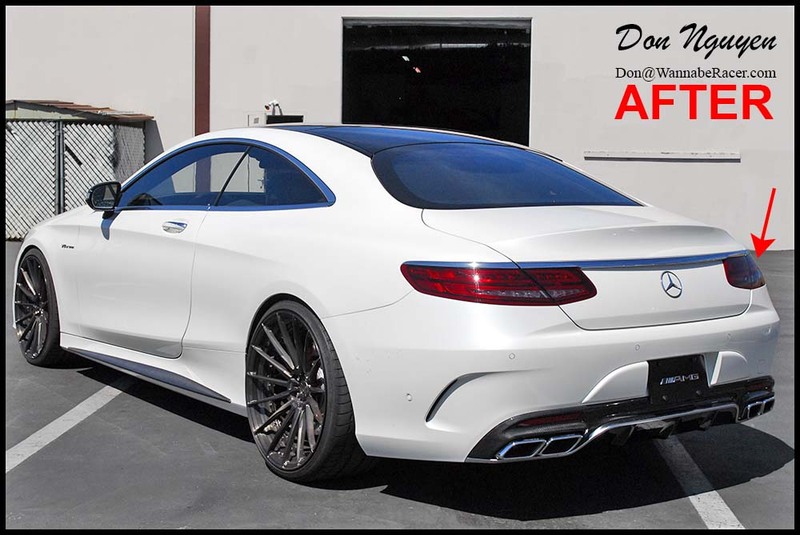 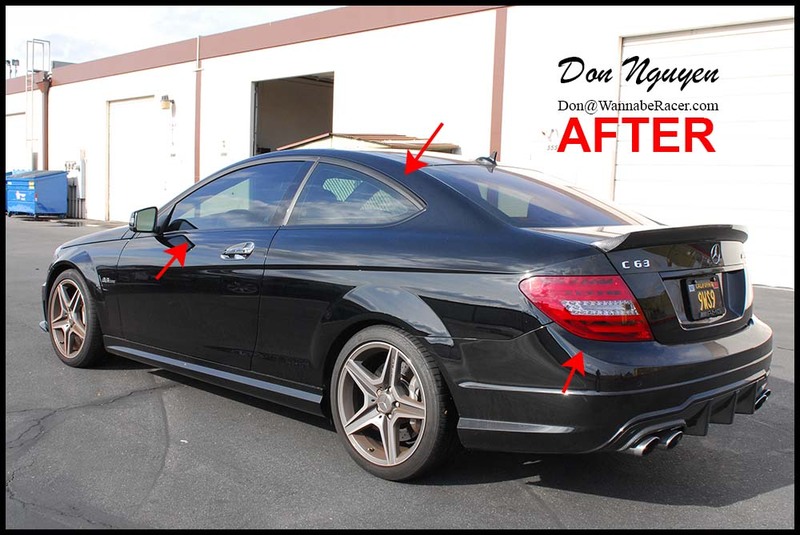 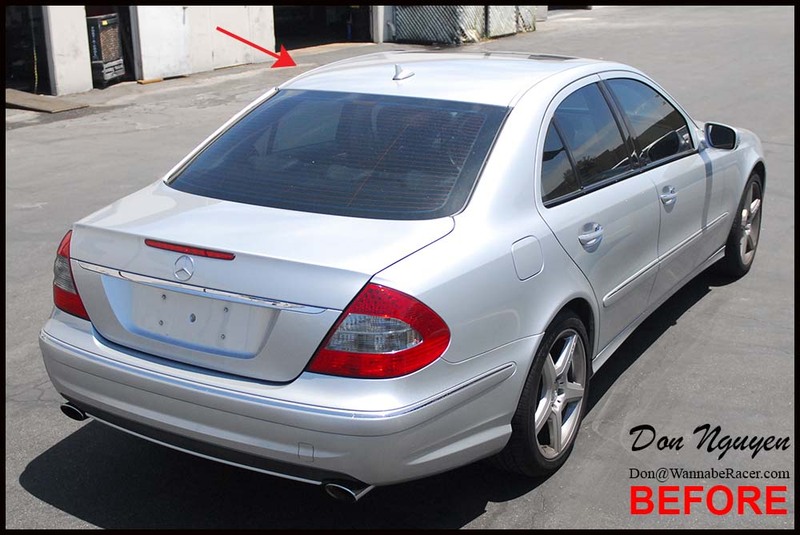 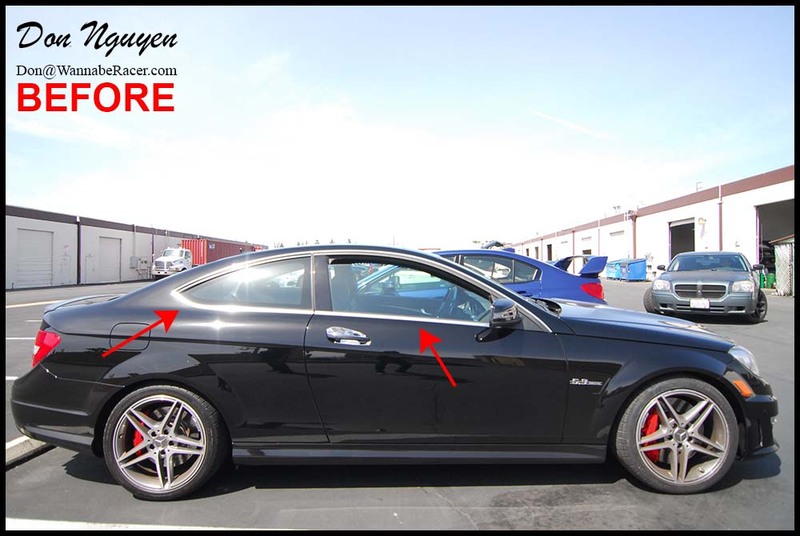 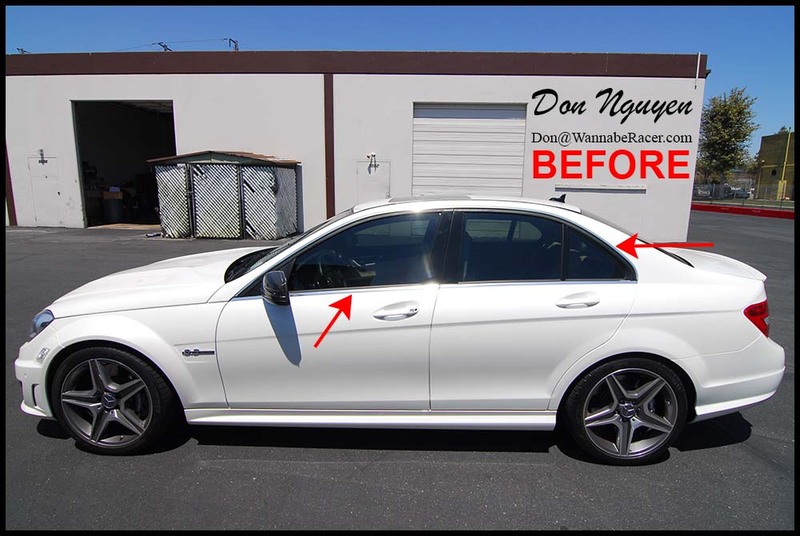 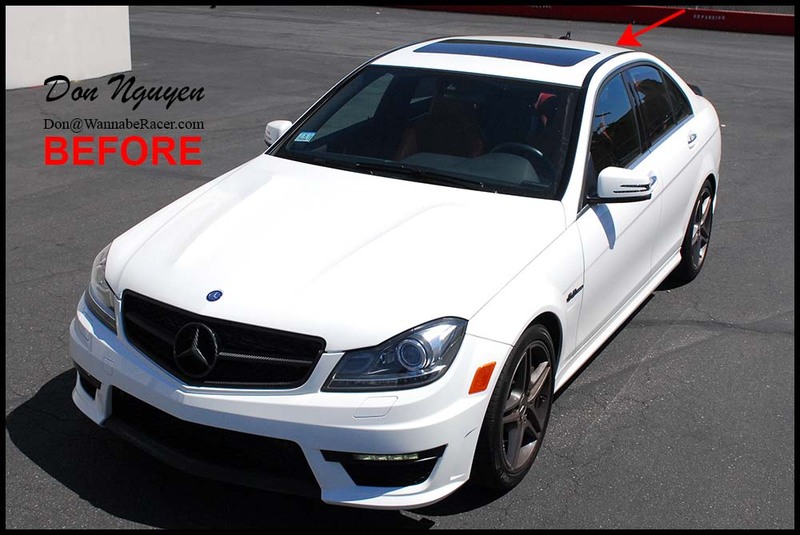 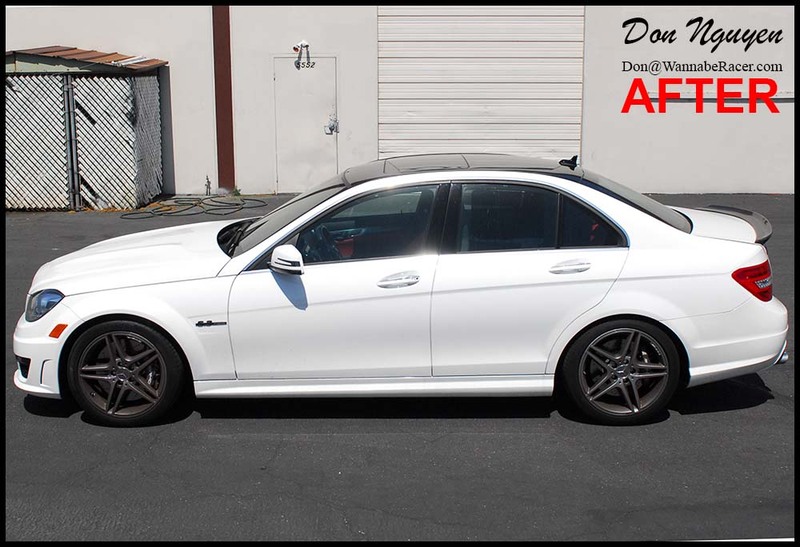 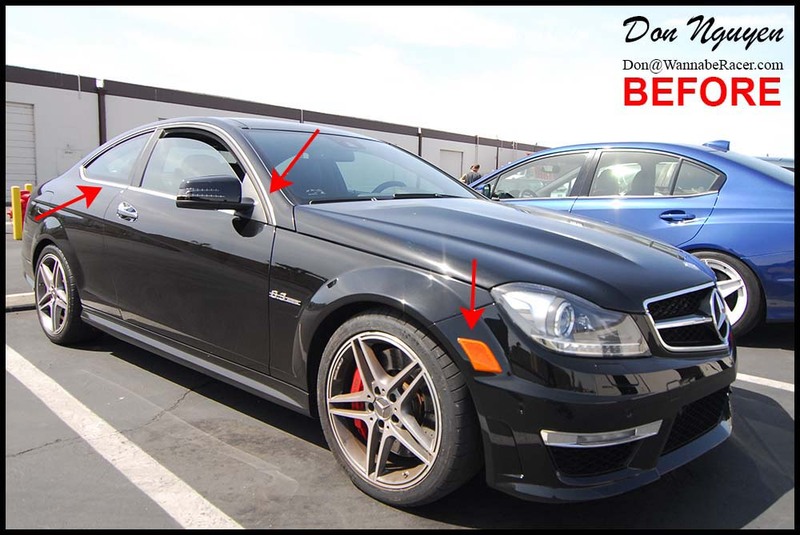 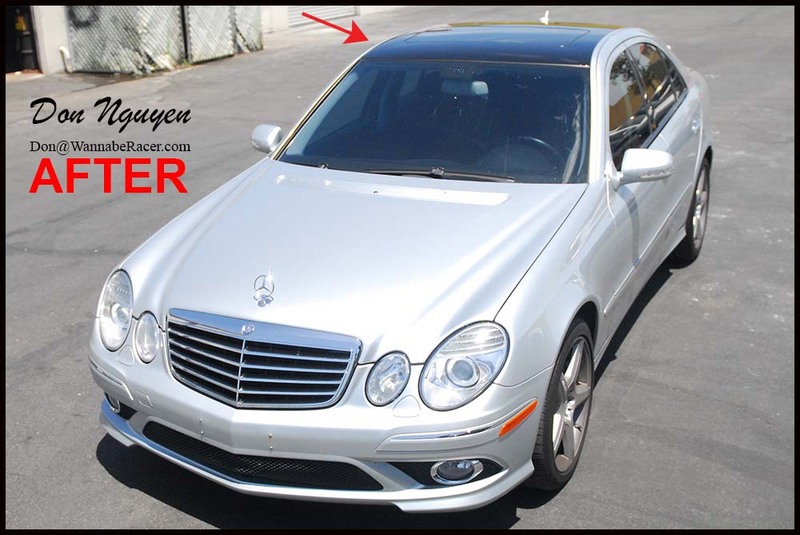 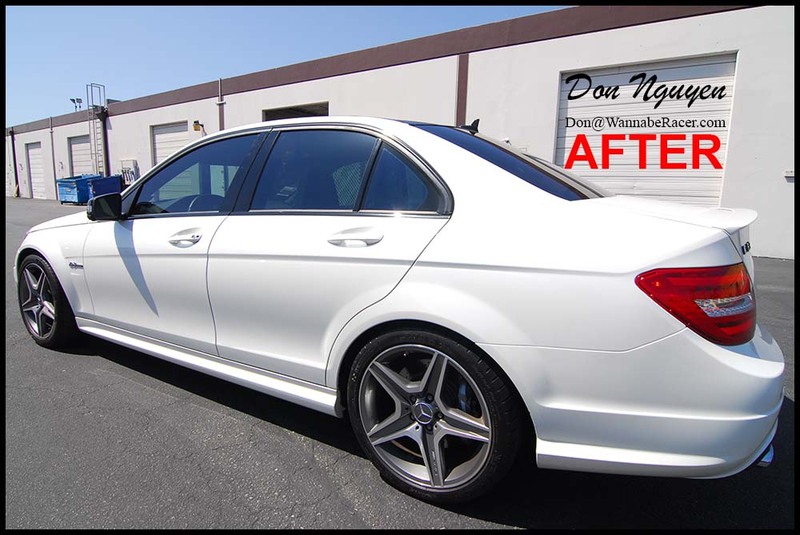 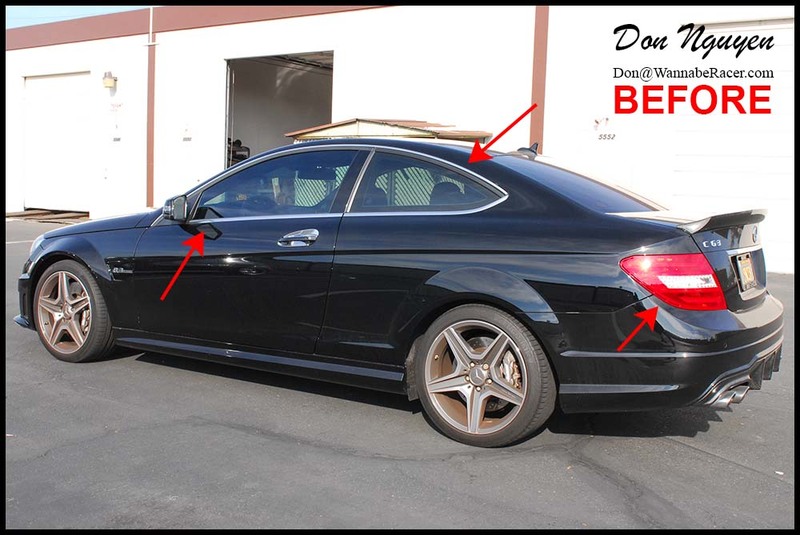 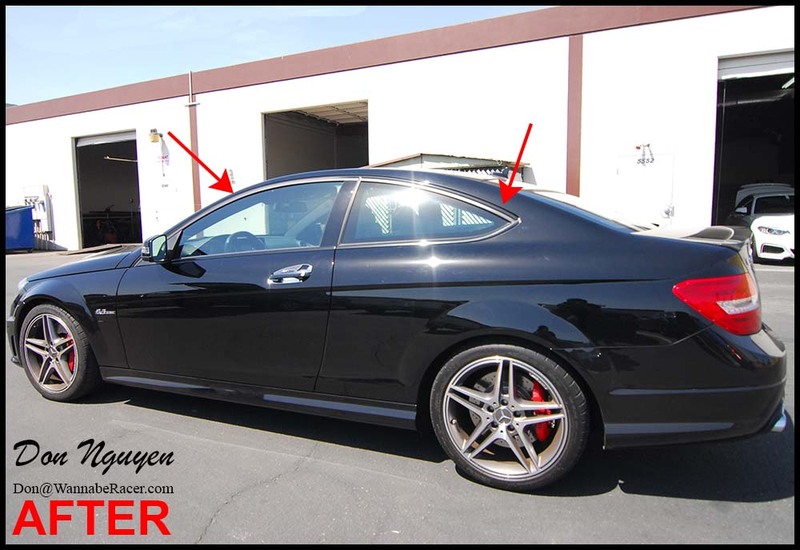 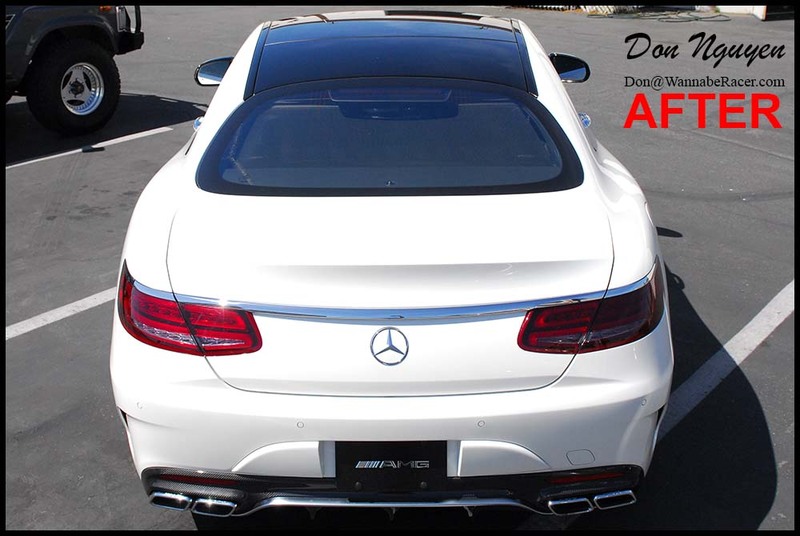 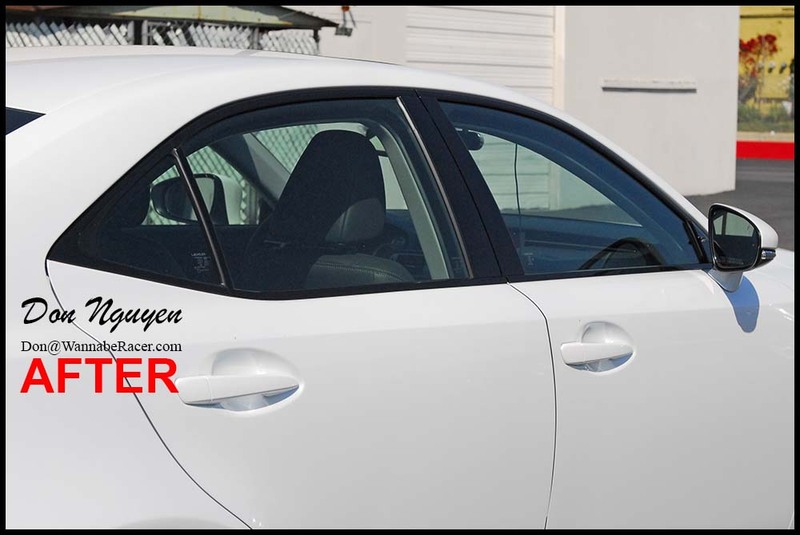 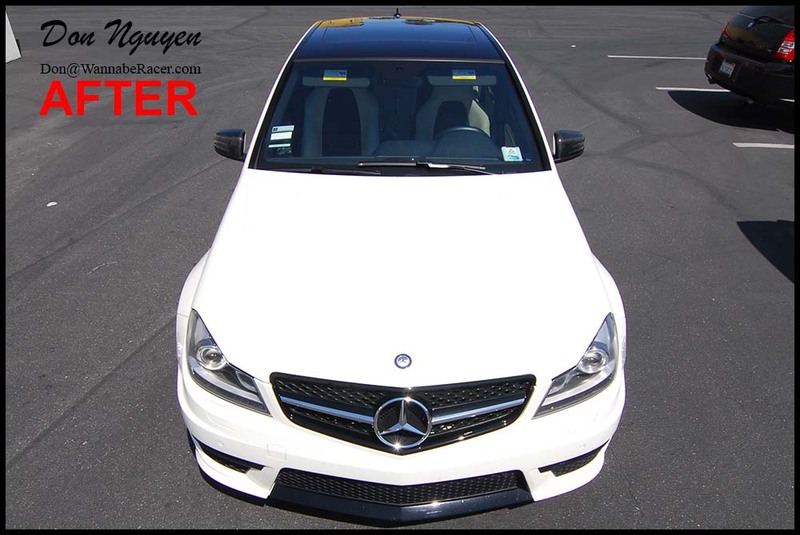 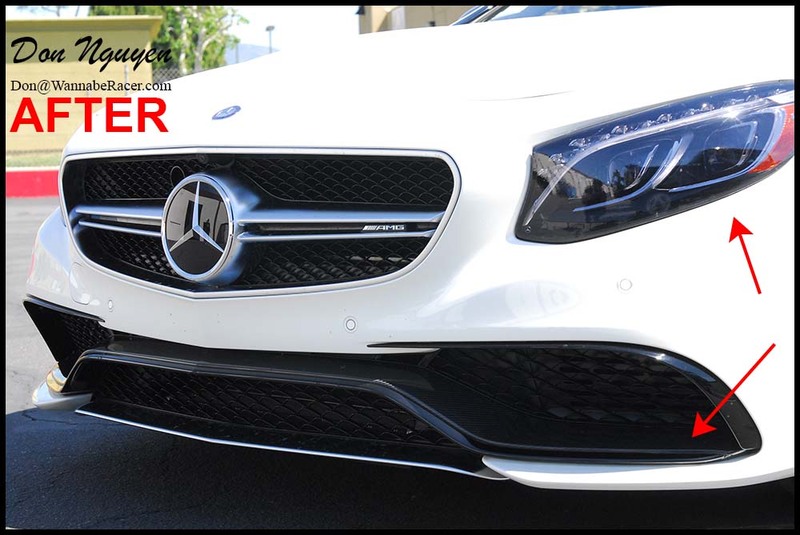 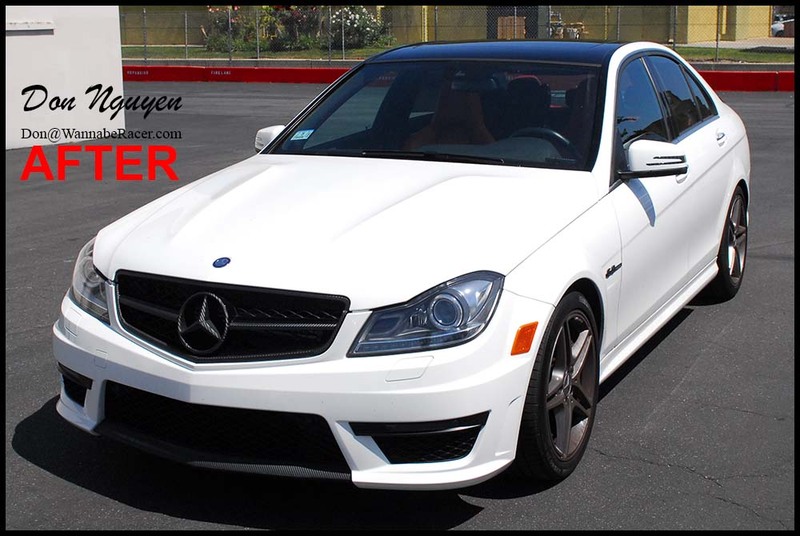 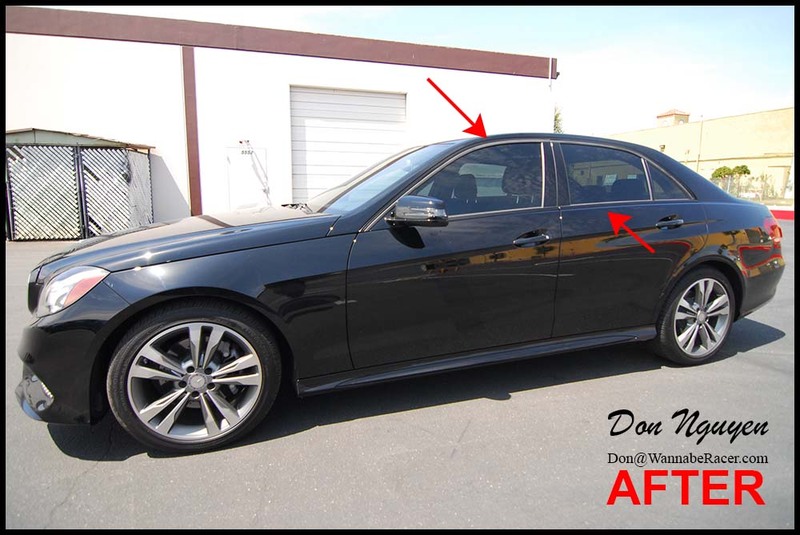 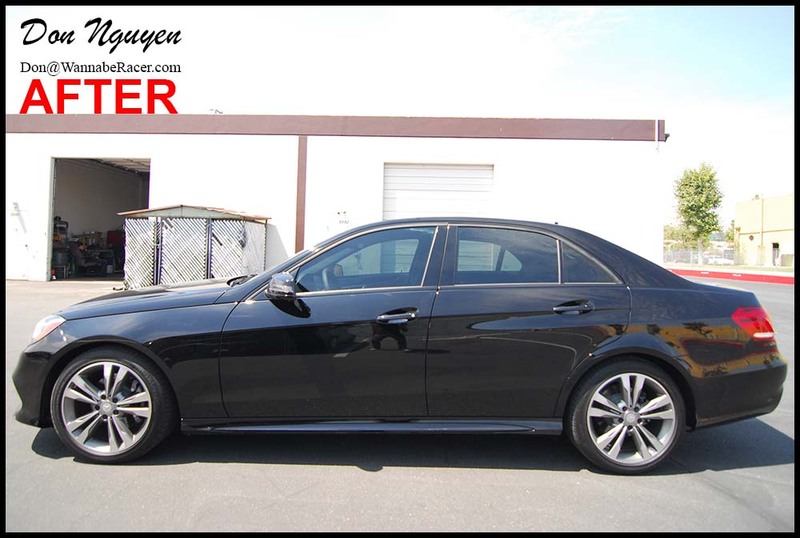 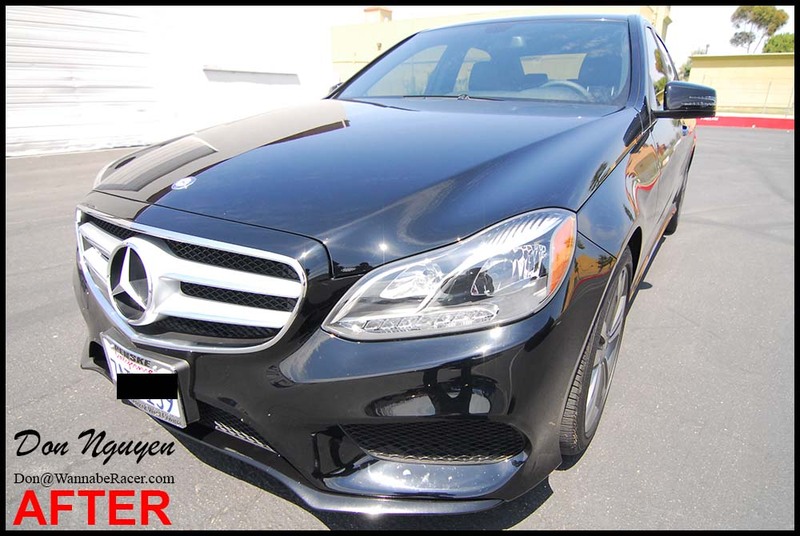 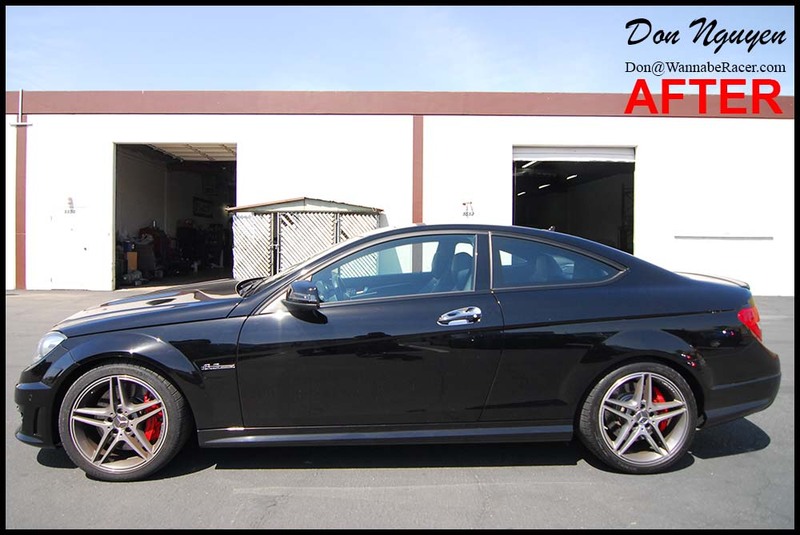 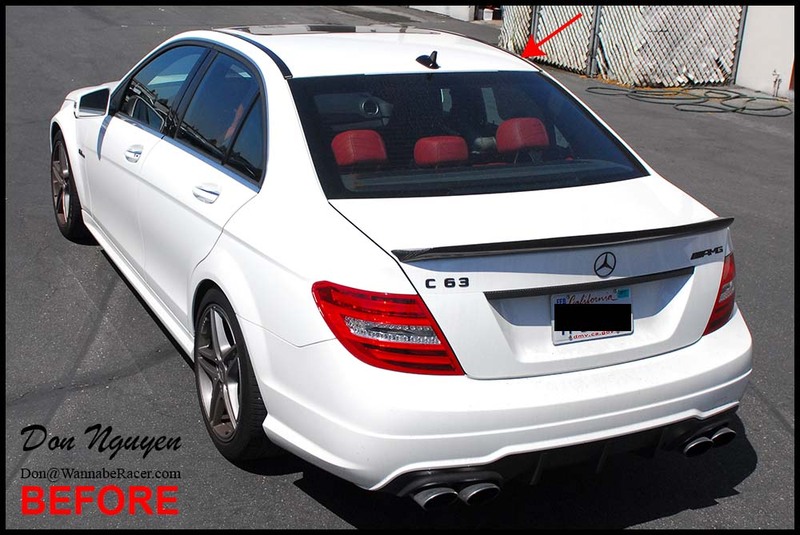 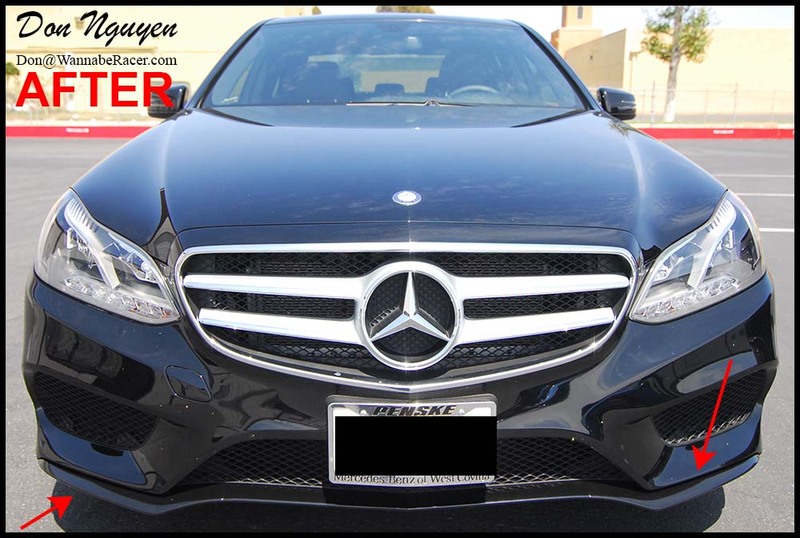 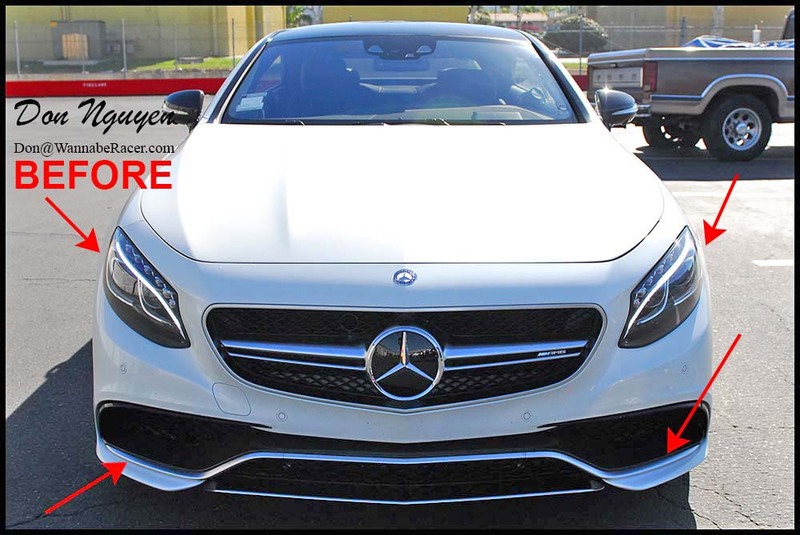 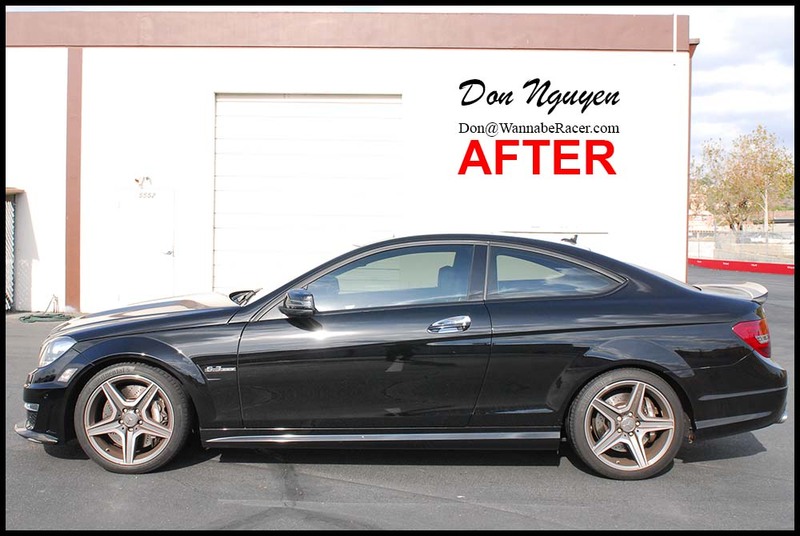 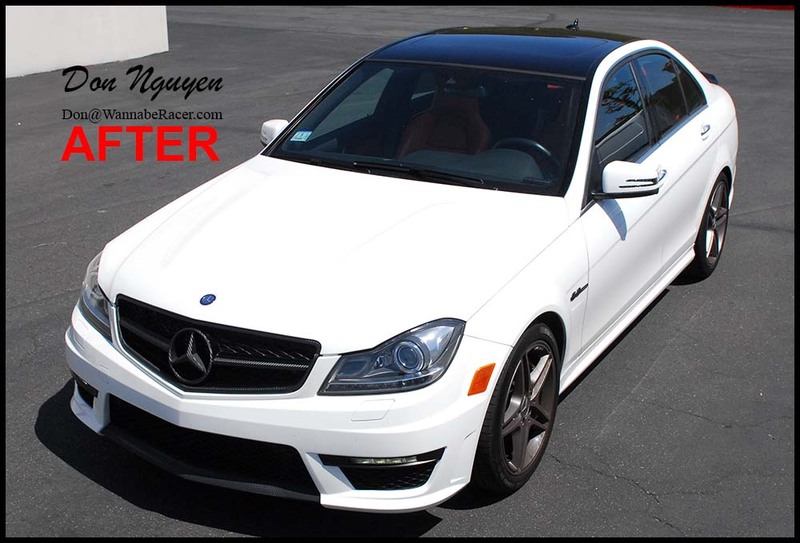 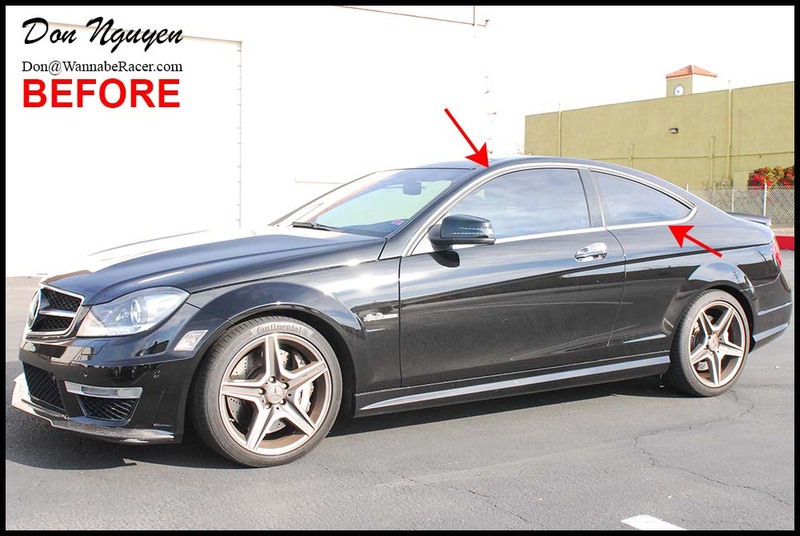 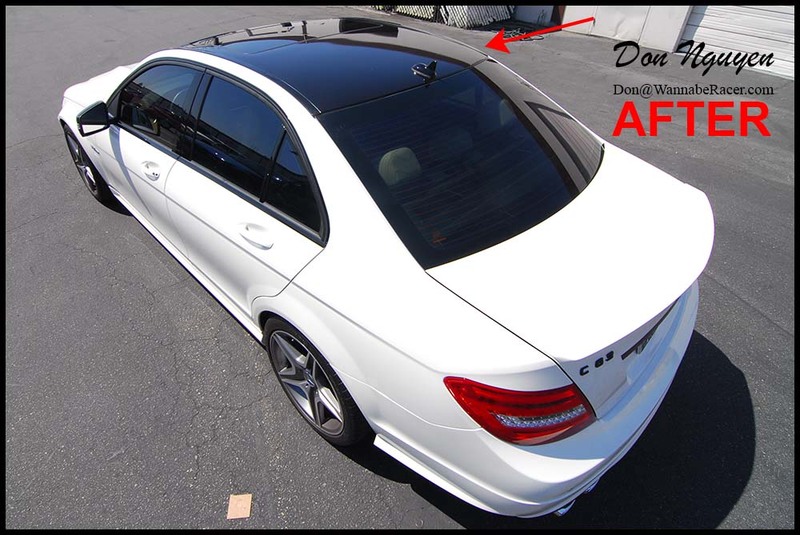 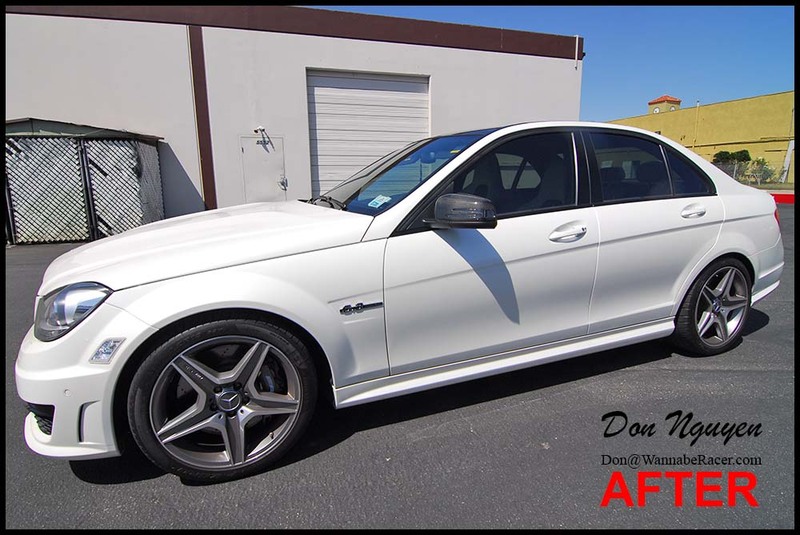 For this white Mercedes Benz C63 sedan, we went with a gloss black roof to give it the panoramic roof look and also gloss black on the chrome window trim pieces to match, similar to what Mercedes also offers from the factory on some newer models as well now. 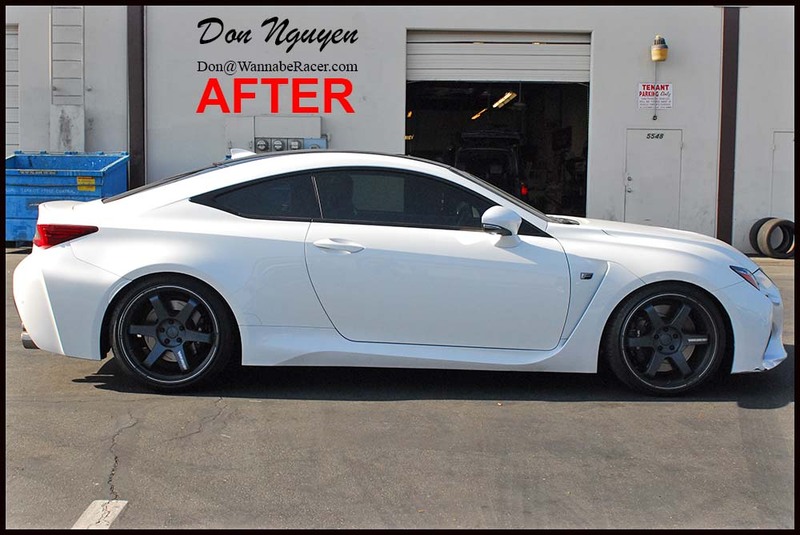 the owner of this car was from San Diego and came up to me in Anaheim Hills / Orange County to have the vinyl wrap work done. 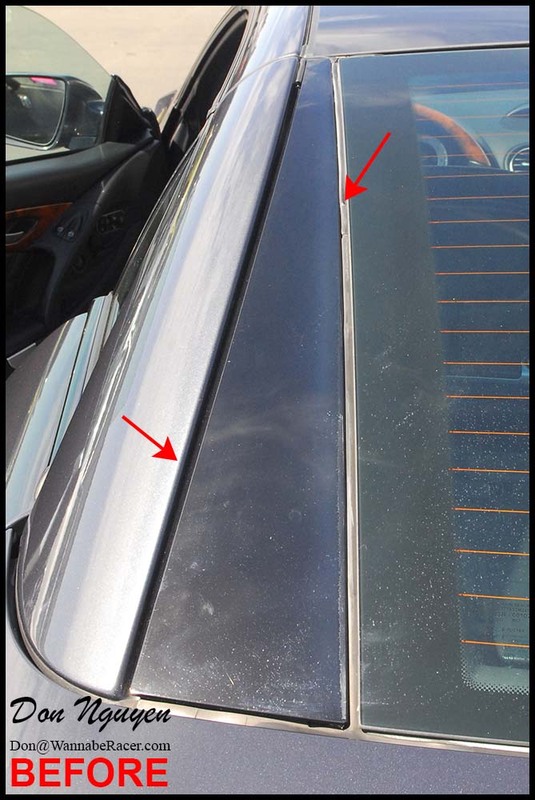 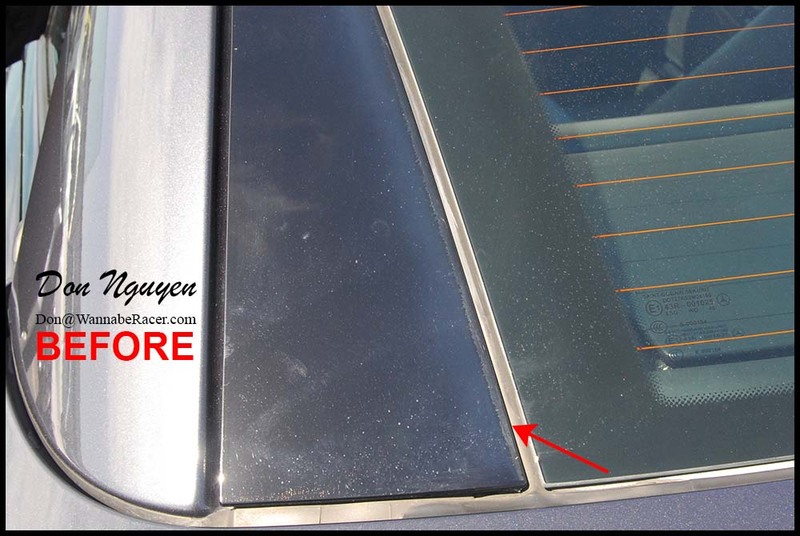 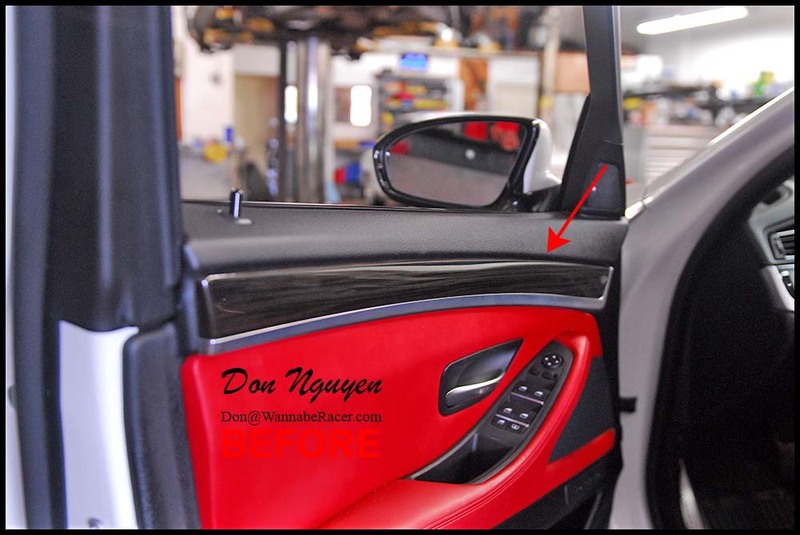 Had some requests for some more close up pictures of the area where the trim meets the rubber weather stripping. 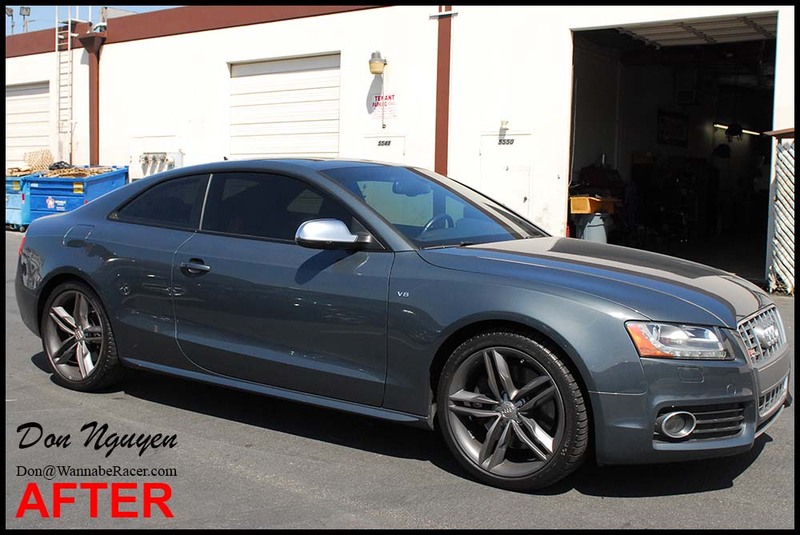 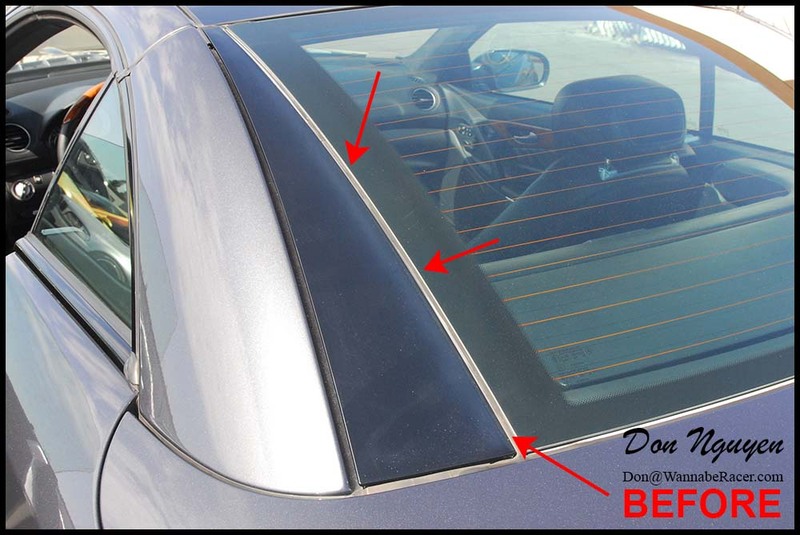 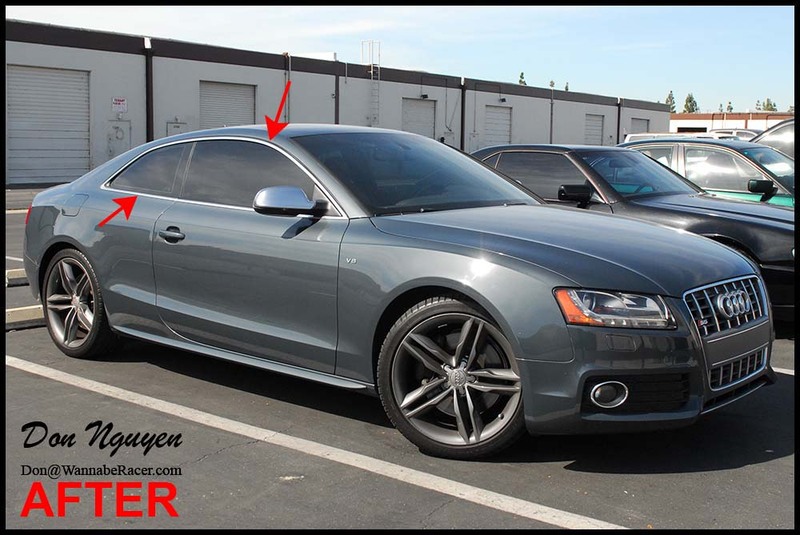 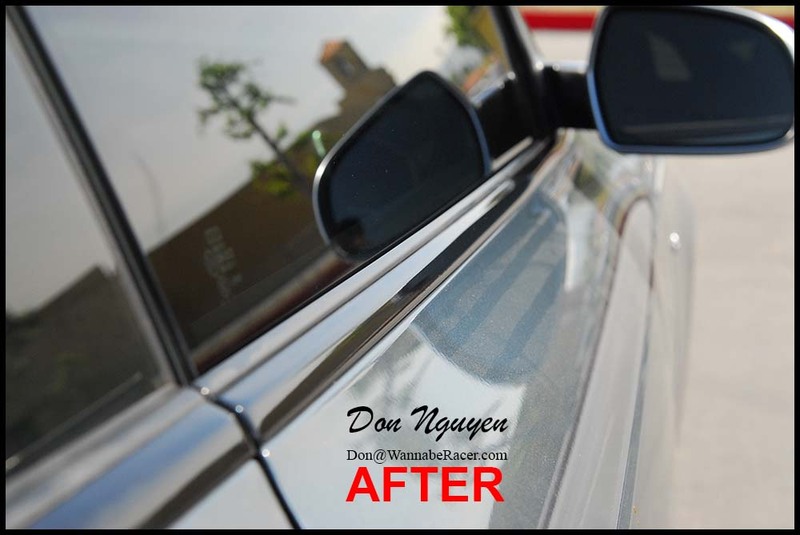 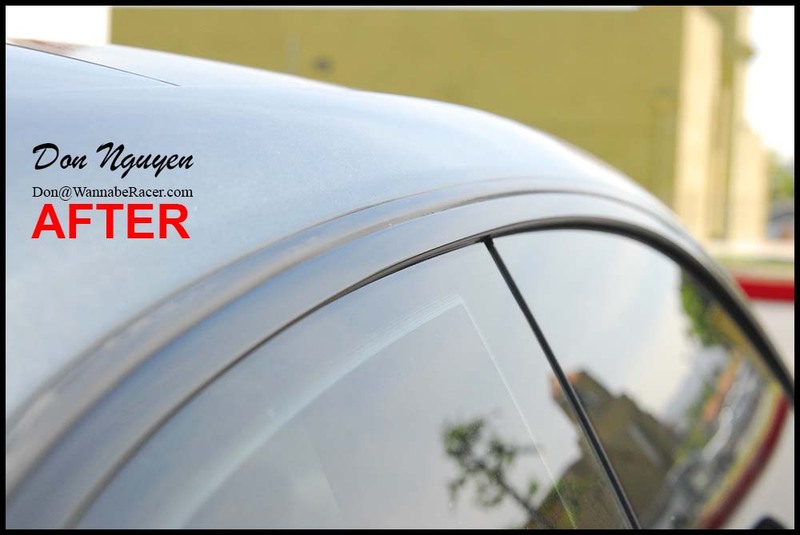 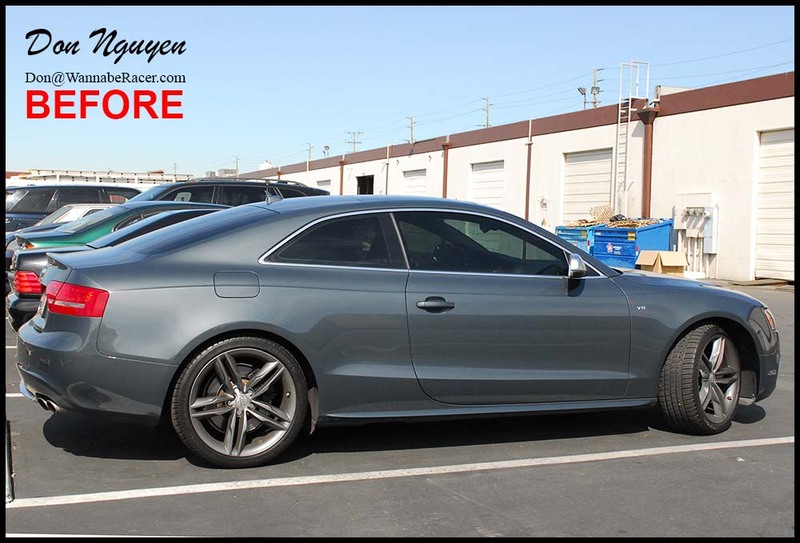 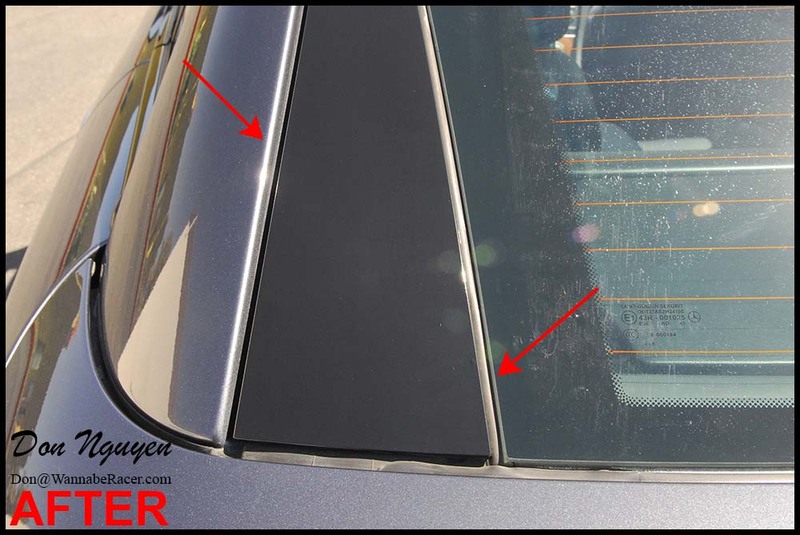 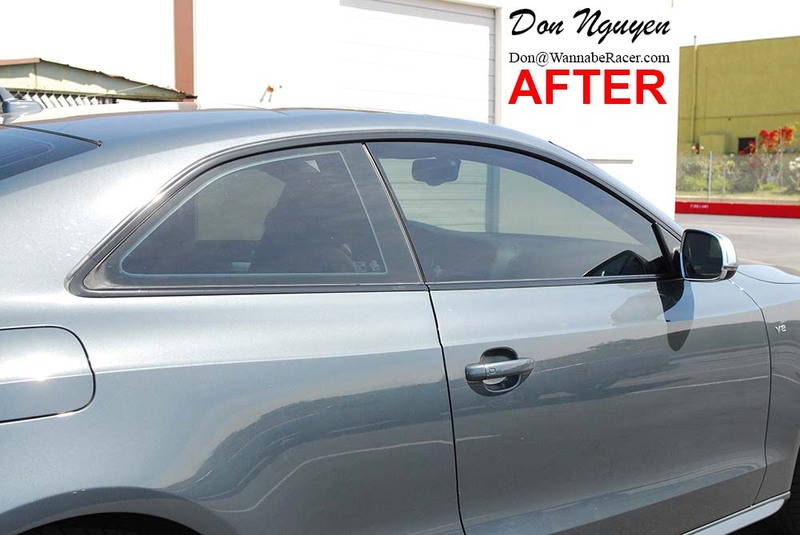 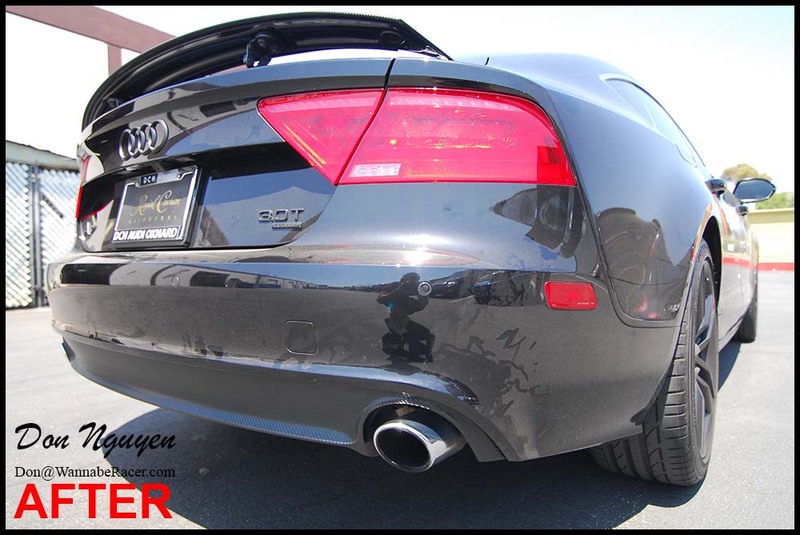 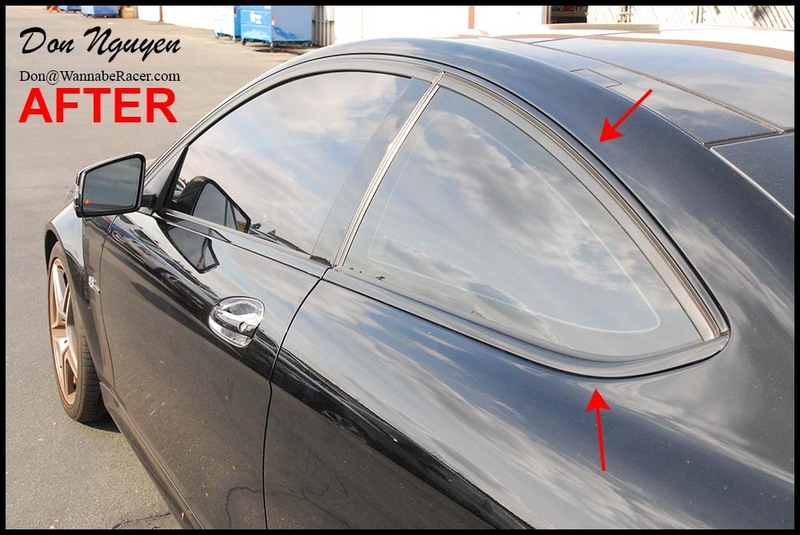 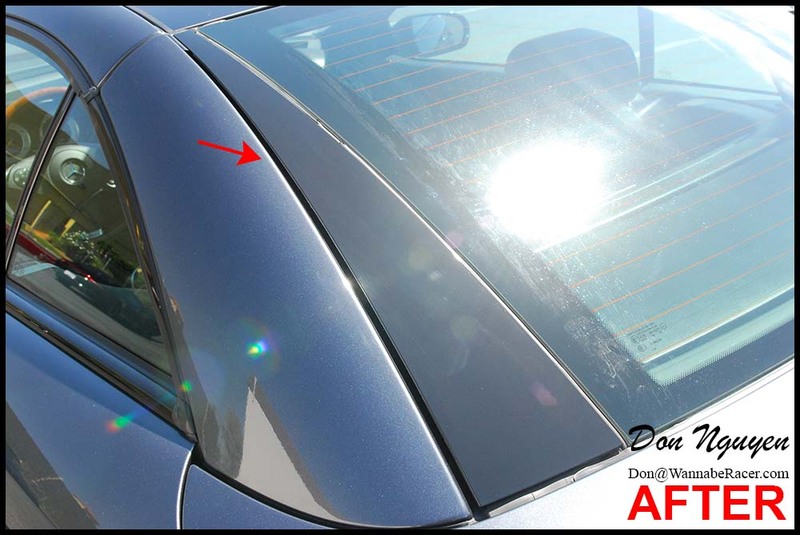 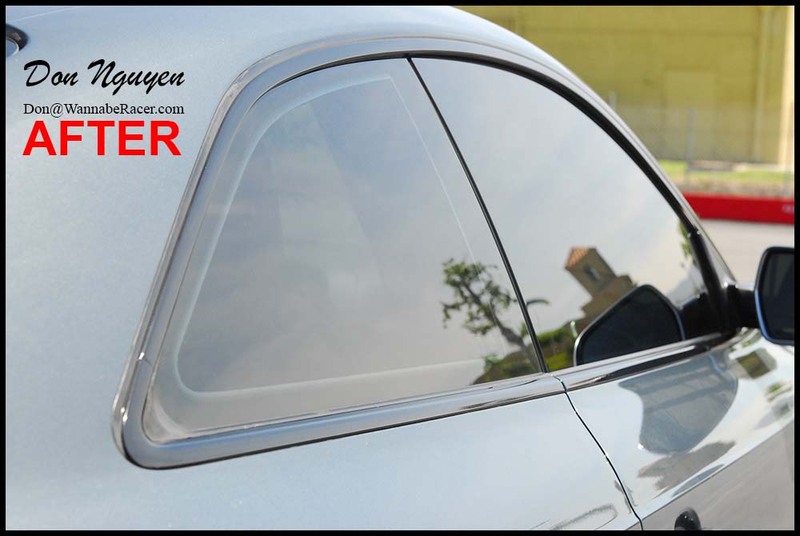 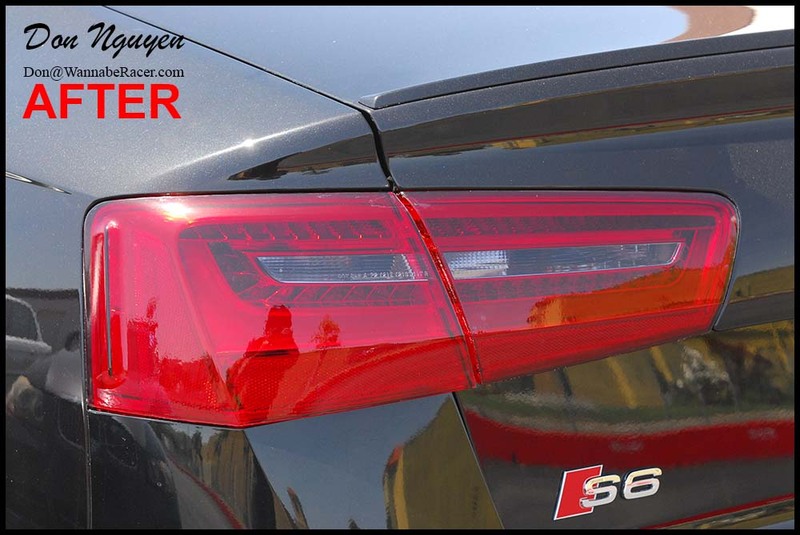 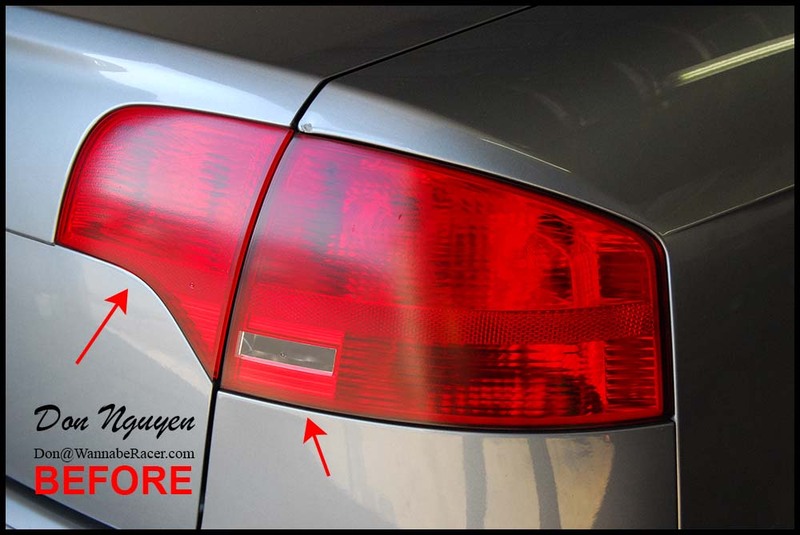 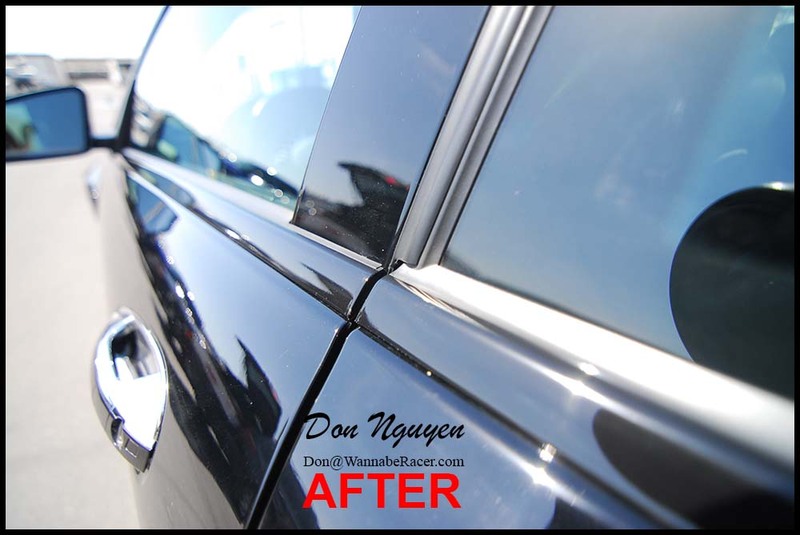 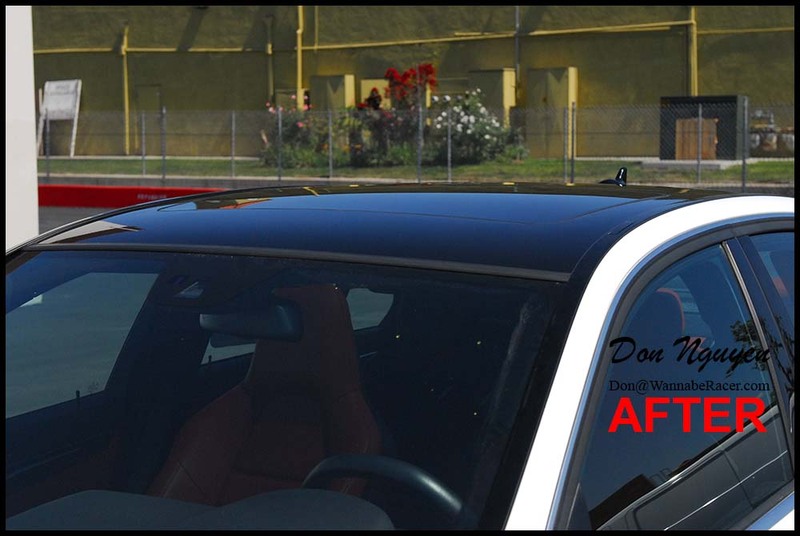 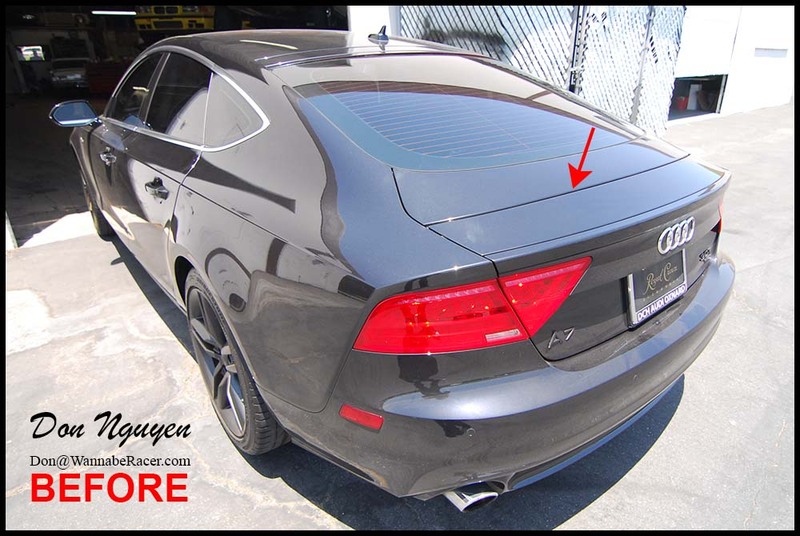 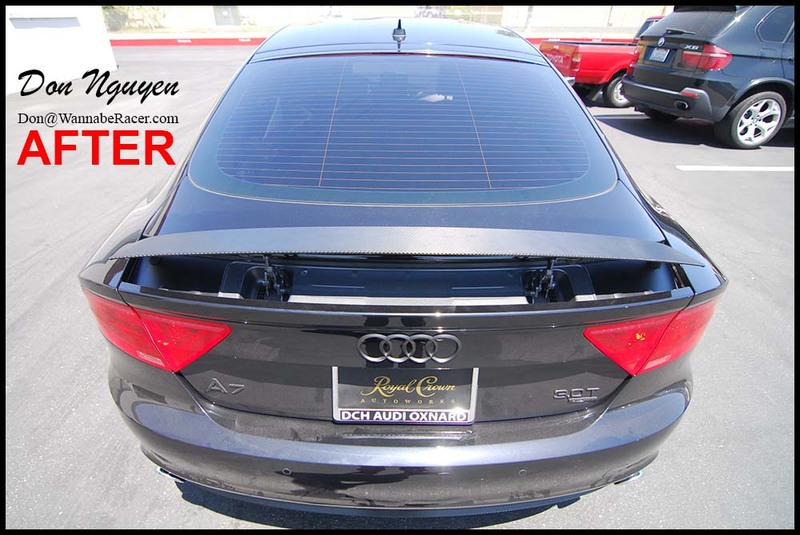 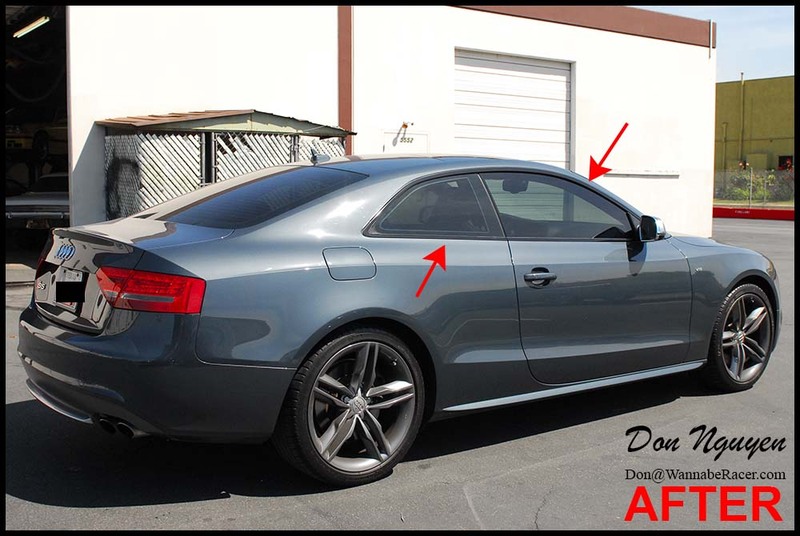 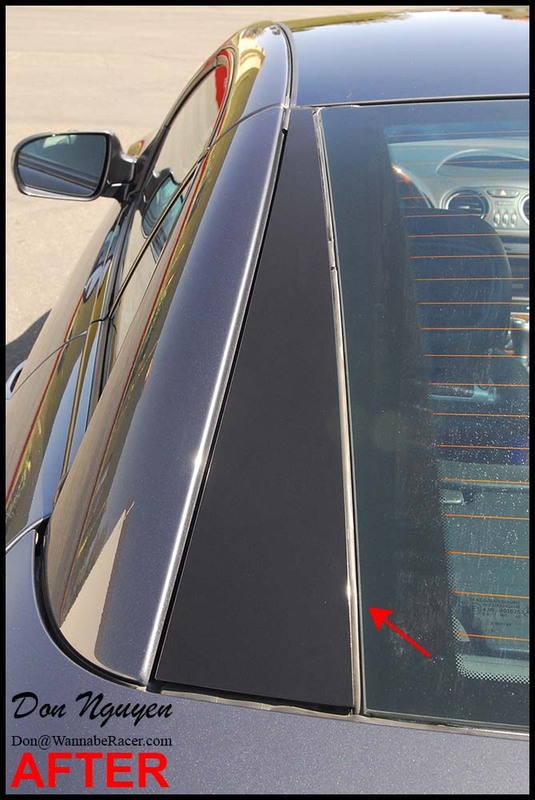 For this grey Audi A5 coupe, I blacked out the chrome window trim on the car with my gloss black vinyl material. 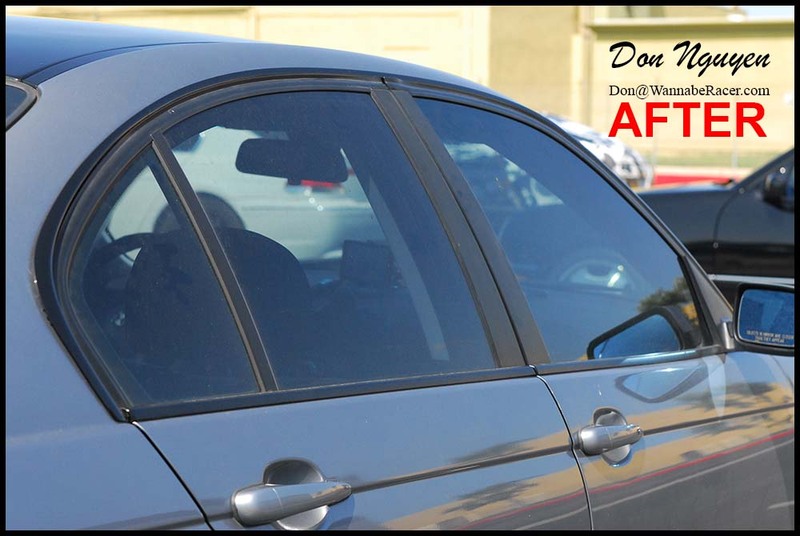 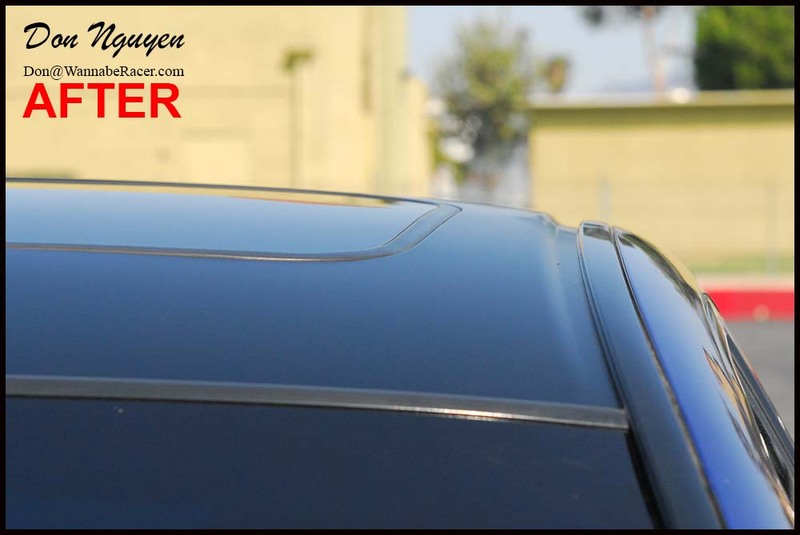 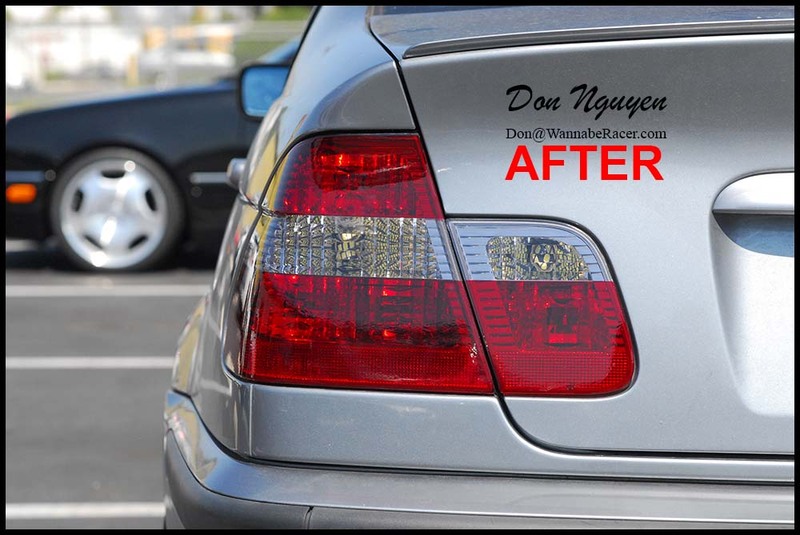 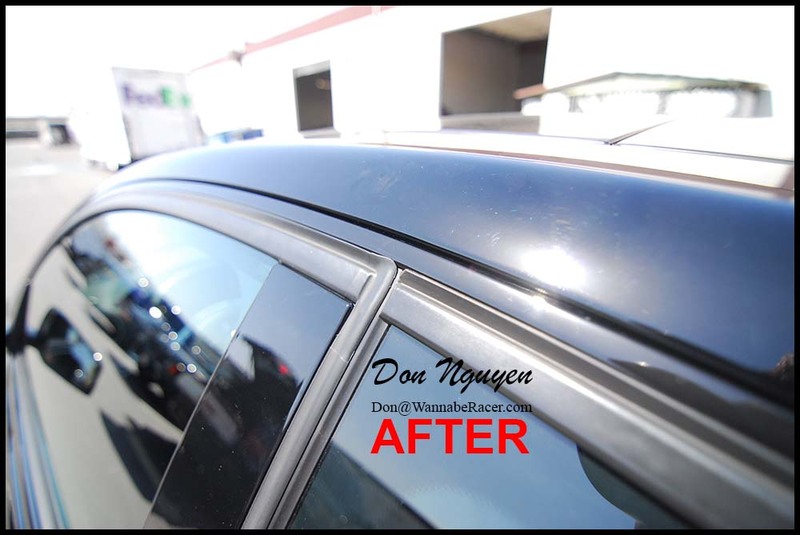 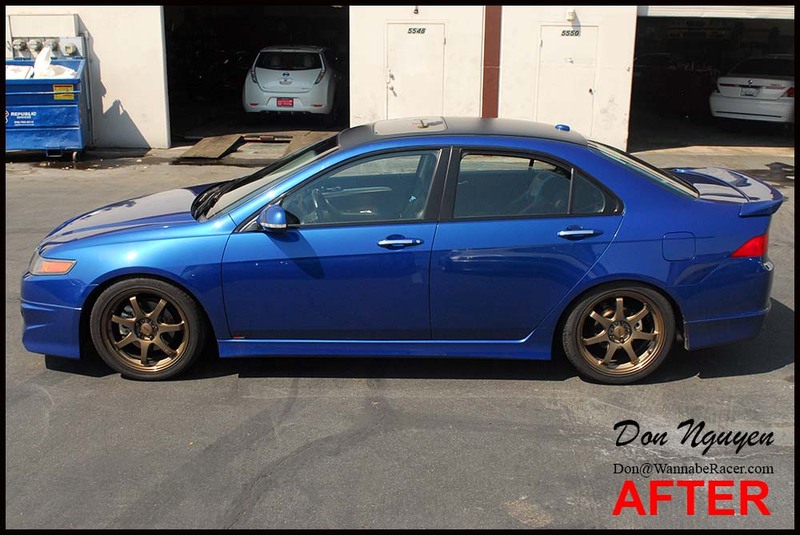 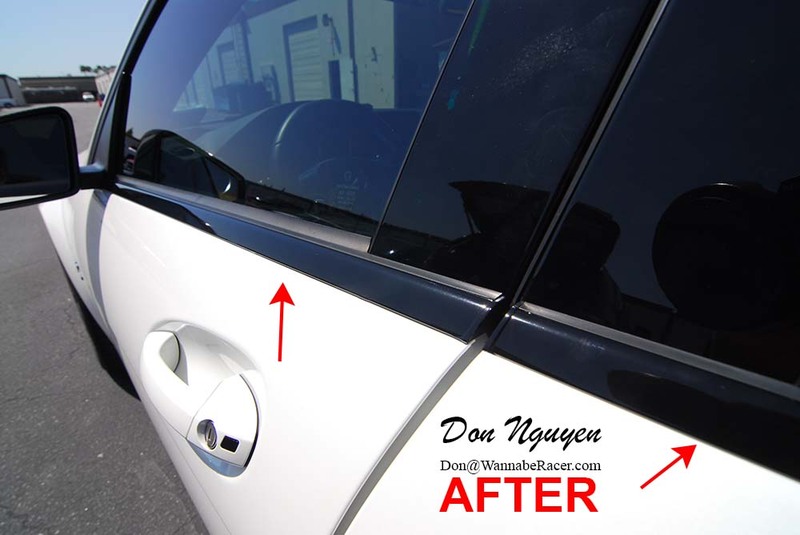 The owner of the car came out to me from Los Angeles / Torrance area to Anaheim Hills / Orange County to have the vinyl work done. 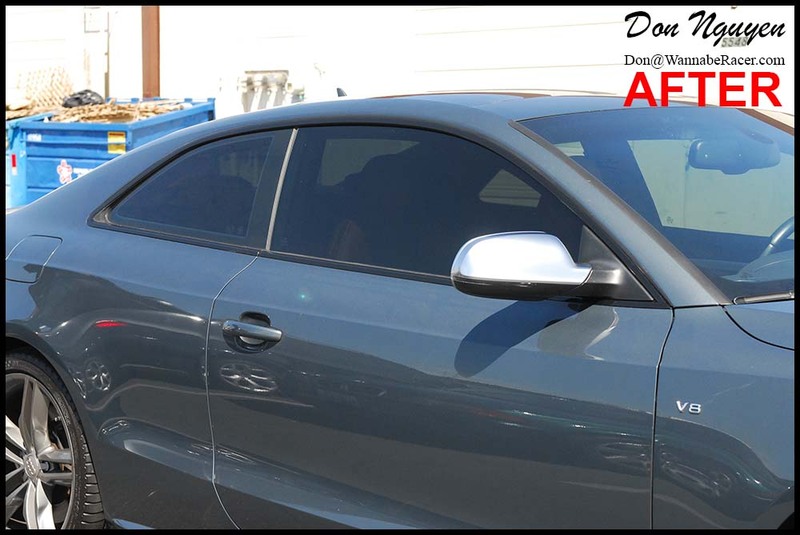 We went with gloss over matte to blend with the tinted windows better and also match the black optics package that Audi now offers on some of their cars. 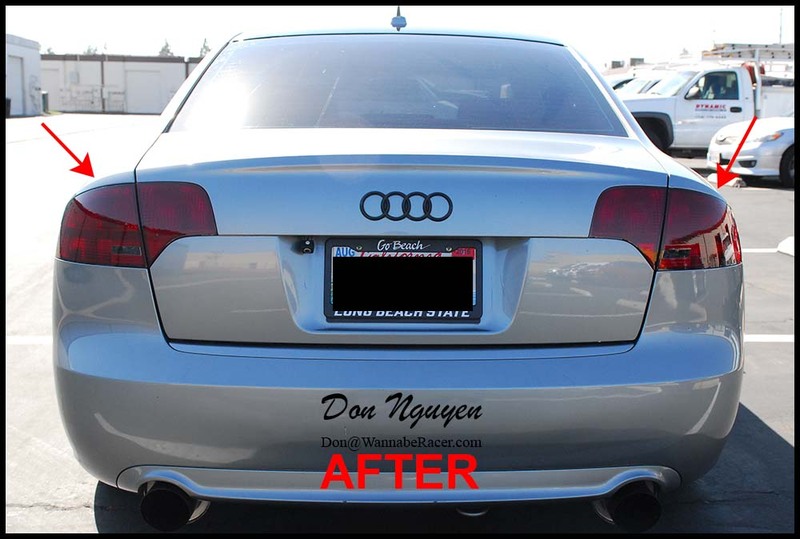 This is a previous customer of mine that had some vinyl work done by me as well. 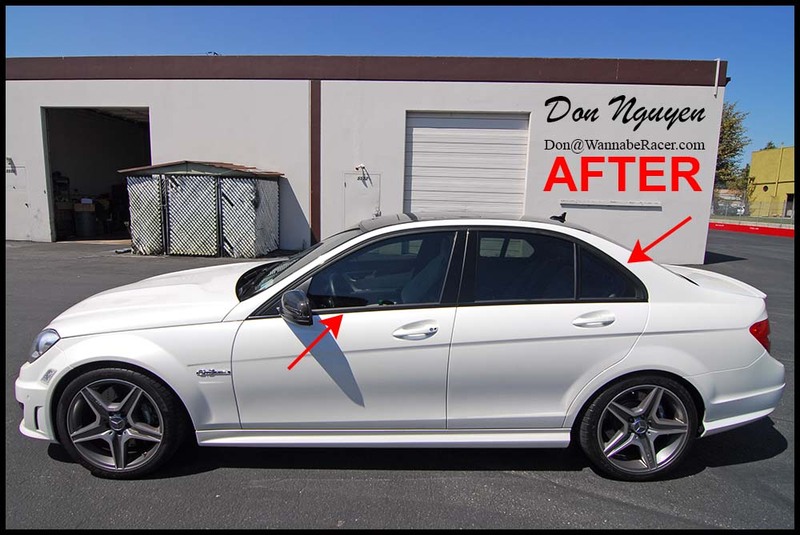 This time around, he brought by his white Mercedes Benz C63 AMG sedan to have me wrap the roof in my gloss black vinyl material. 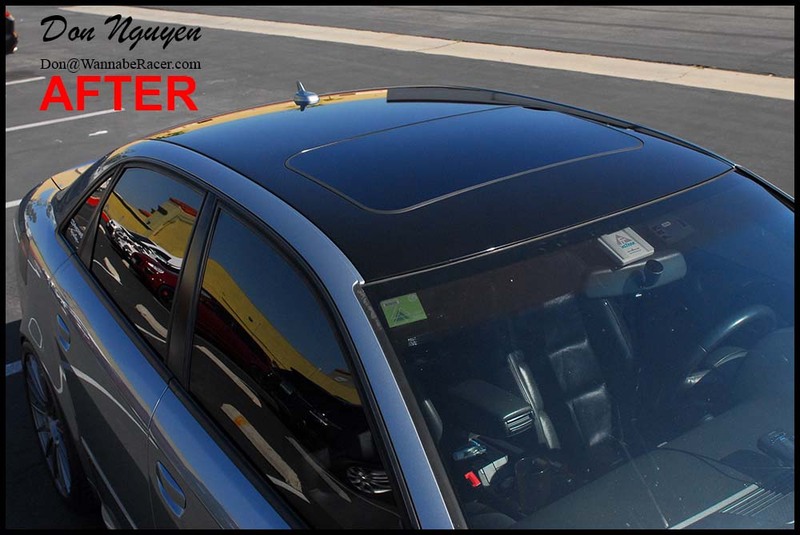 The gloss black blends in fairly well with the glass sunroof. 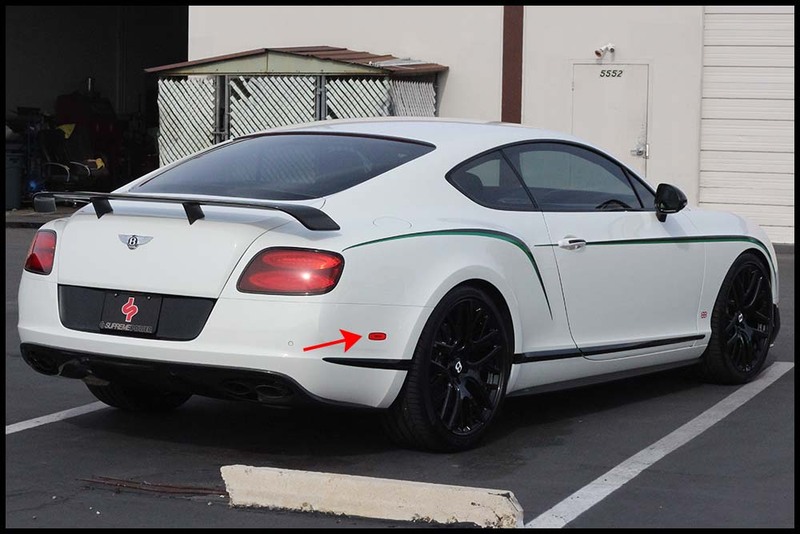 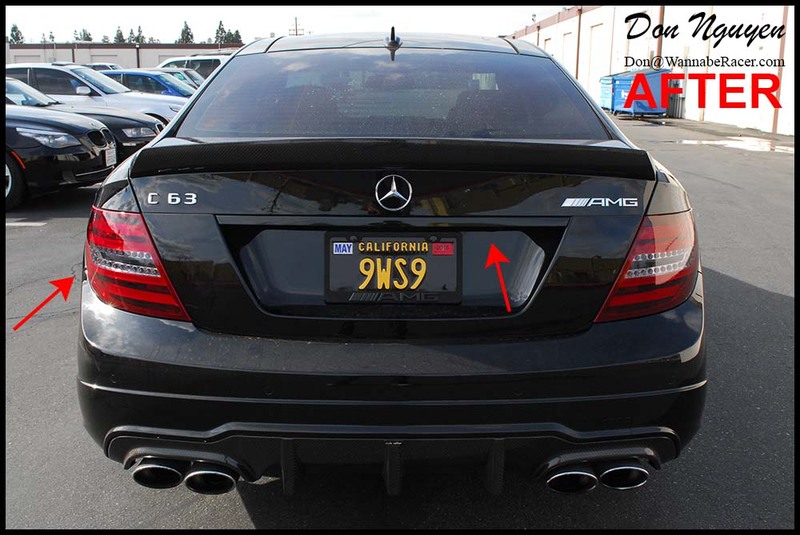 The owner of this car was from Cerritos / Los Angeles and came out to me in Anaheim Hills / Orange county to have the work done. 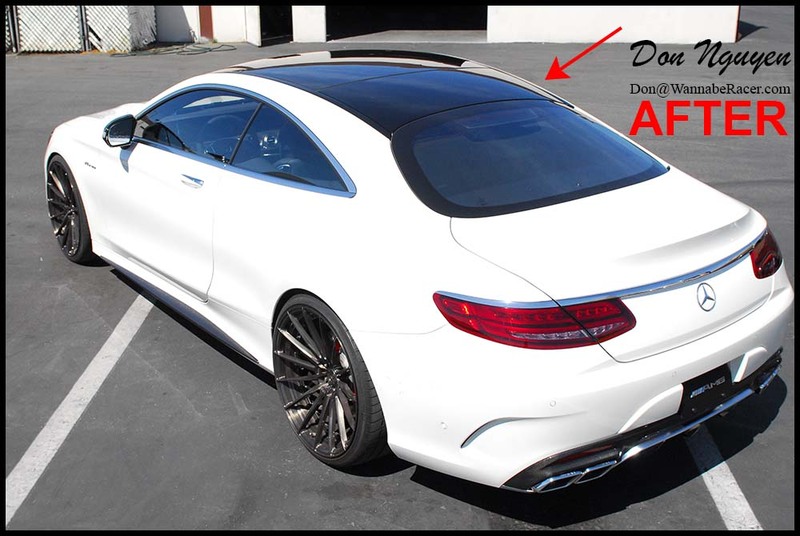 It is almost like this car was meant to come with a black roof, since the side roof rails and antenna for some reason come gloss black from the factory already as well. 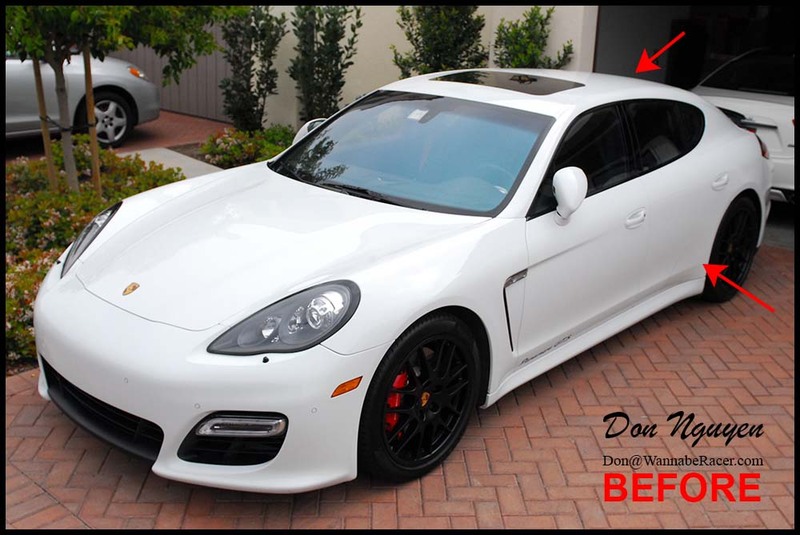 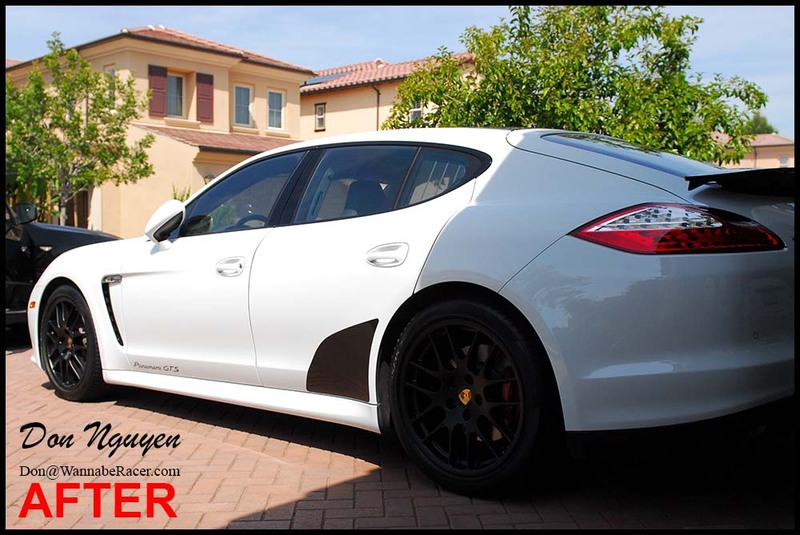 This white Porsche Panamera is another previous customer of mine. 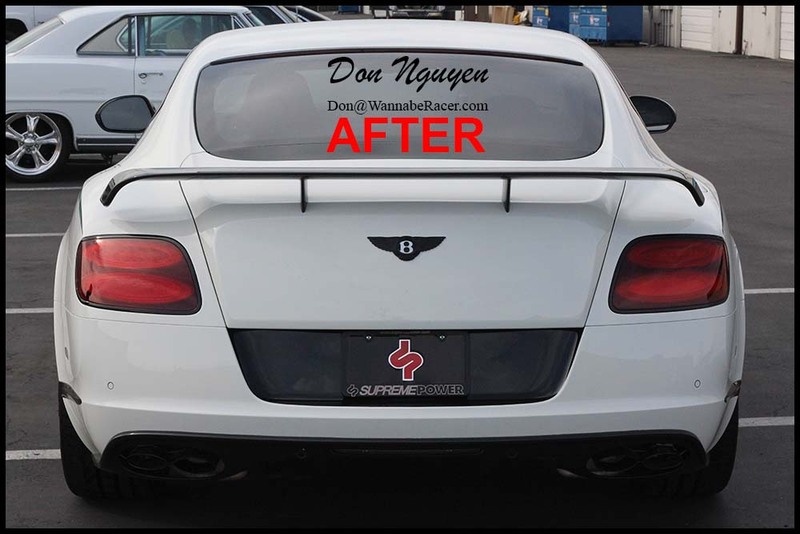 Seems like I have a lot of previous/return customers bringing in new/different cars to have vinyl work done to them, which is always a good sign that they were happy with the work done previously. 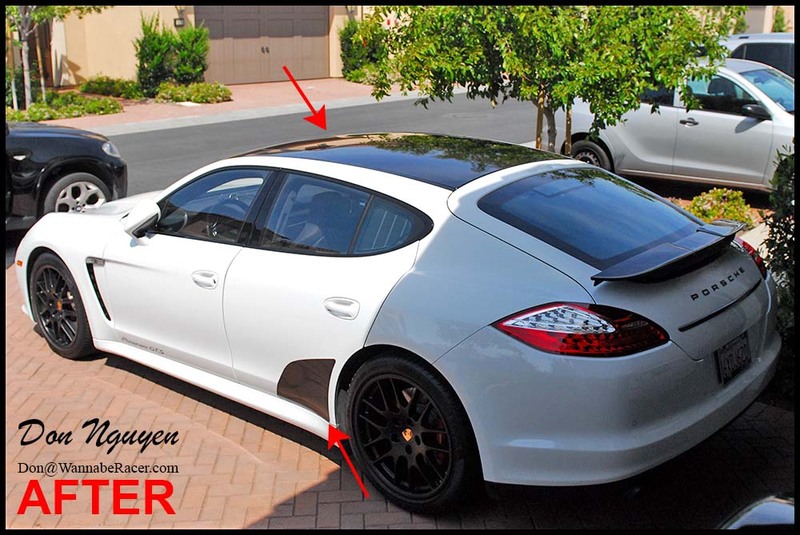 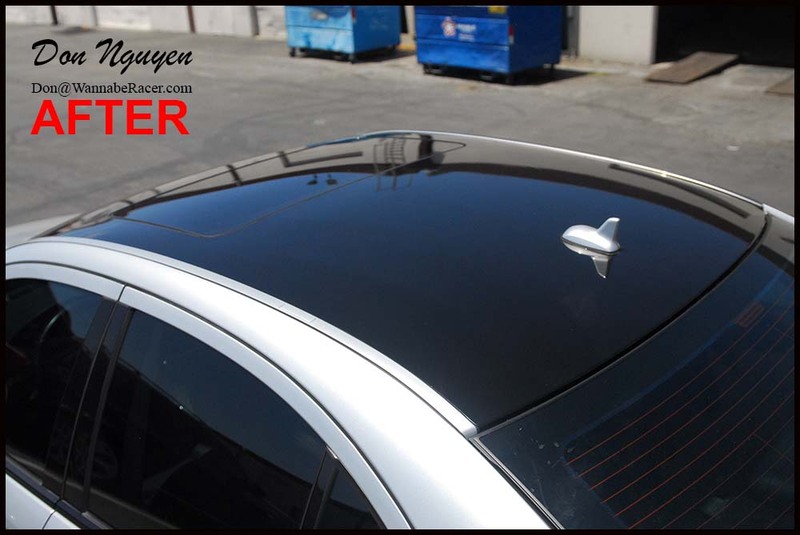 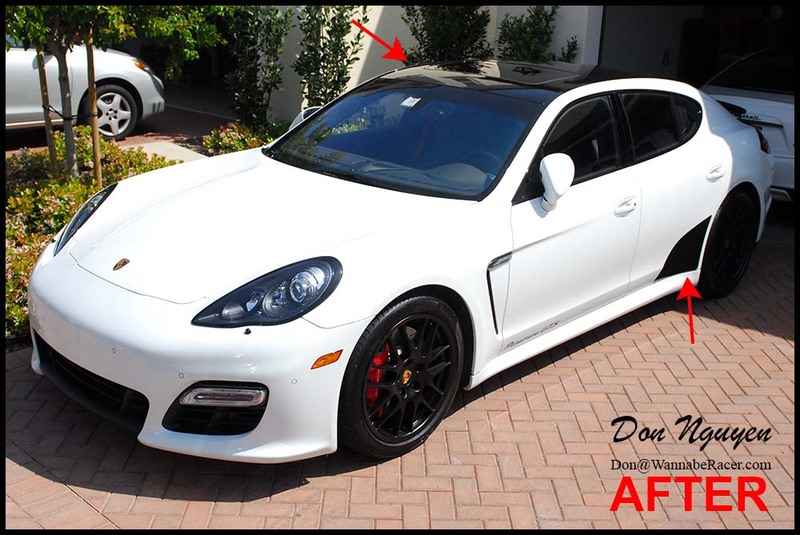 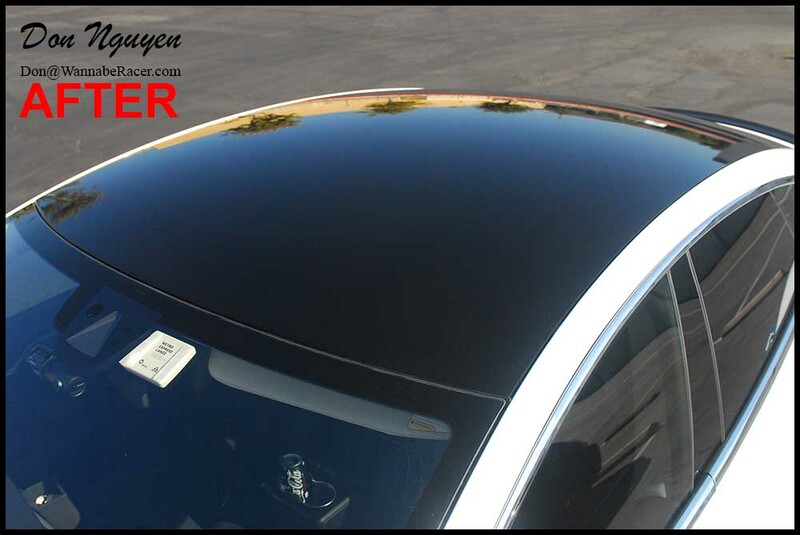 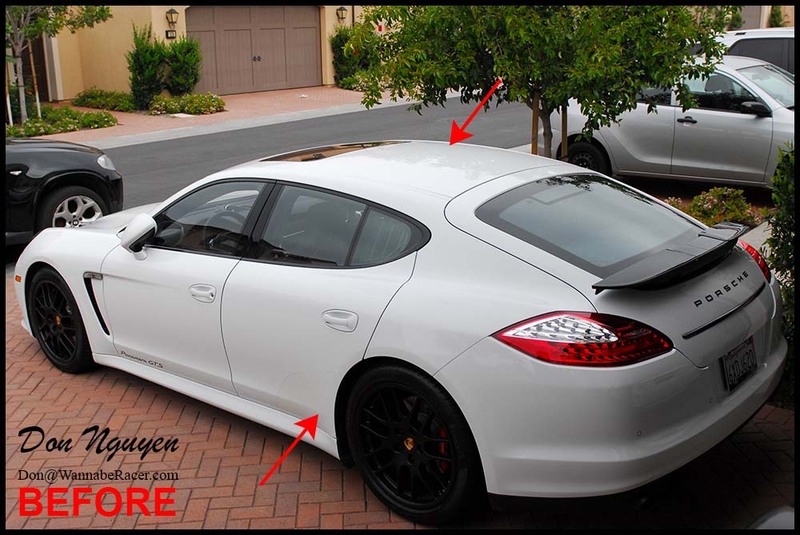 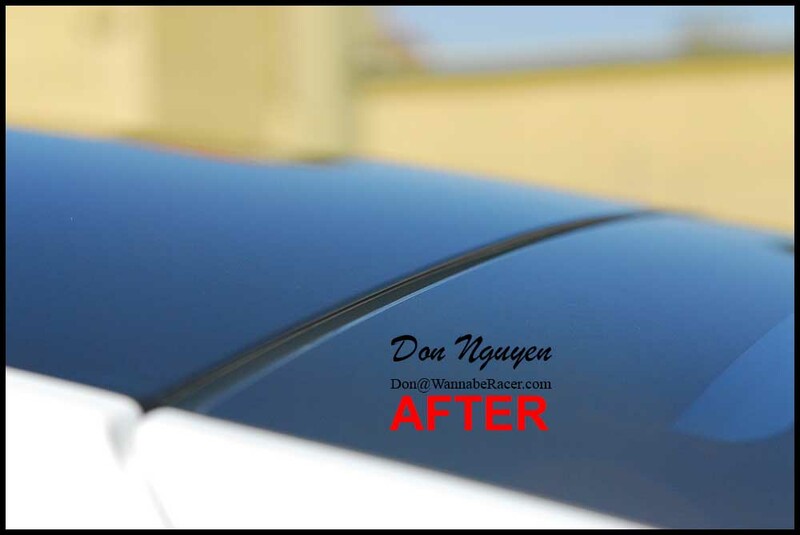 For this Porsche Panamera, I wrapped the roof in gloss black and also freehand traced the faded side rear rock/stone guard piece. 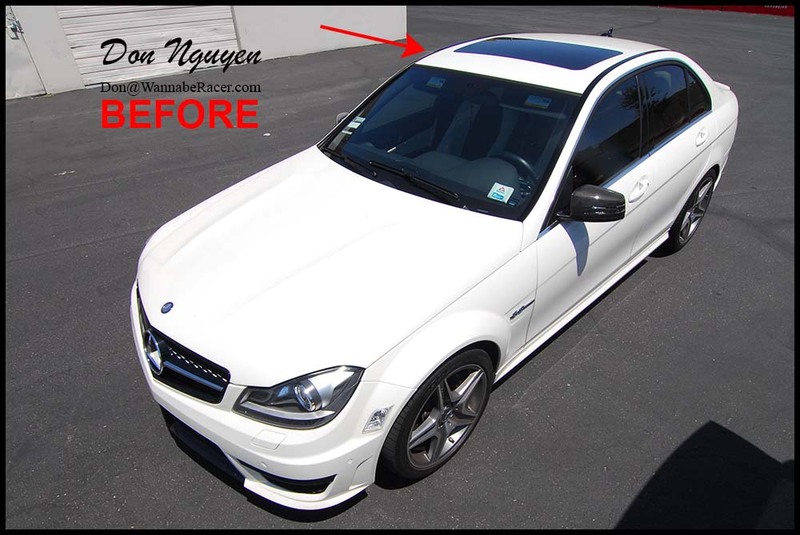 The car came with a factory clear stone guard film on there, but over time it had faded and turned yellow, so the owner of the car wanted me to wrap it in gloss black to match the rest of the black/white theme already on the car. 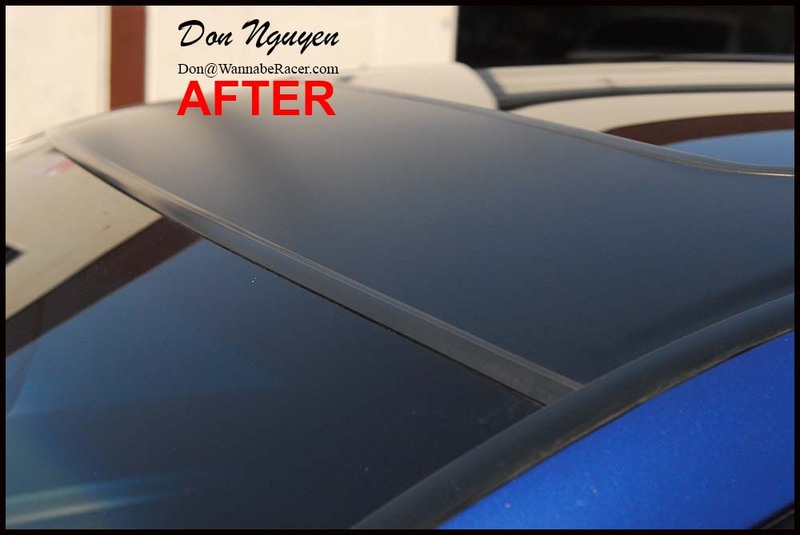 I actually went out to the location of the car to do this install, as part of my mobile services that I have begun to offer. 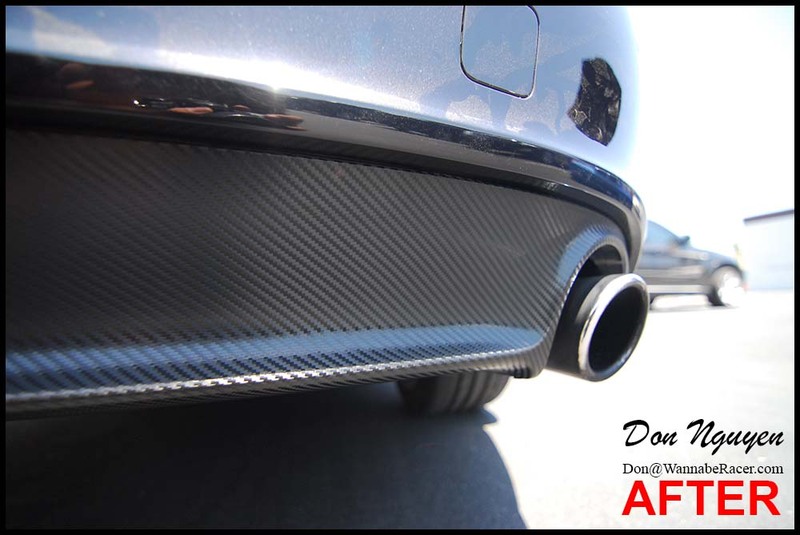 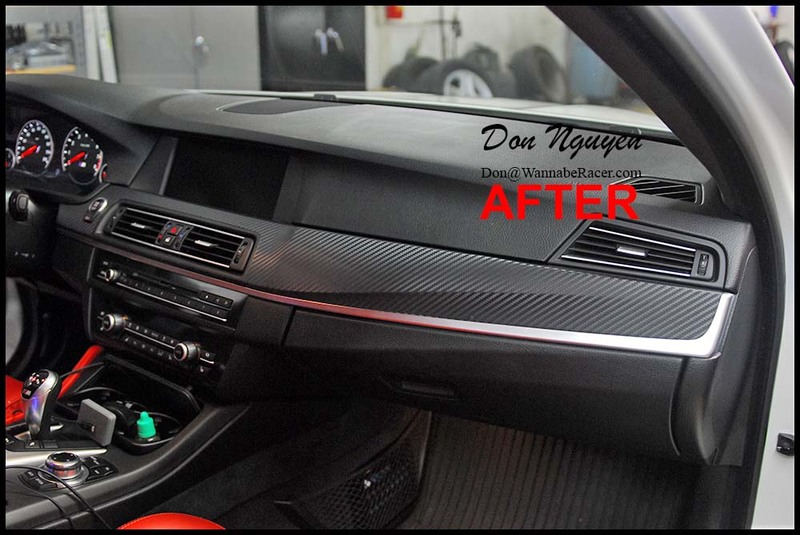 Although most people probably go with the slightly glossier 3M 1080 carbon wrap for their interiors, the 3M di-noc matte carbon fiber is still a good option for those who want something that looks/resembles dry carbon more. 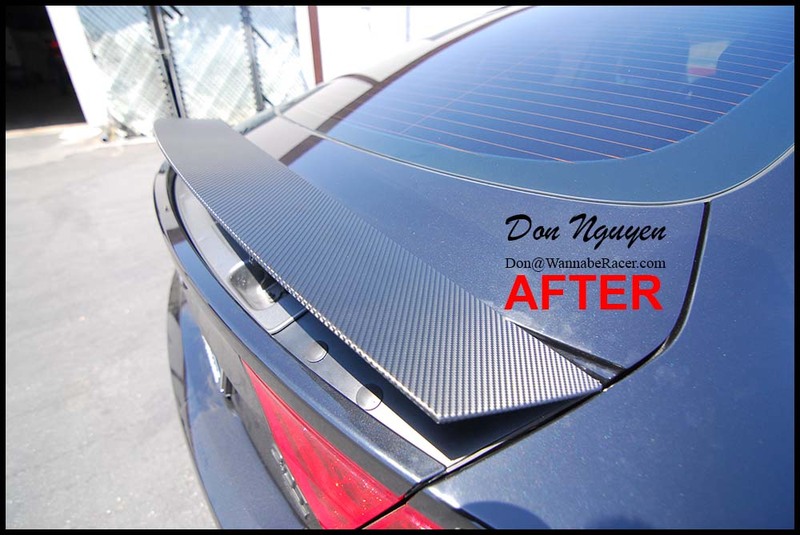 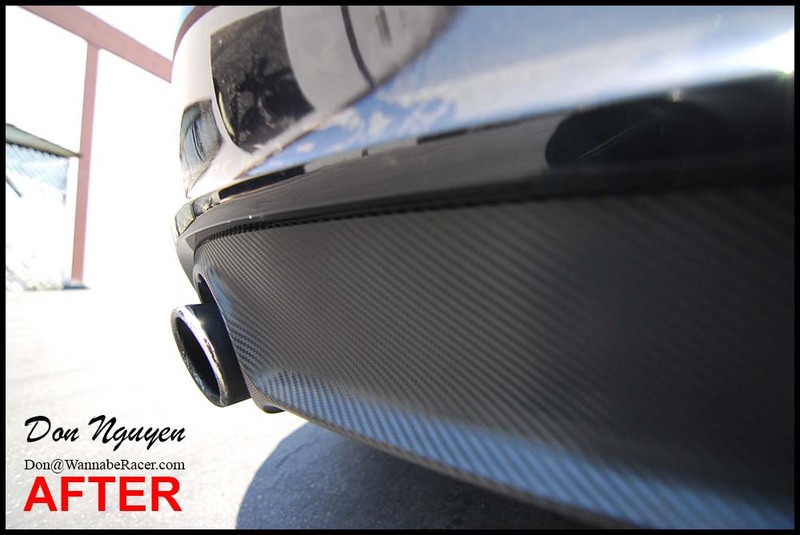 The size of the weave and color also varies a bit between the two carbon fiber materials offered by 3M as well. 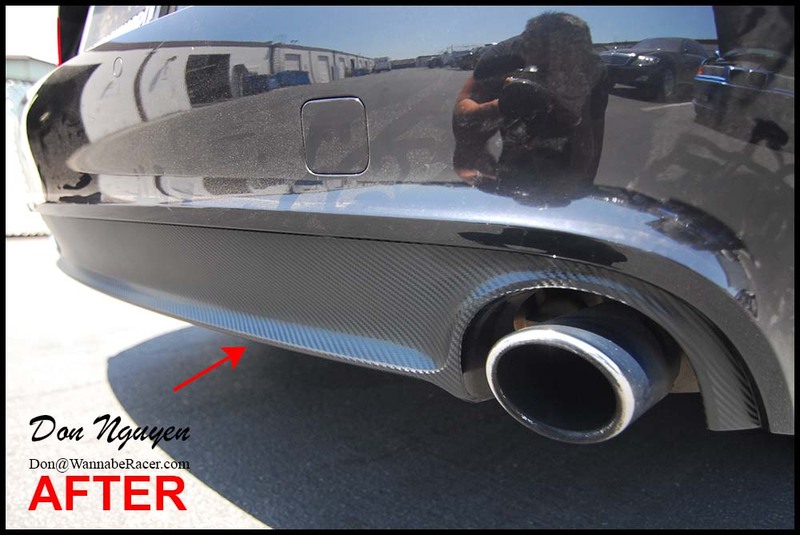 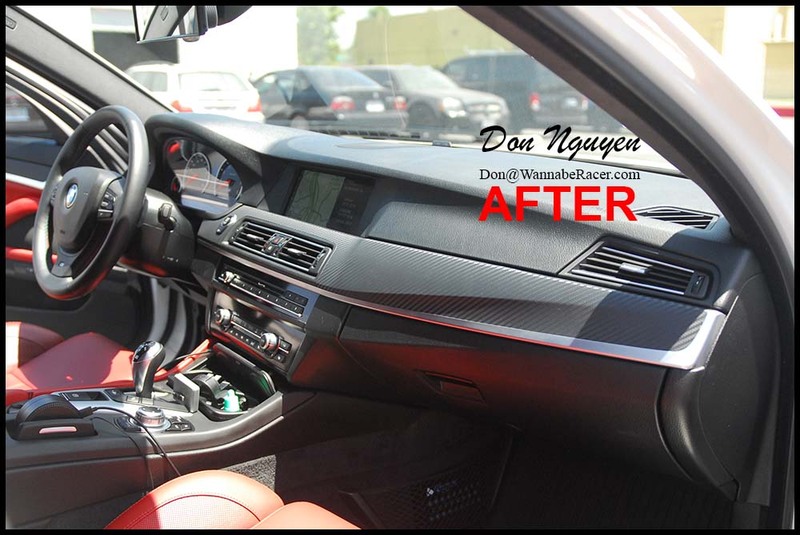 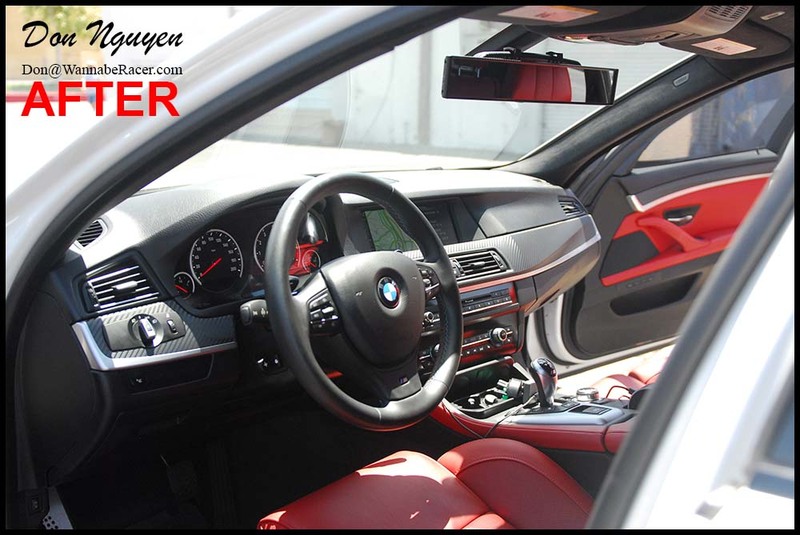 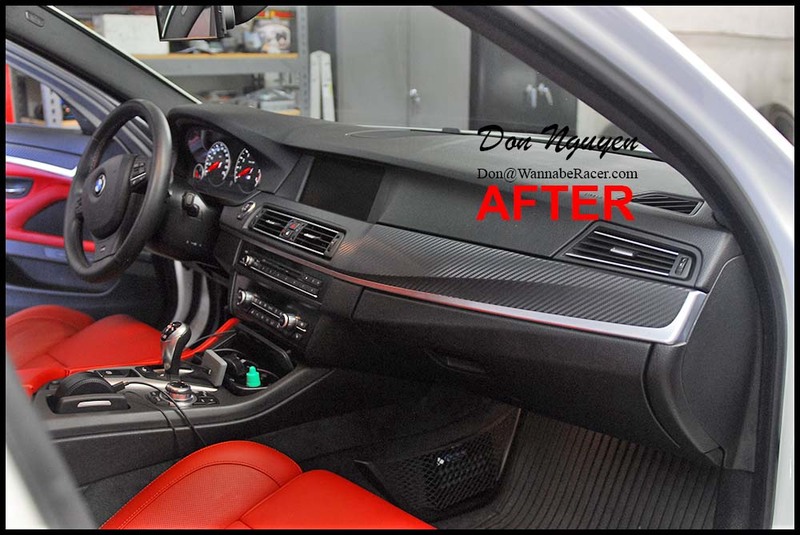 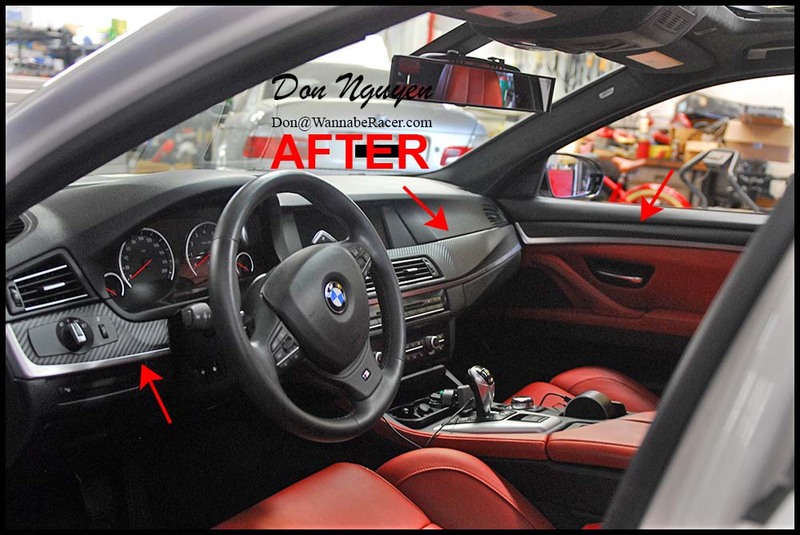 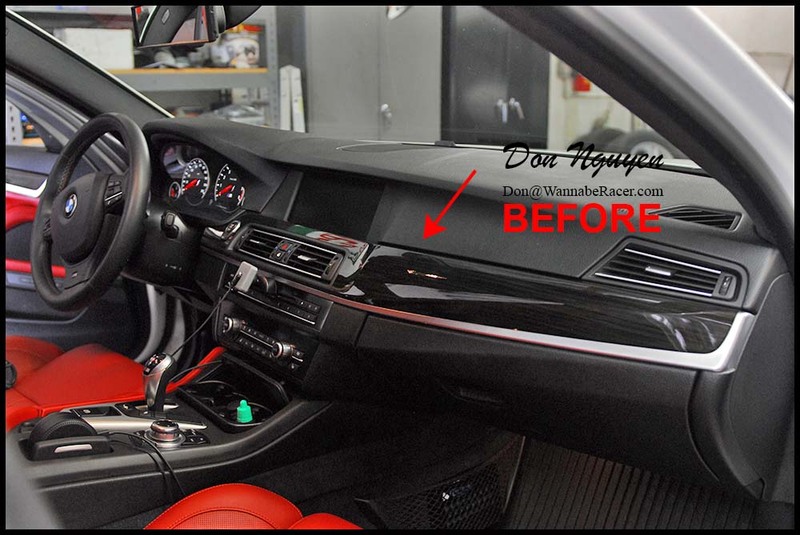 For this BMW F10 M5 sedan, we vinyl wrapped the interior with the 3M di-noc matte carbon fiber finish vinyl material over the factory wood trim pieces on the car. 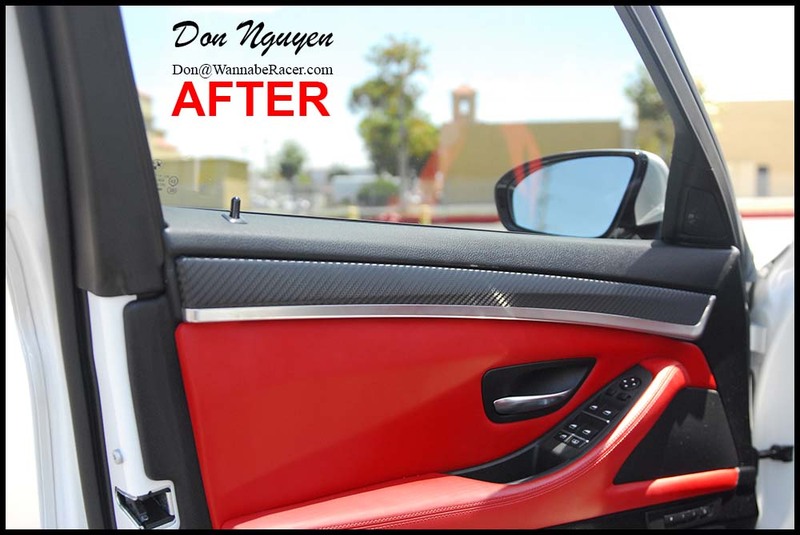 The blend of the carbon fiber look and the aluminum trim accents compliment each other fairly well I think. 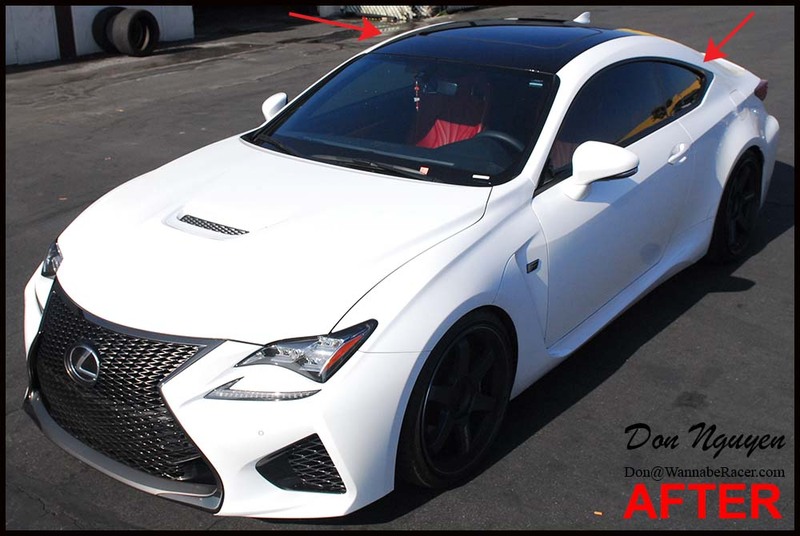 The owner of this car was from Los Angeles / Inglewood or Santa Monica and came out to me in Anaheim Hills / Orange County to have the vinyl wrap work done on his interior. 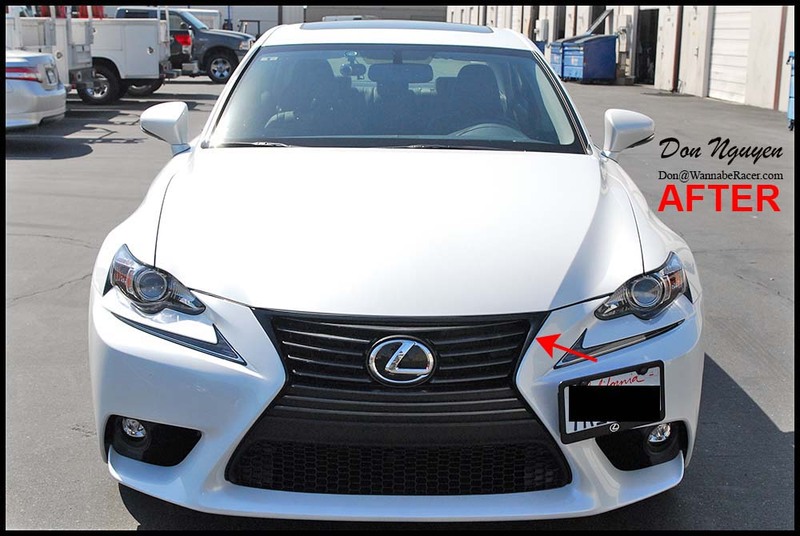 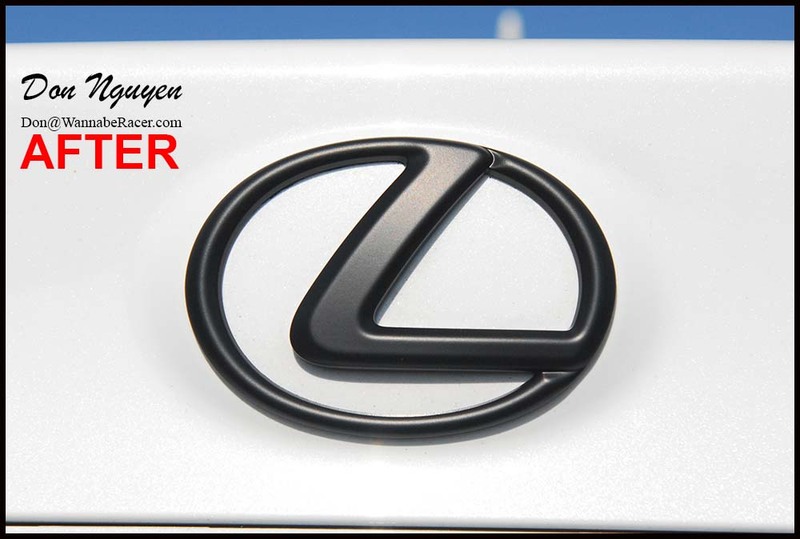 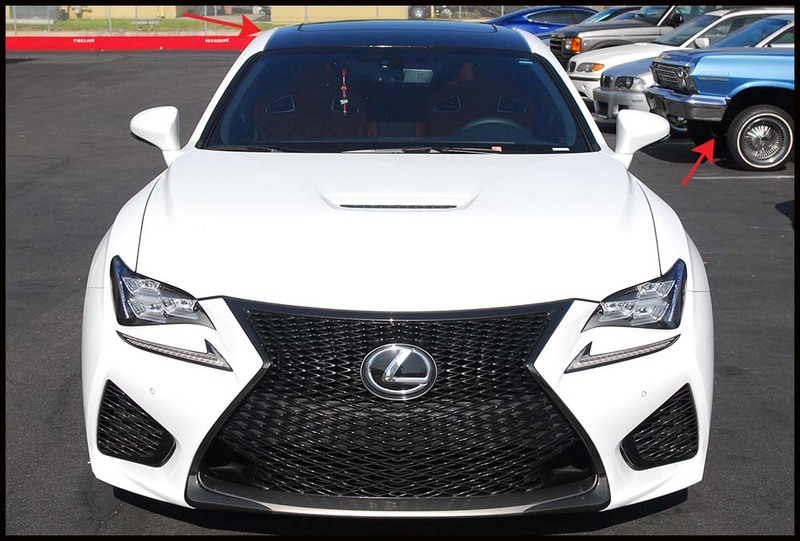 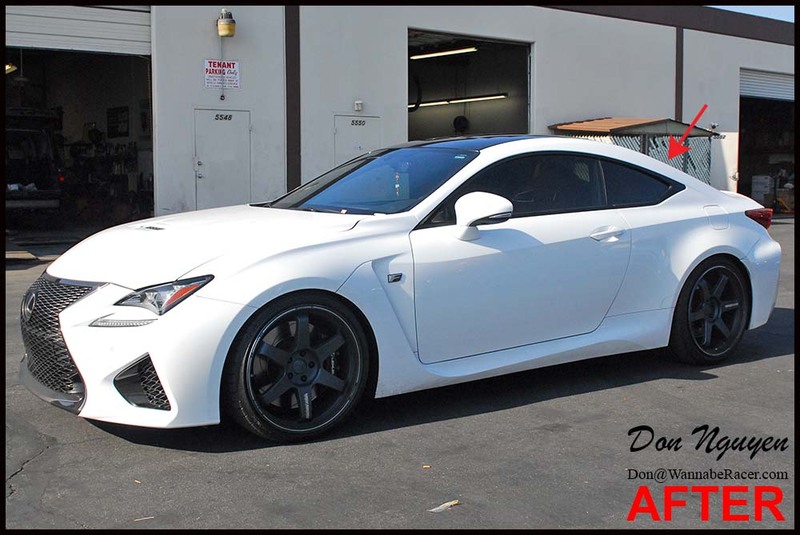 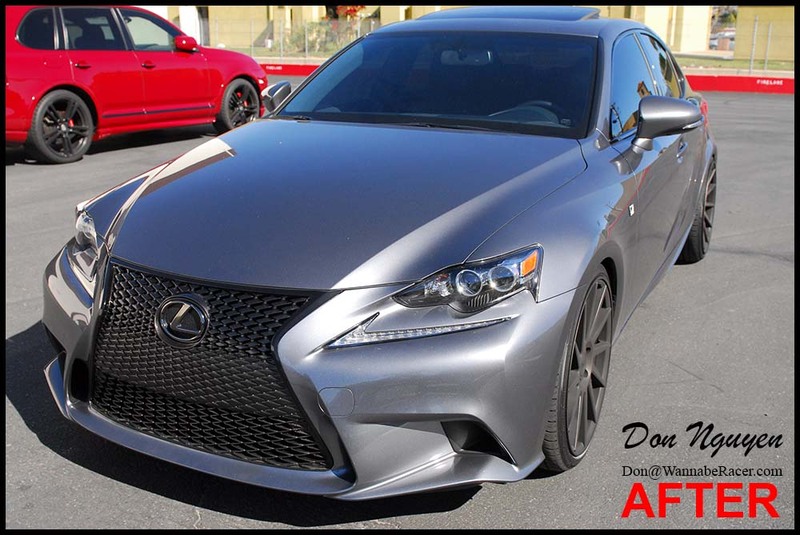 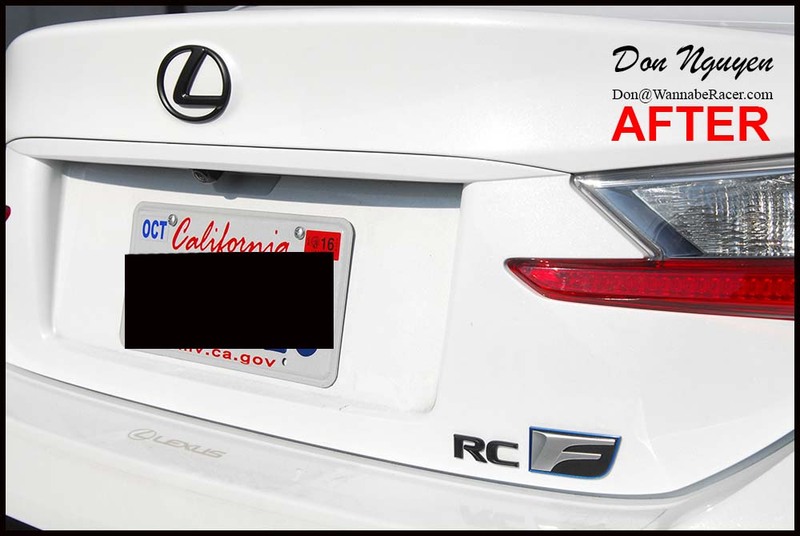 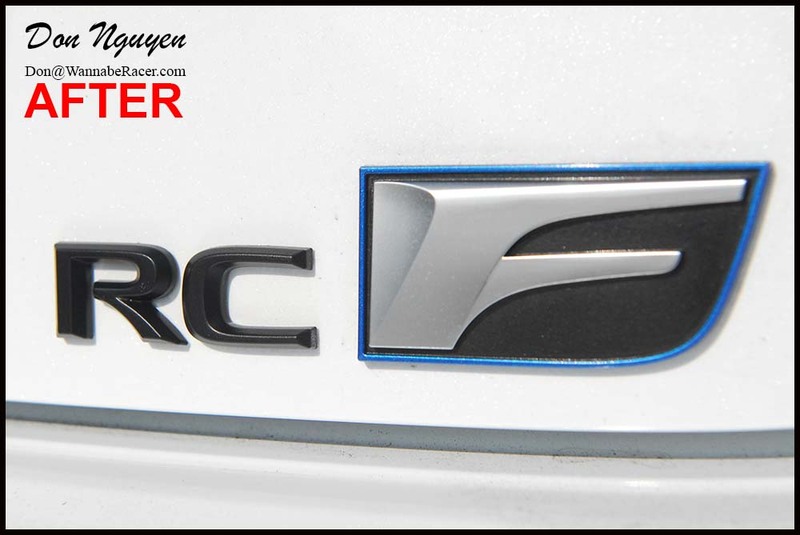 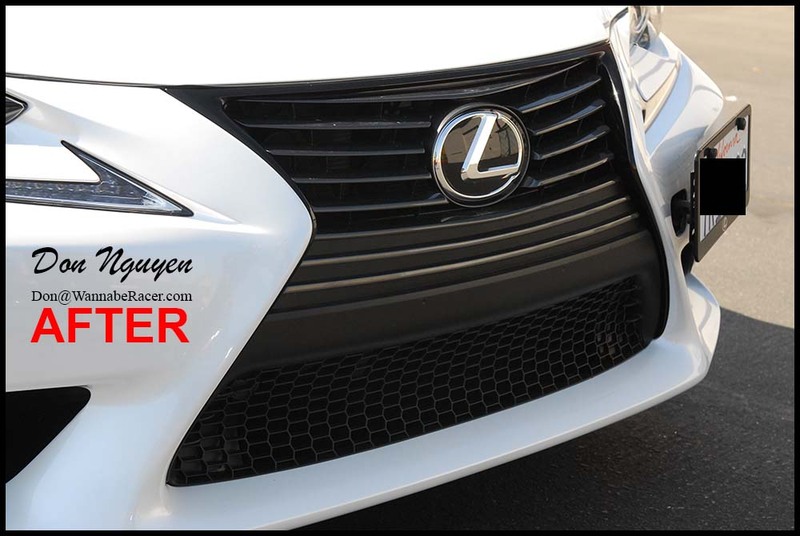 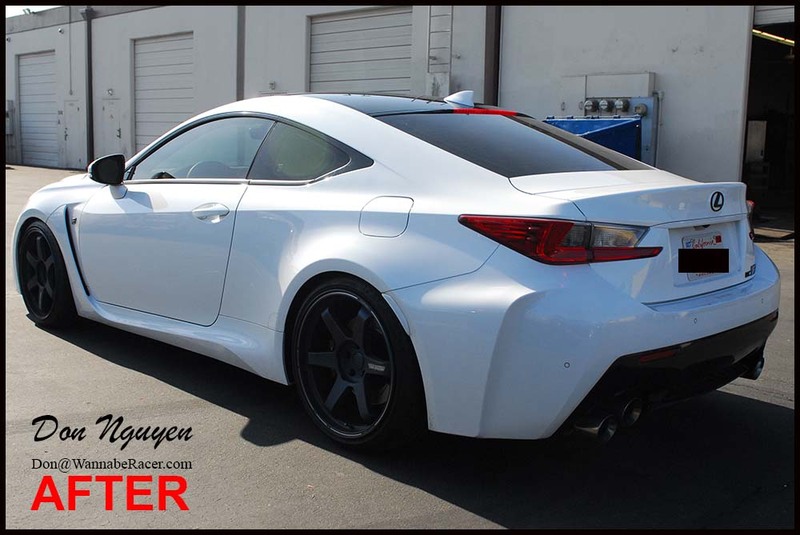 There have been quite a few Lexus RC-Fs coming by lately. 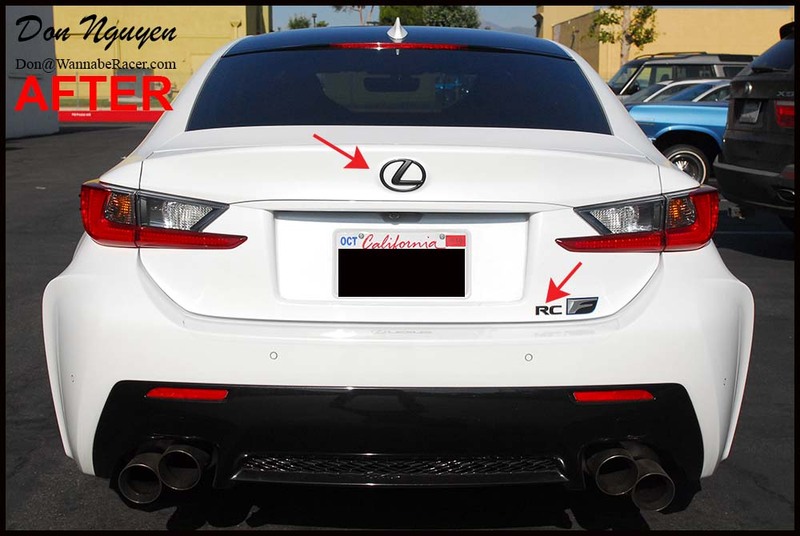 One day, I had two RC-Fs back to back. 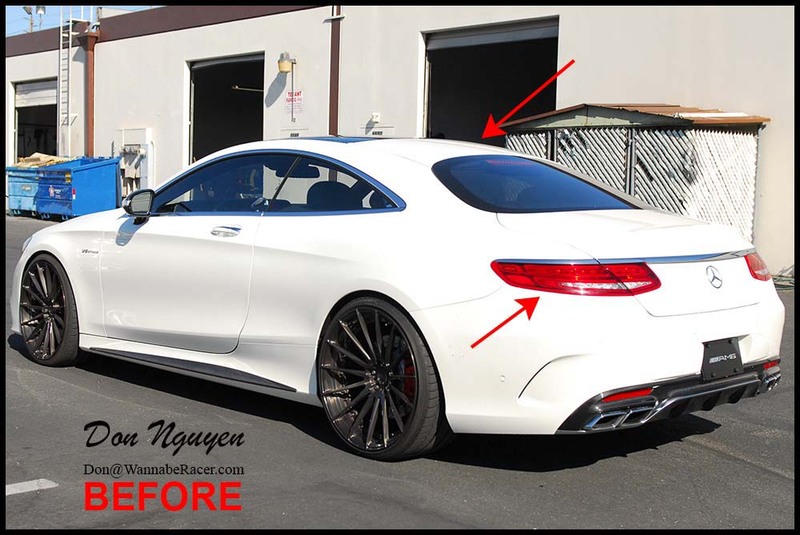 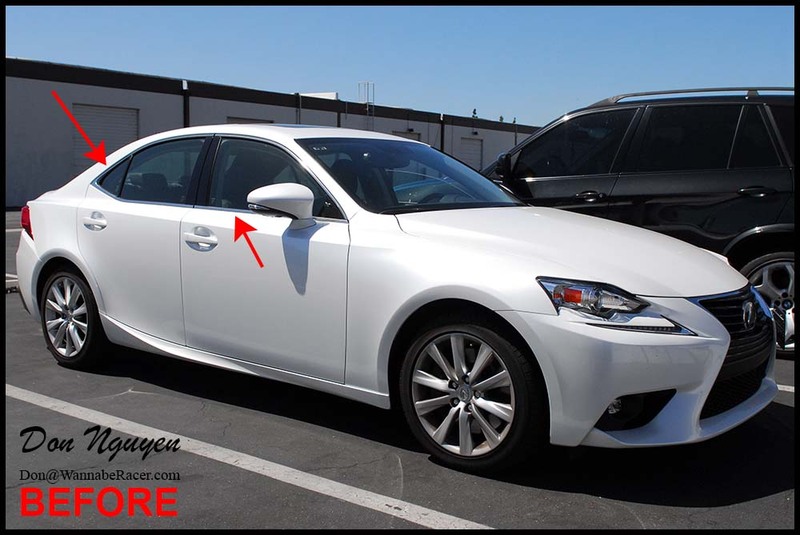 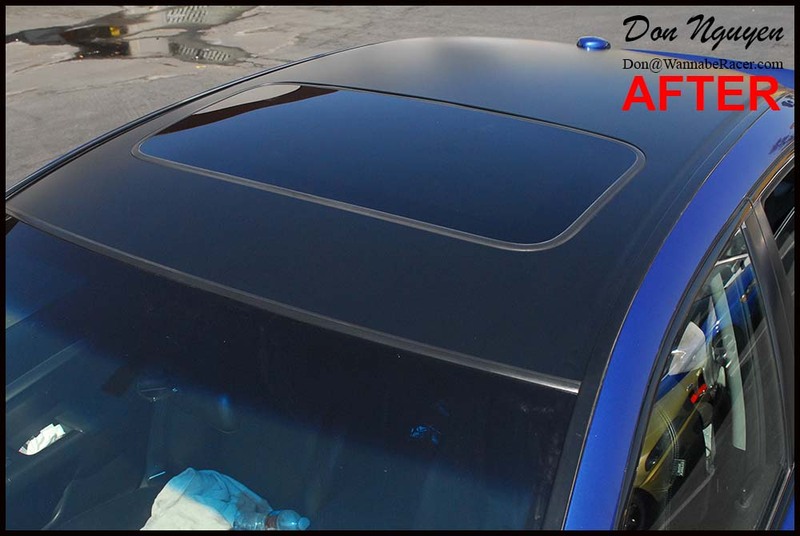 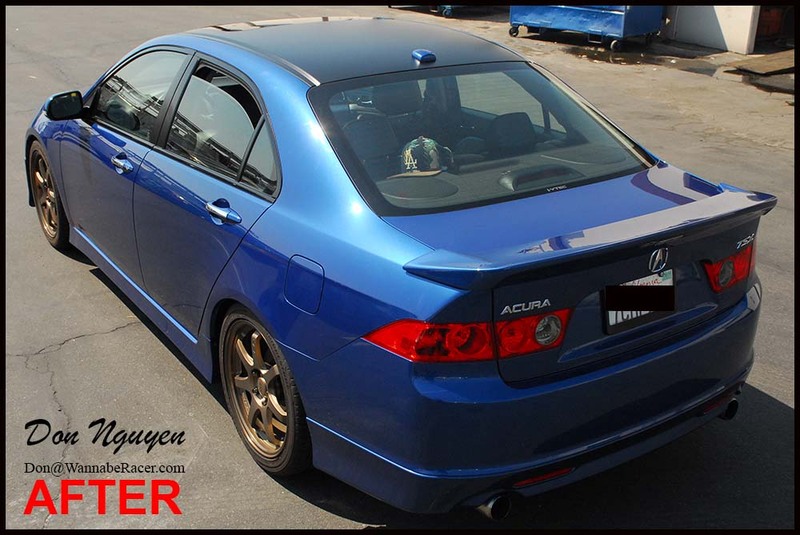 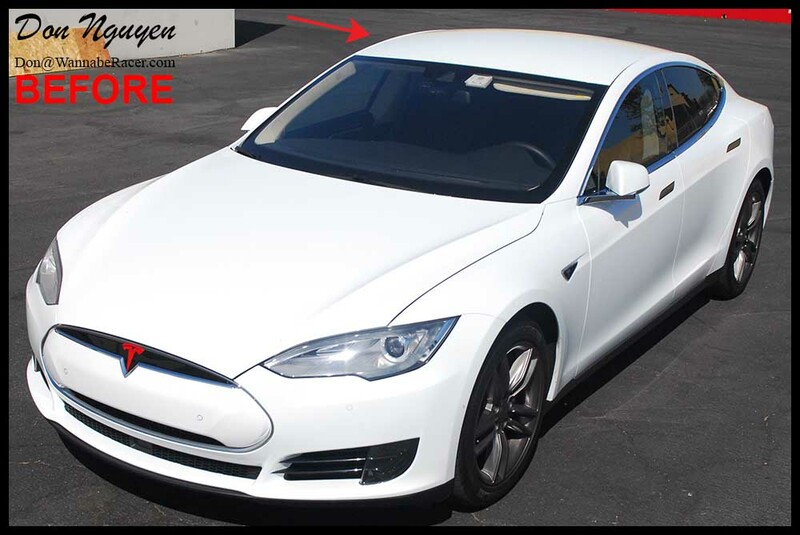 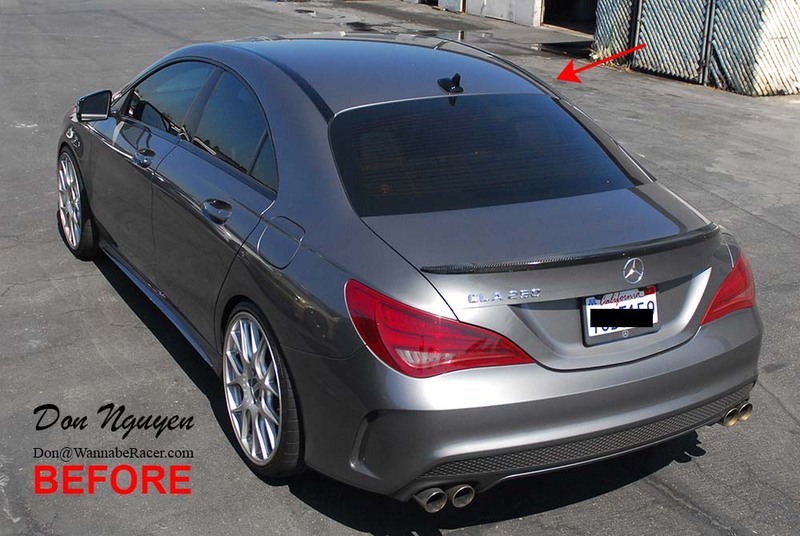 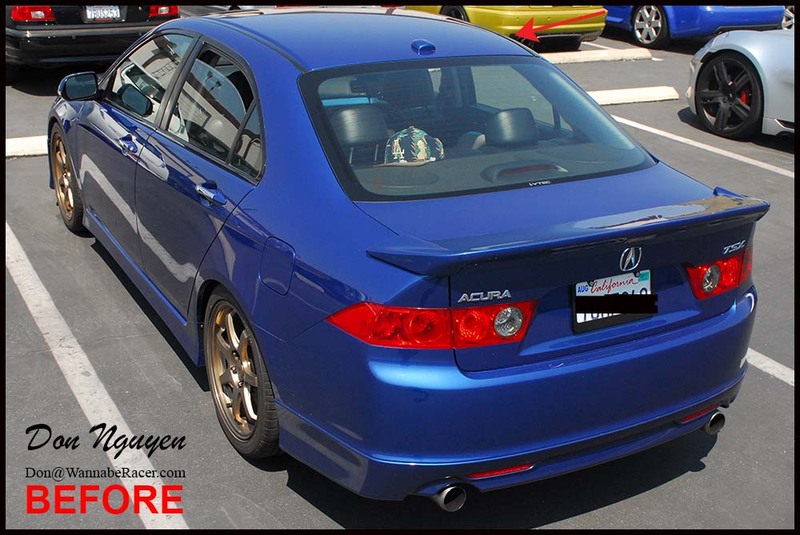 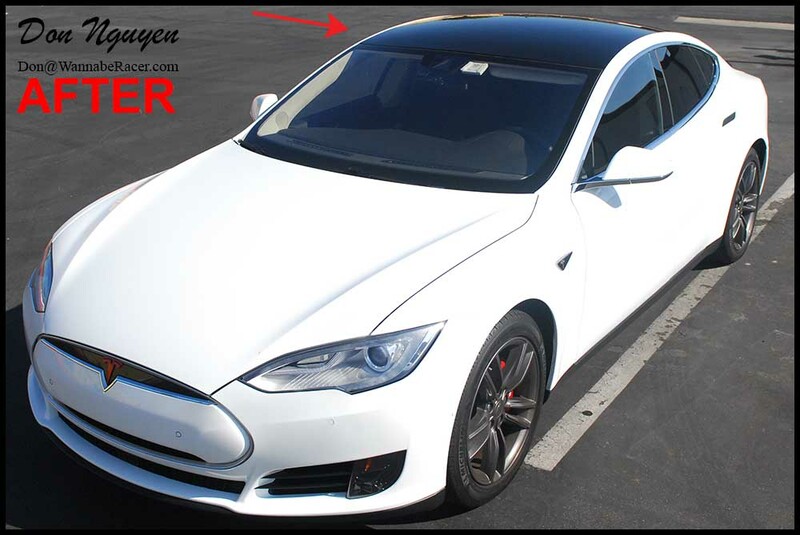 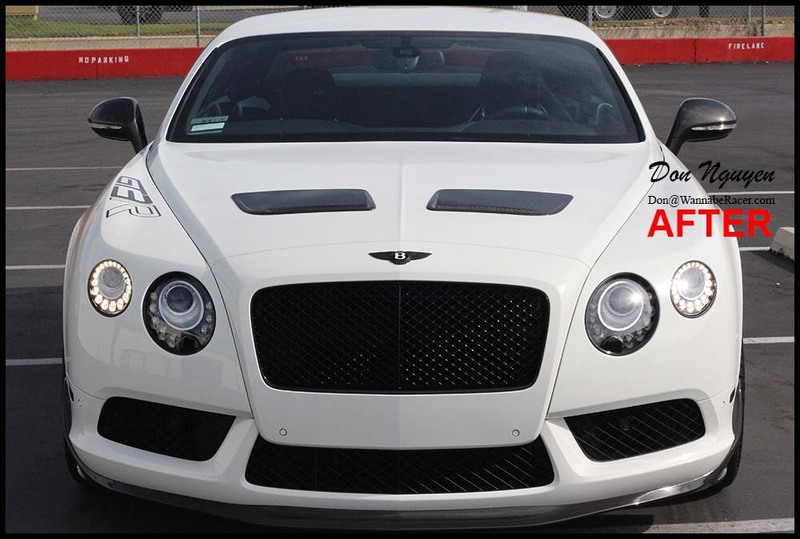 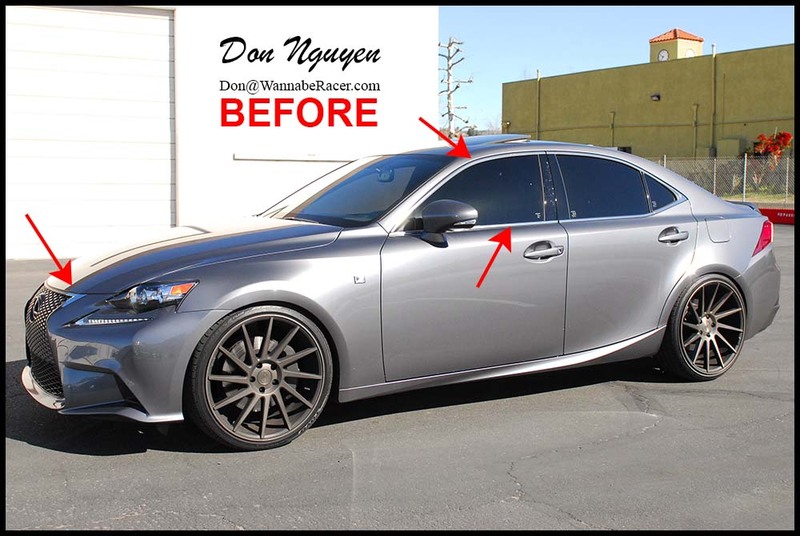 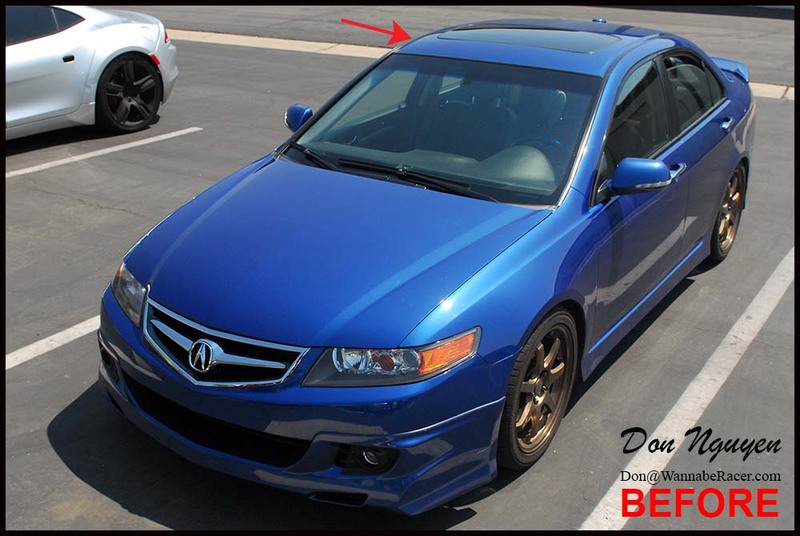 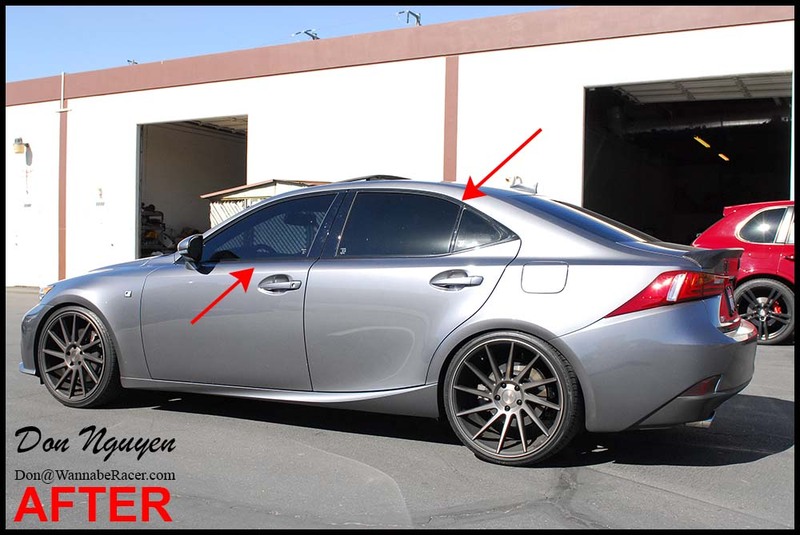 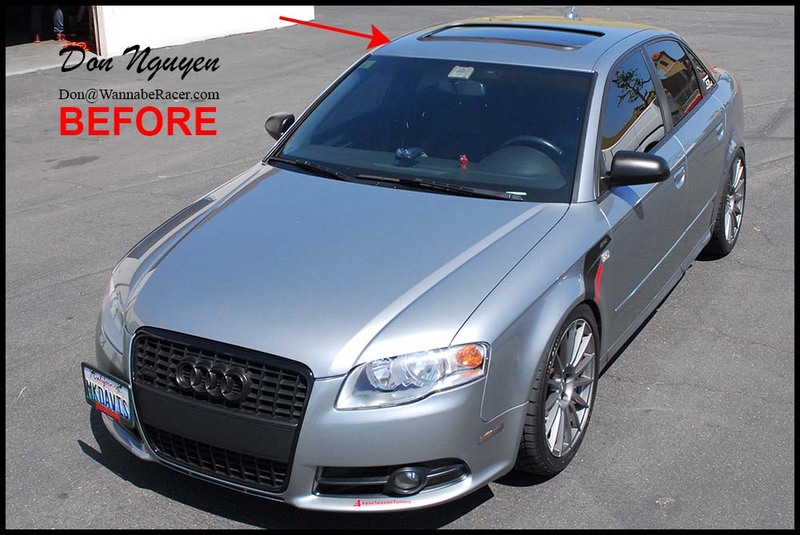 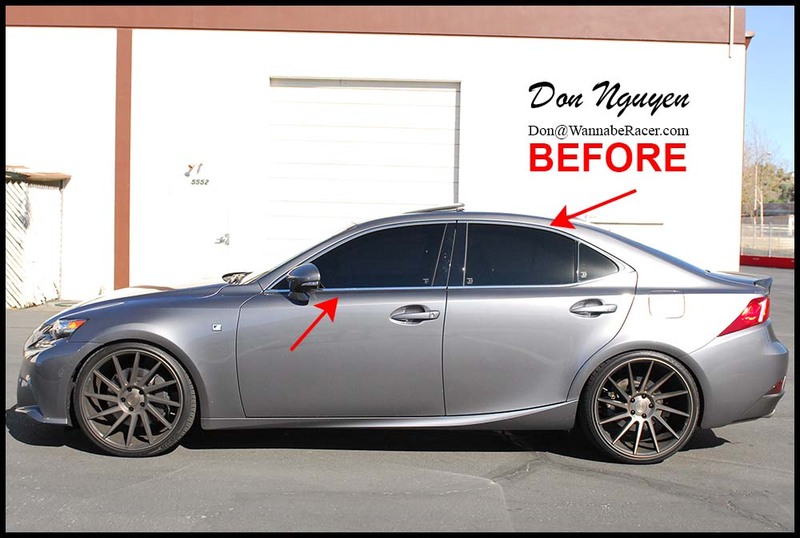 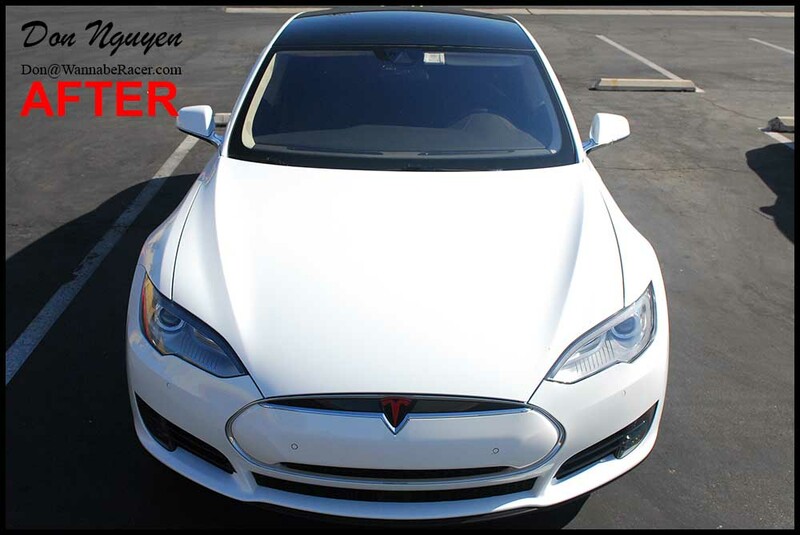 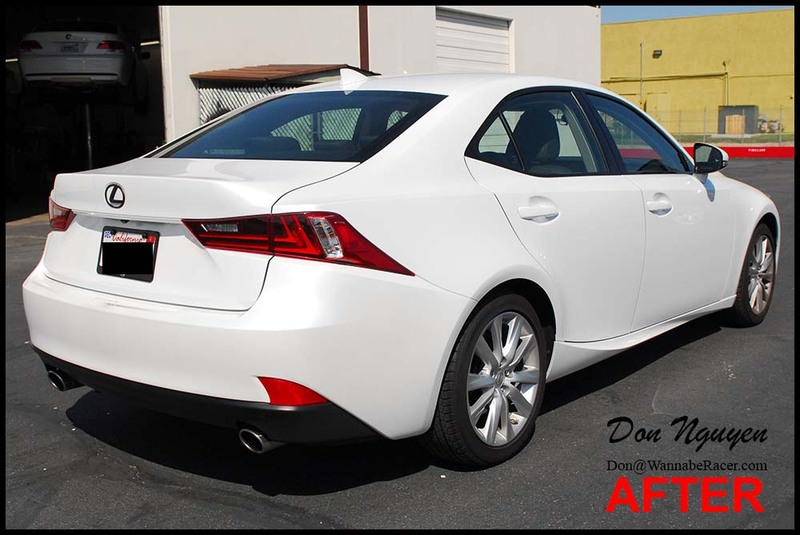 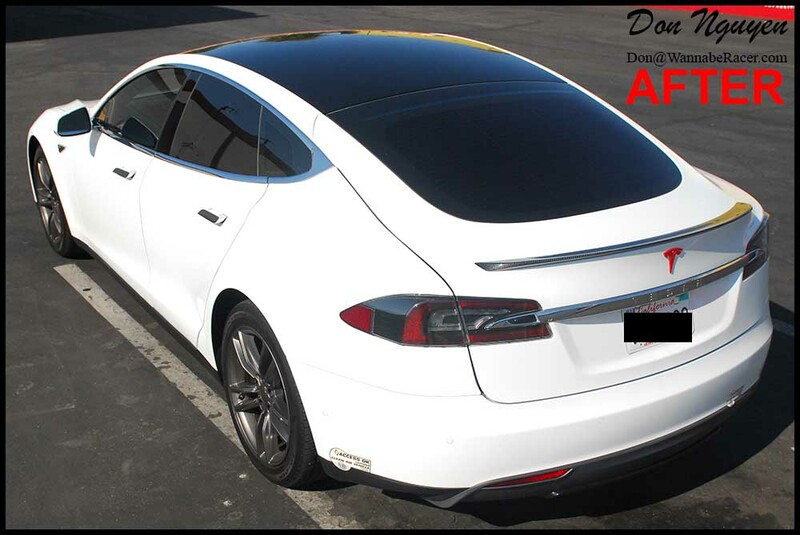 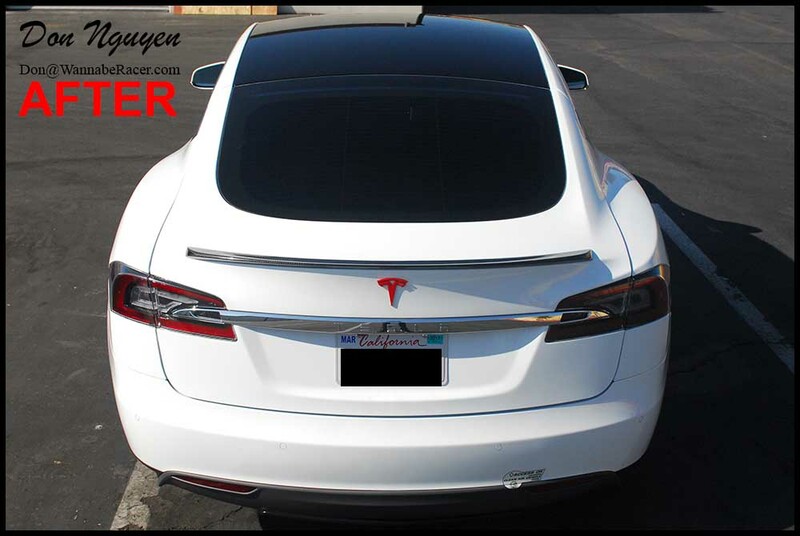 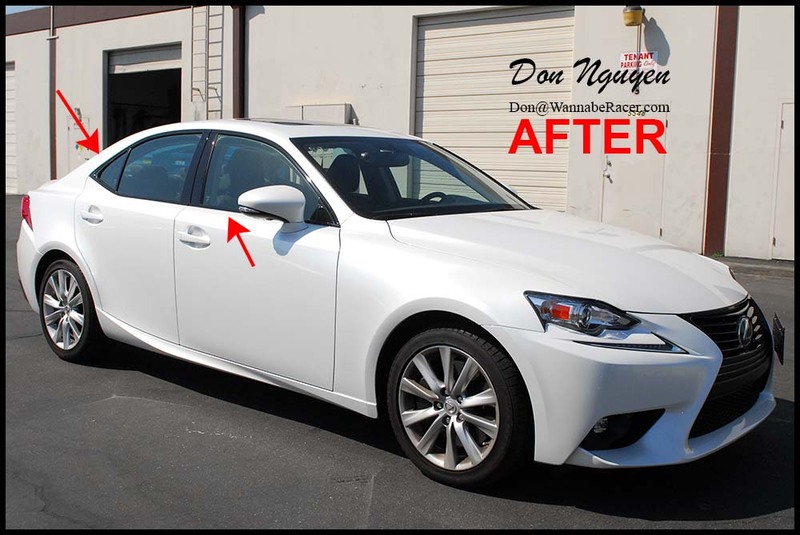 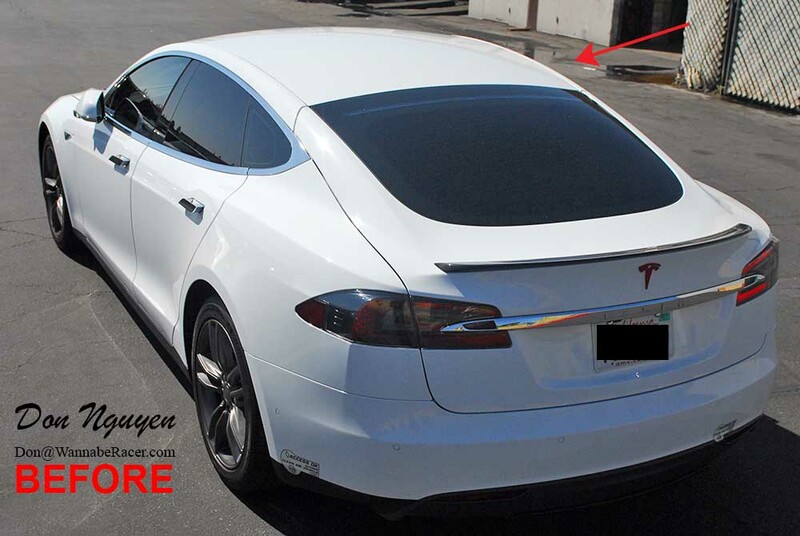 On this particular car, I vinyl wrapped the roof and blacked out the chrome side window trim in my gloss black vinyl material. 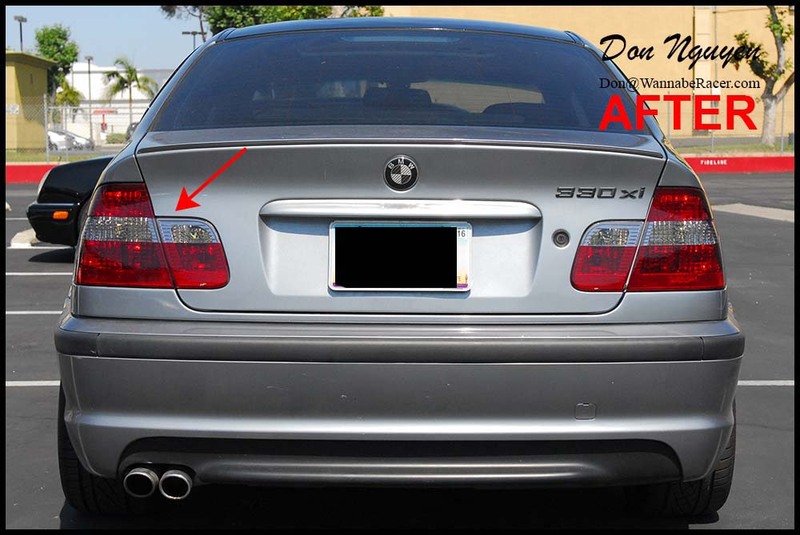 In addition to wrapping those pieces, I plasti dipped the rear badges on the trunk of the car. 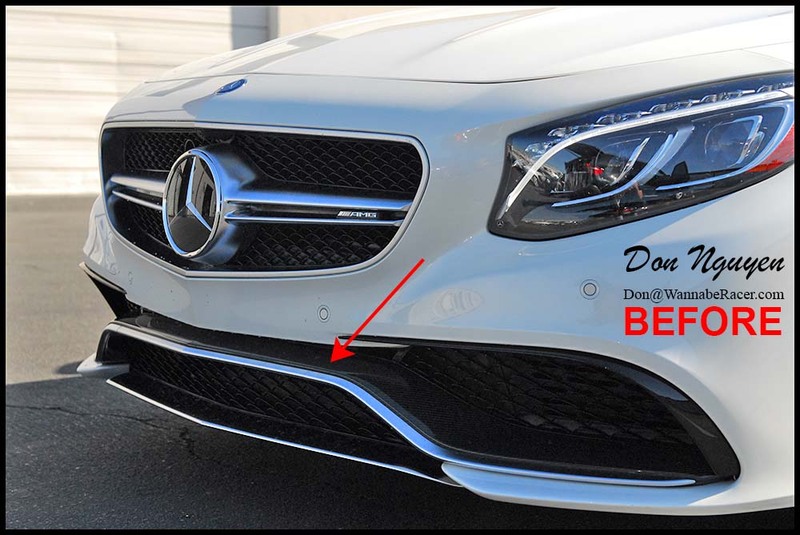 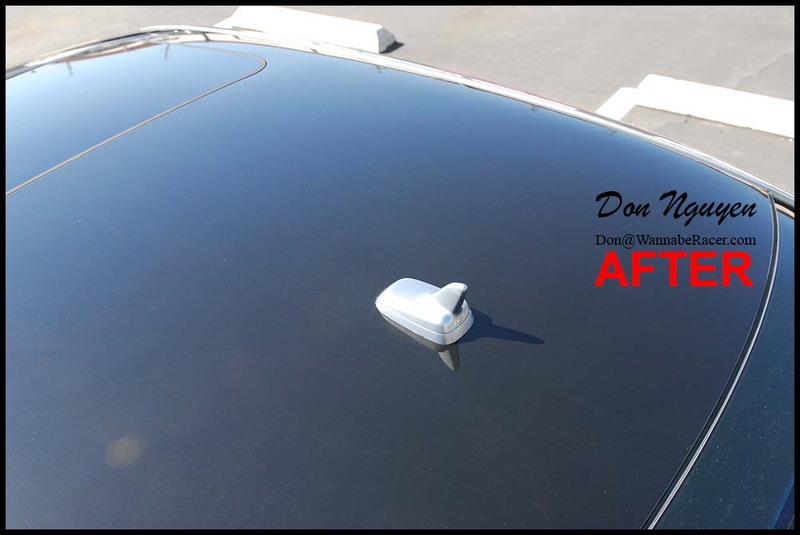 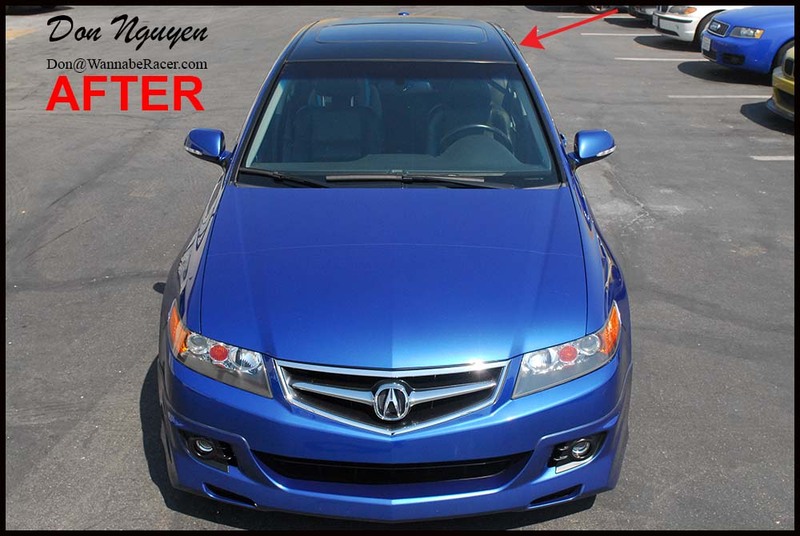 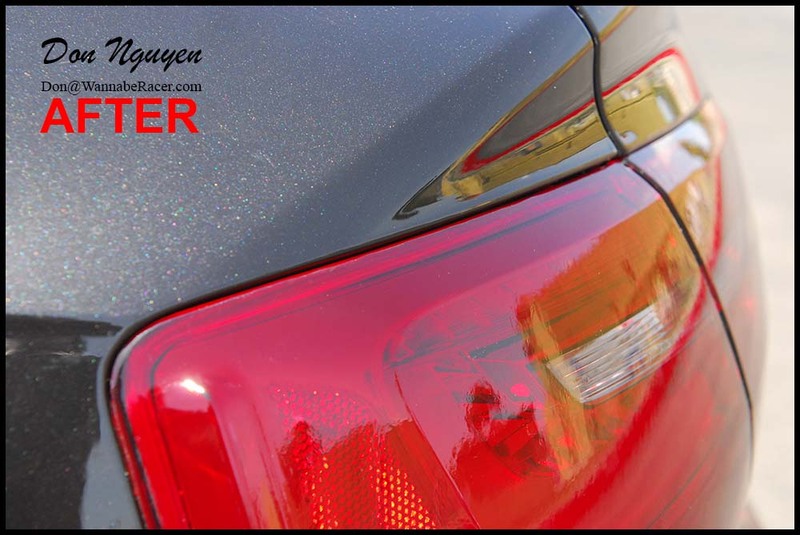 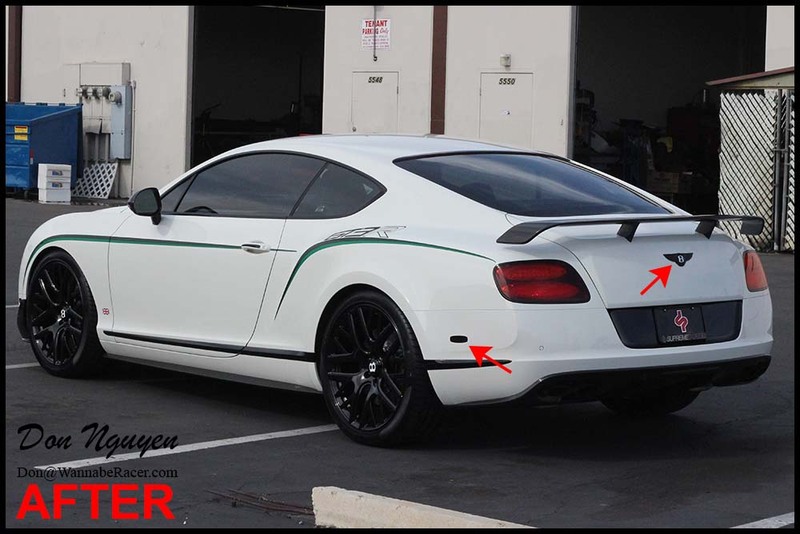 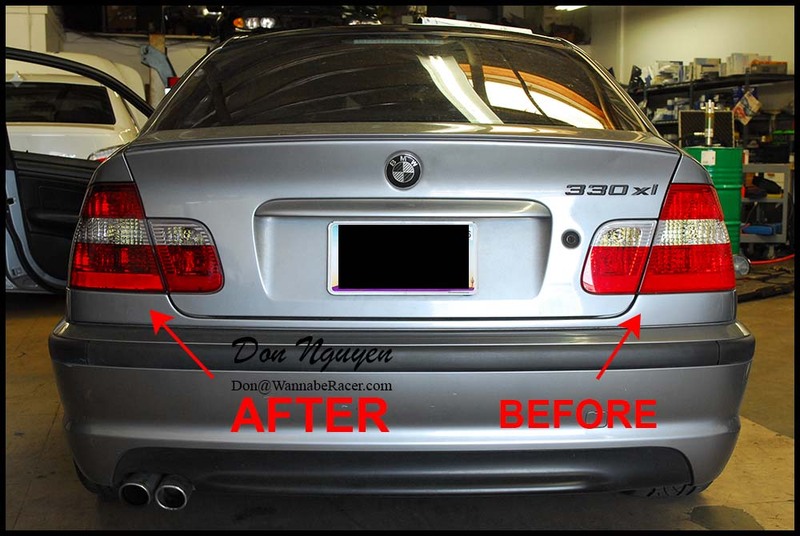 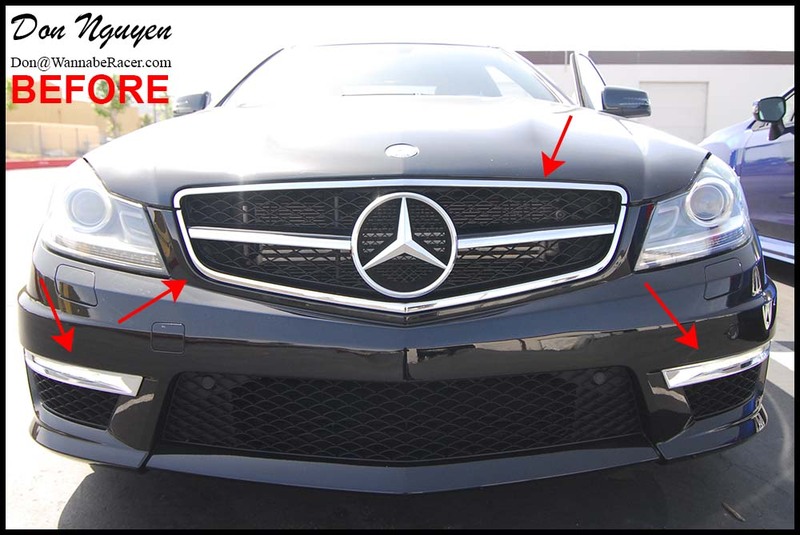 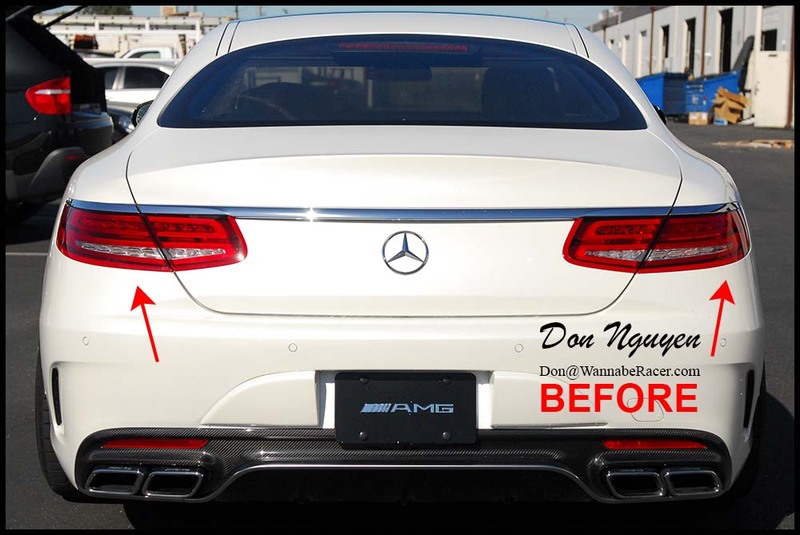 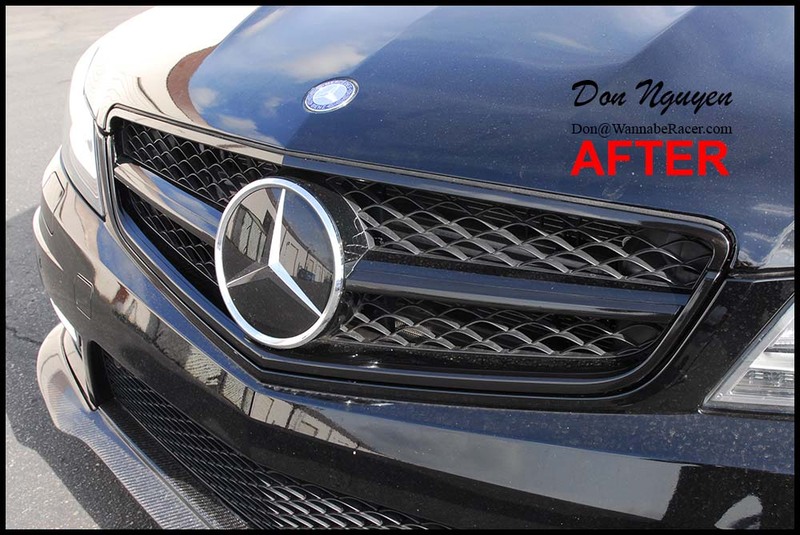 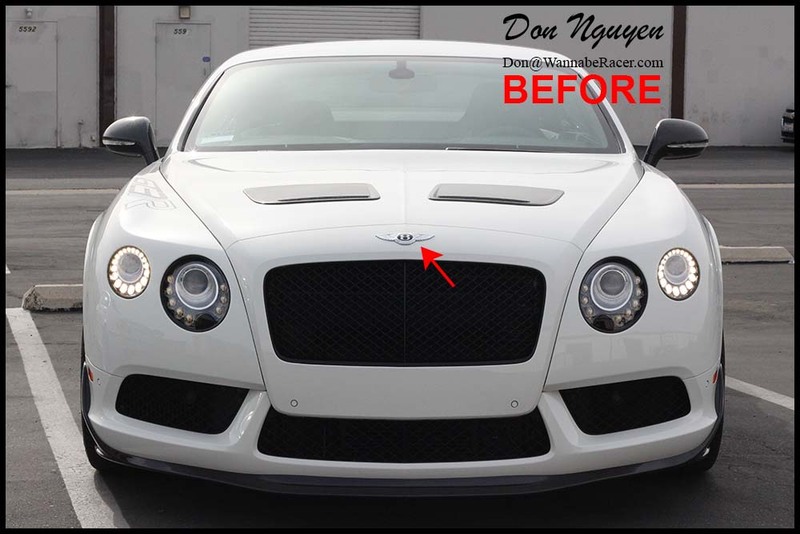 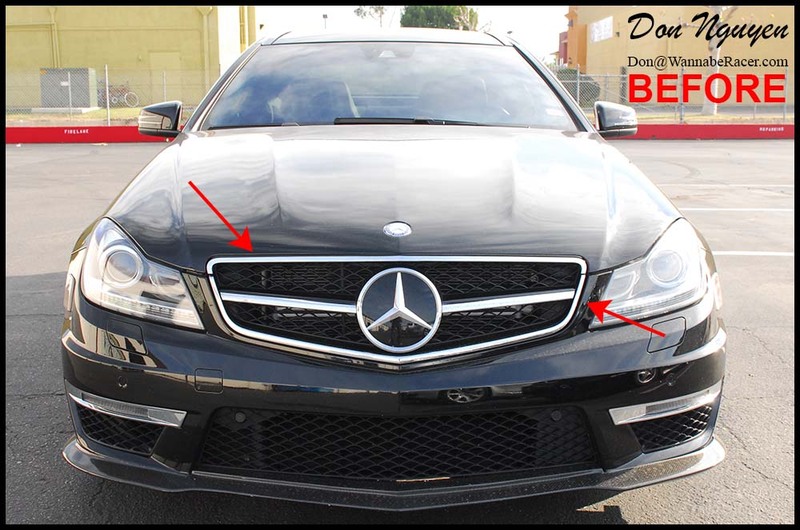 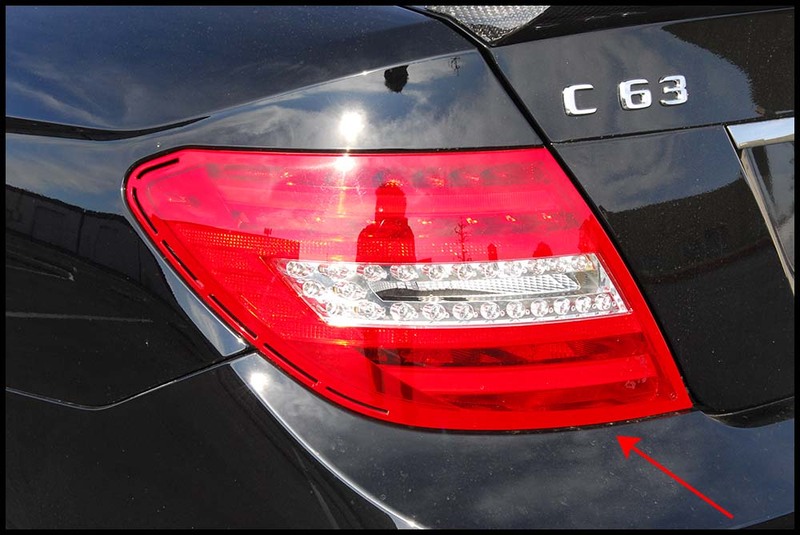 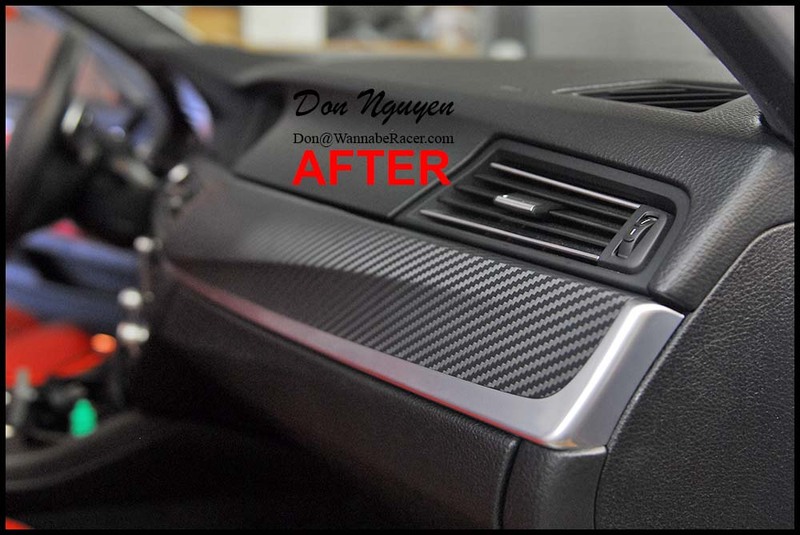 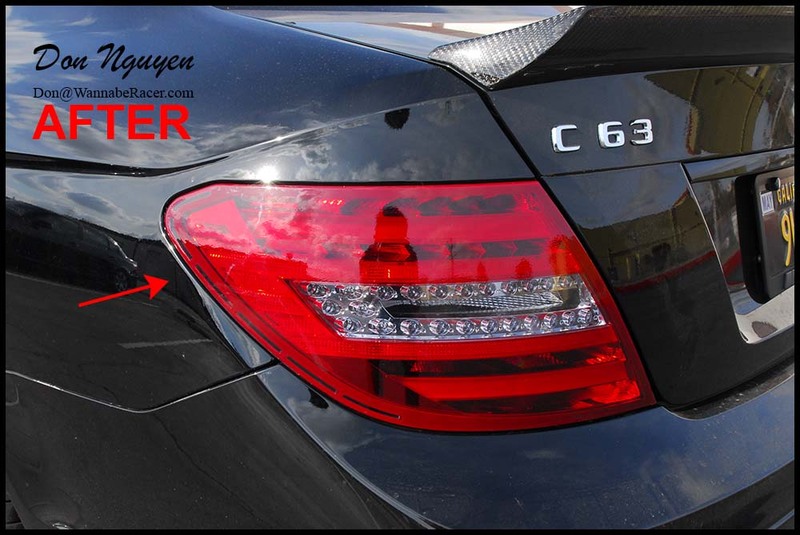 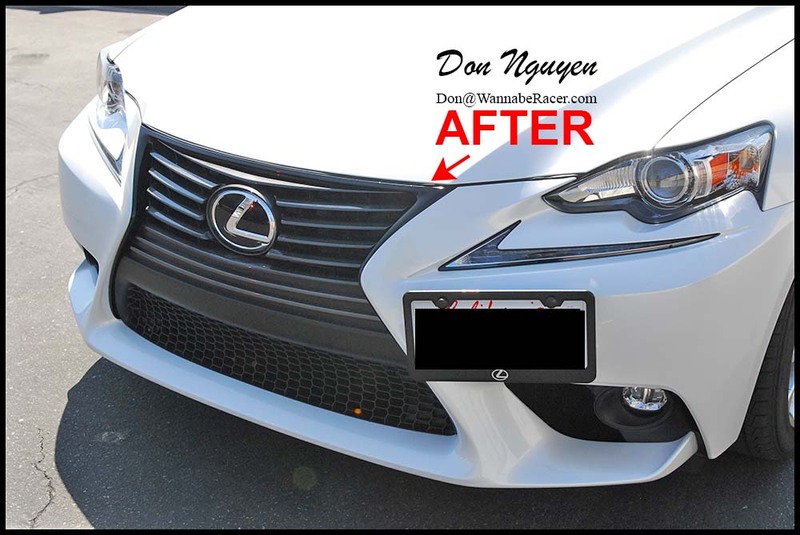 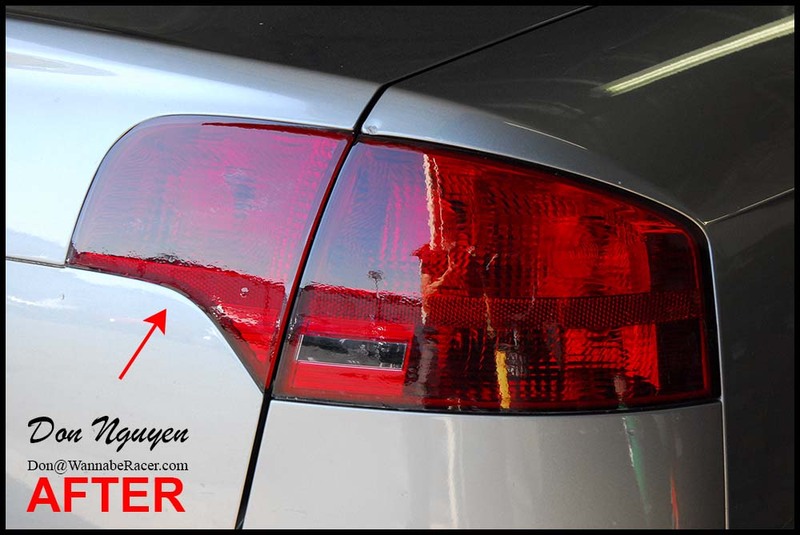 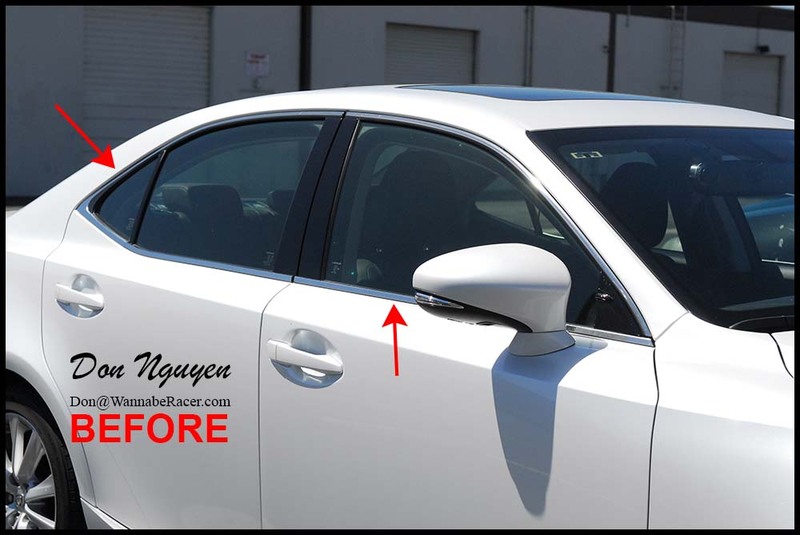 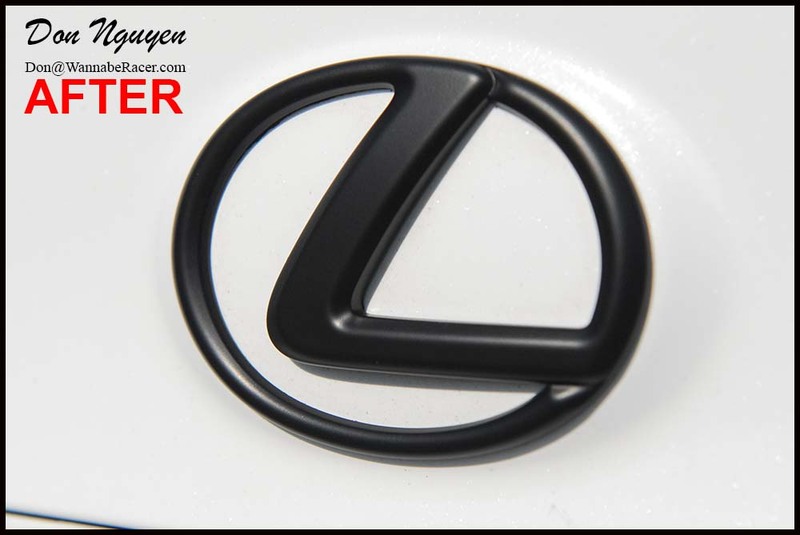 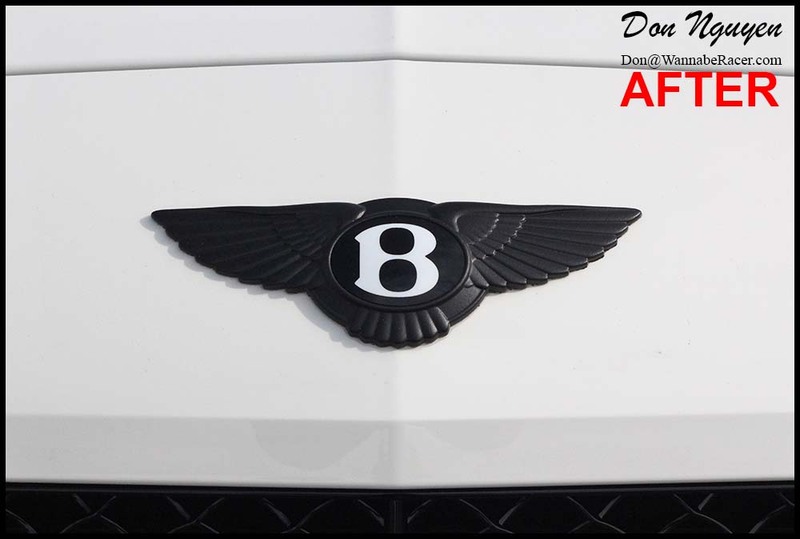 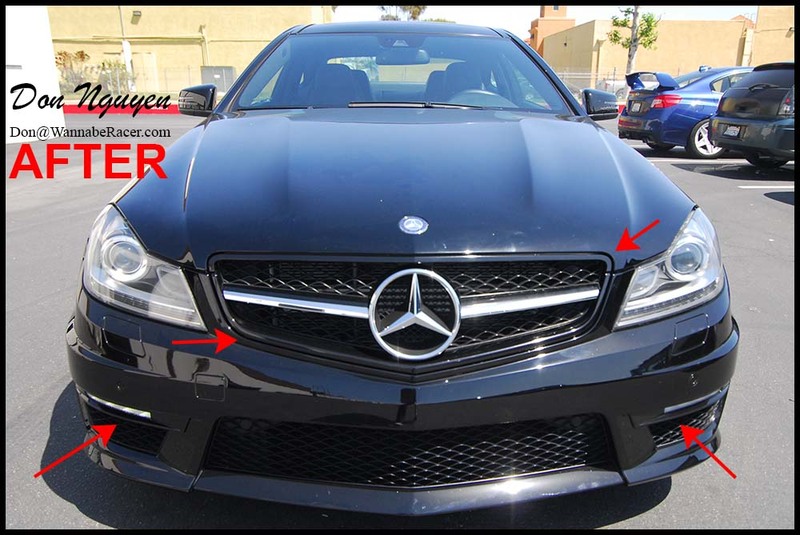 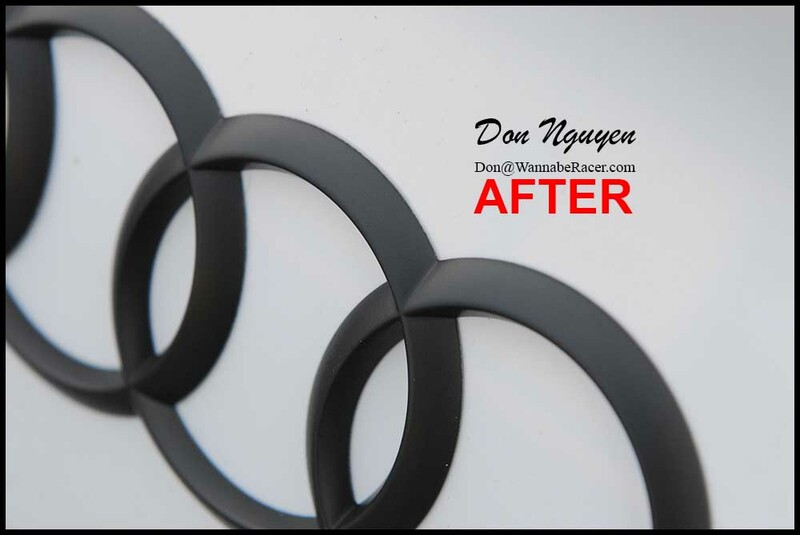 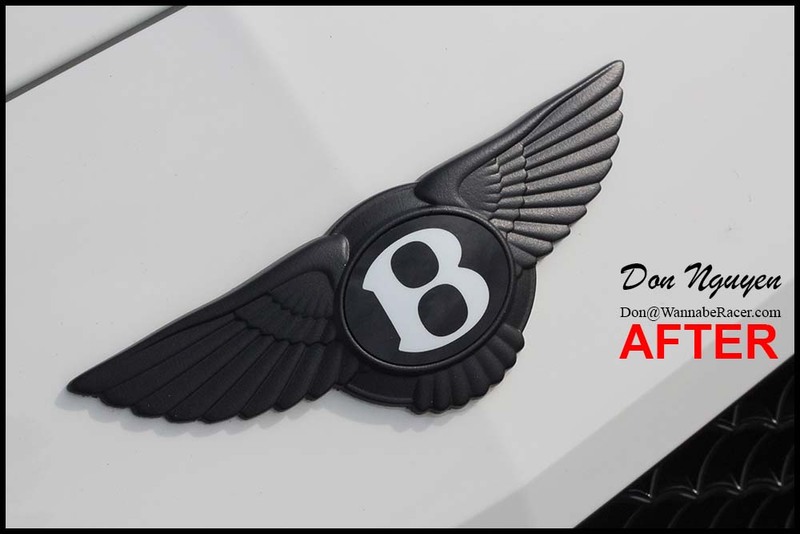 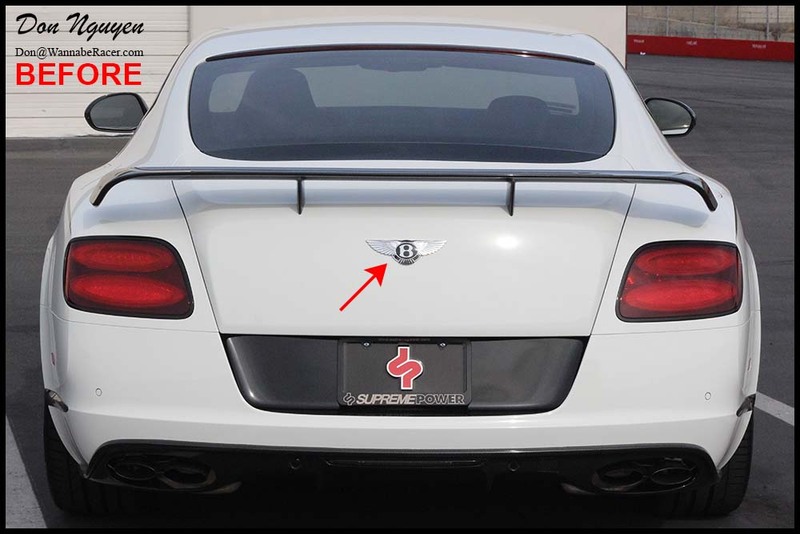 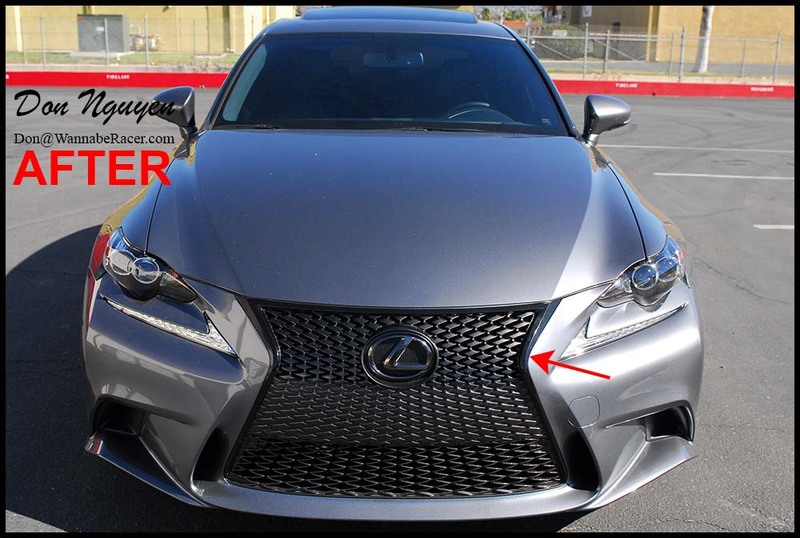 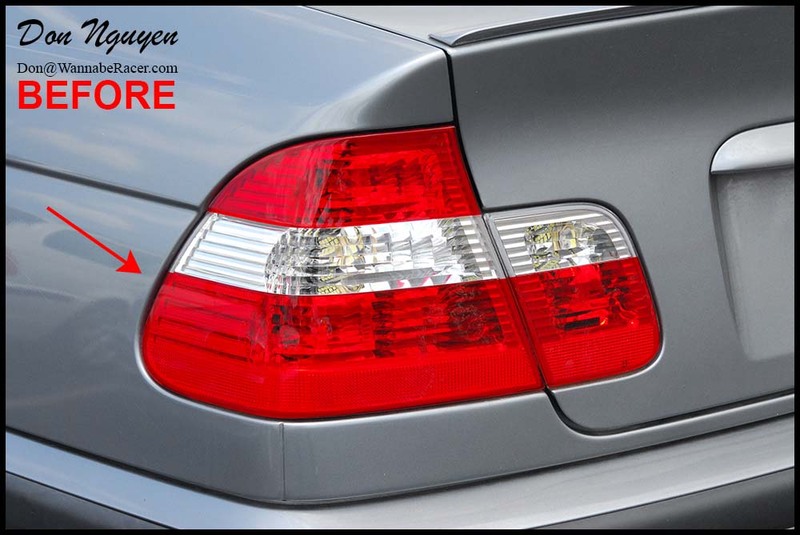 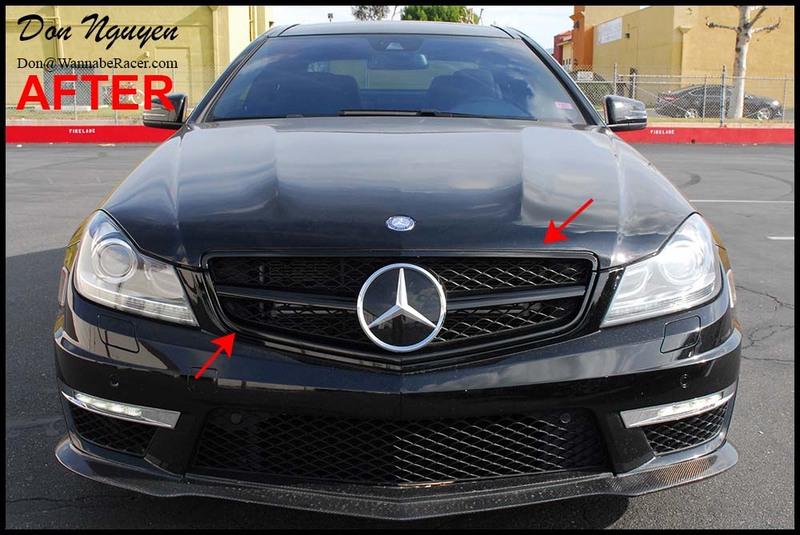 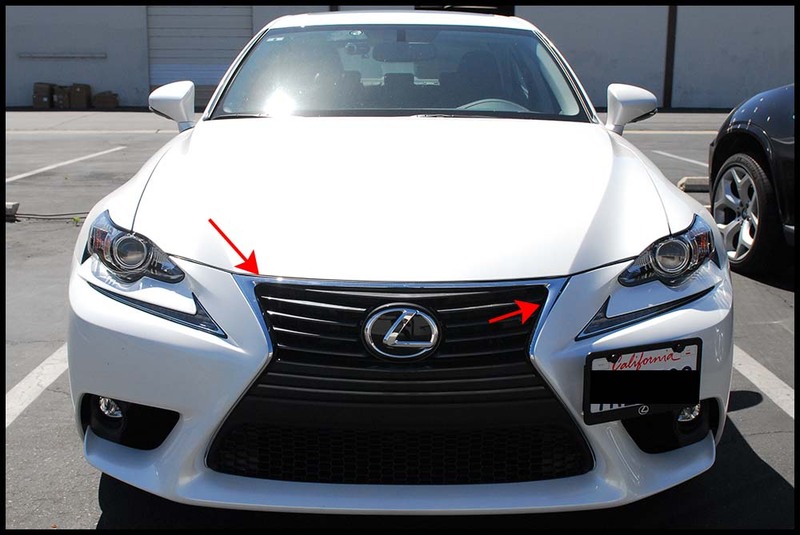 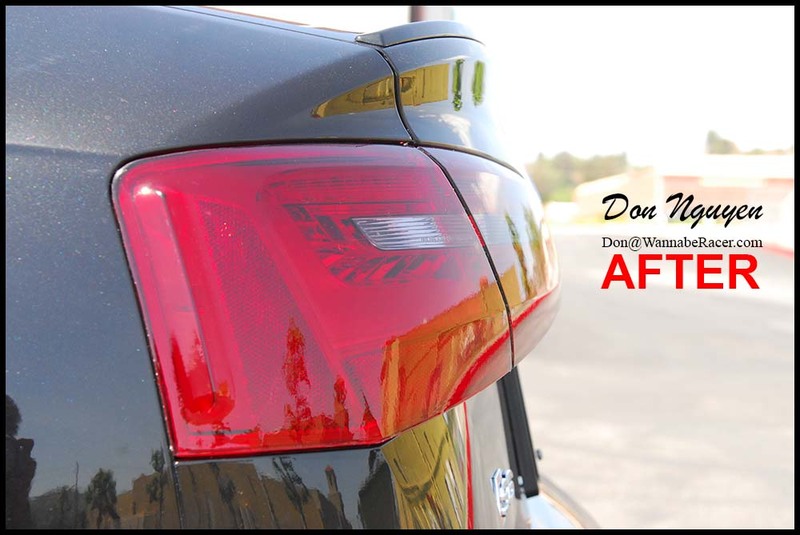 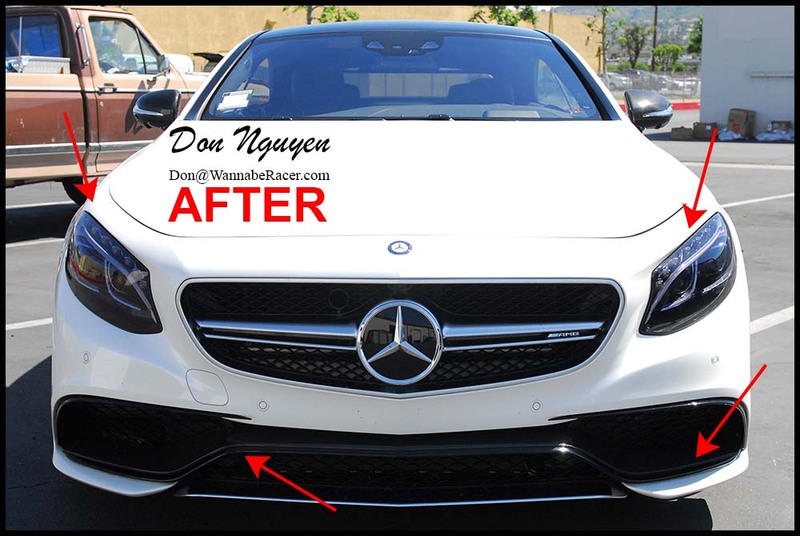 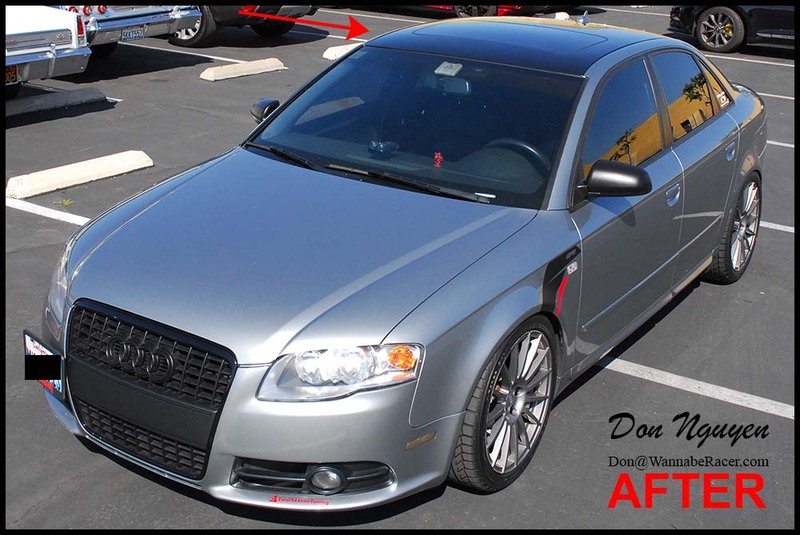 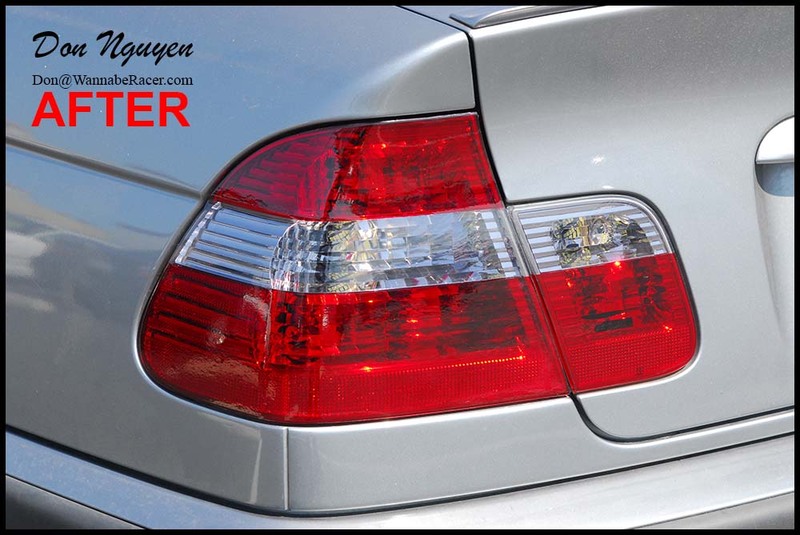 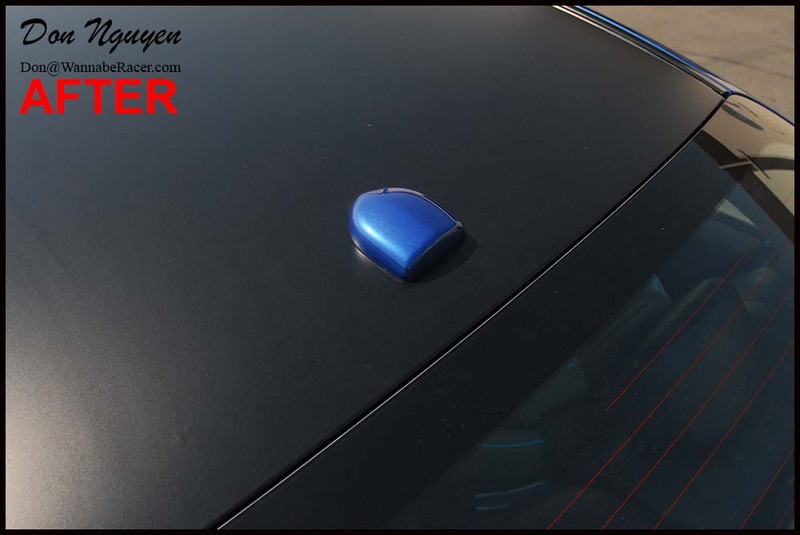 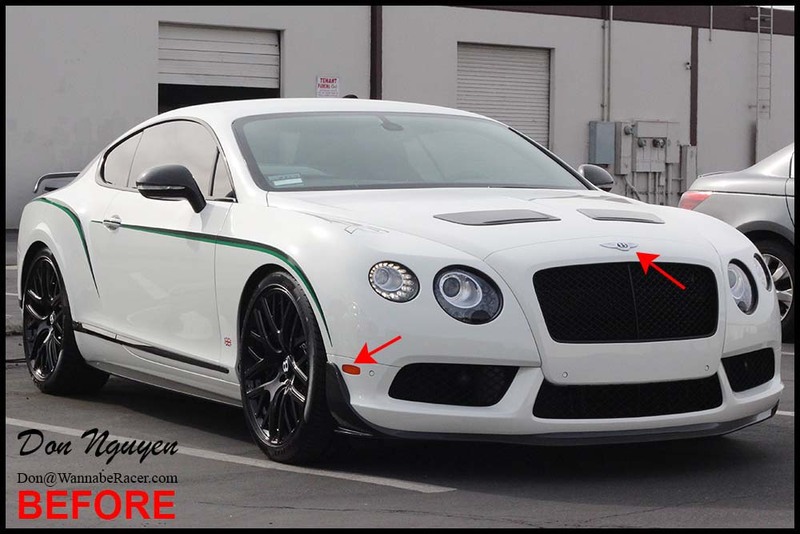 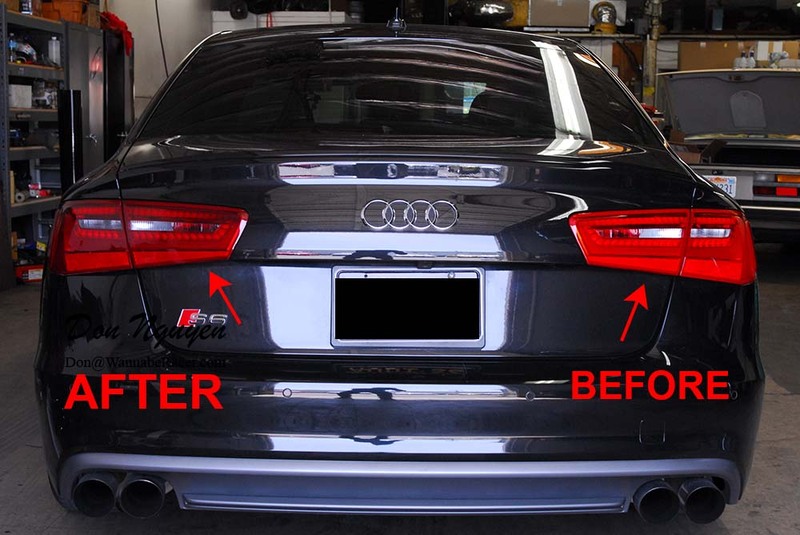 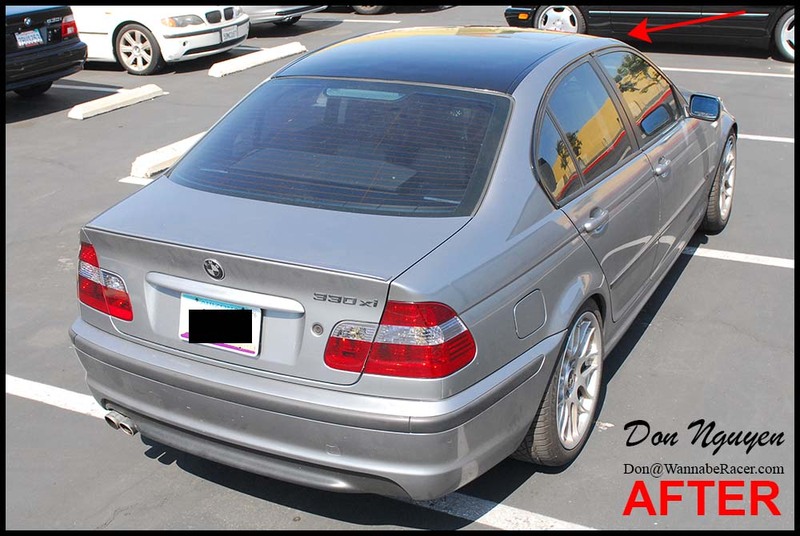 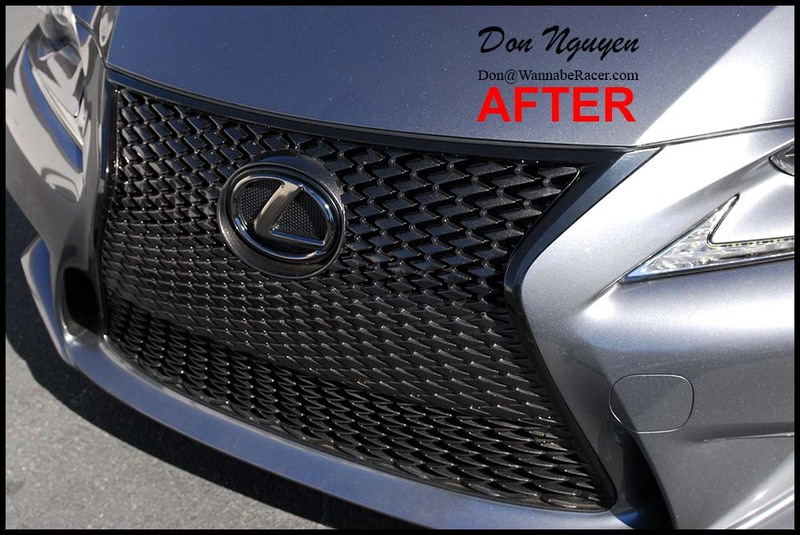 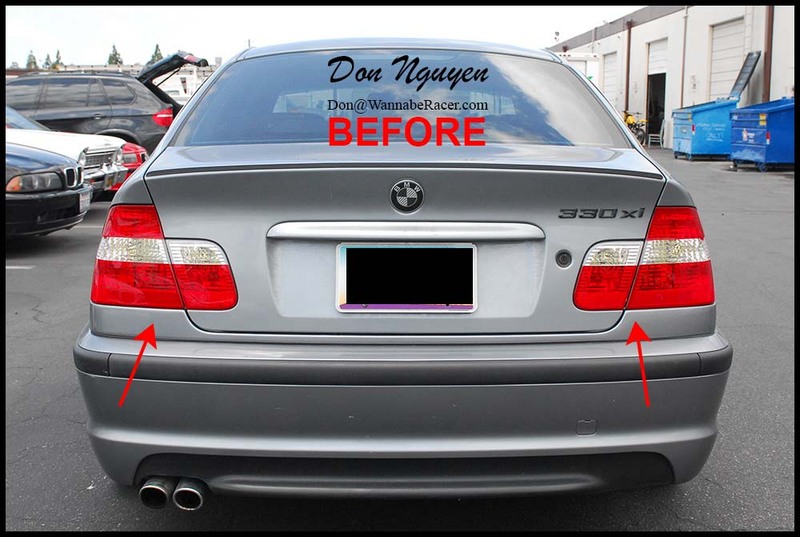 Plasti dip can be easy enough to use, but for those who have tried it, it can still take some skill to get it to come out perfect. 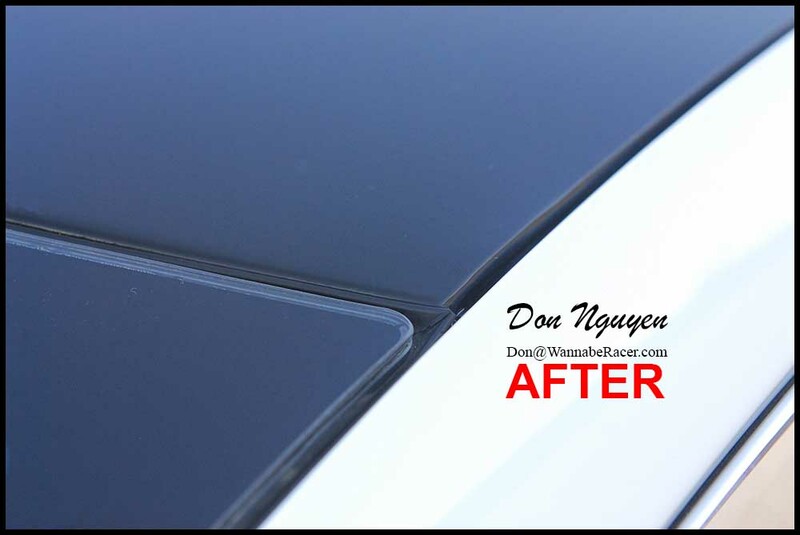 I took some up close pictures of the plasti dipped pieces from various angles, to show how the pieces that I plasti dip look like. 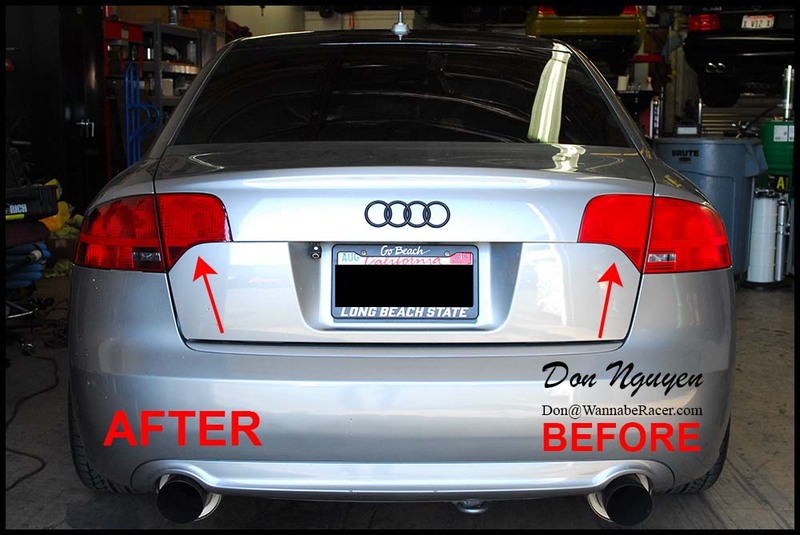 The owner of this particular car was from Oceanside / San Diego and came out to me in Anaheim Hills / Orange County to have the vinyl work done. 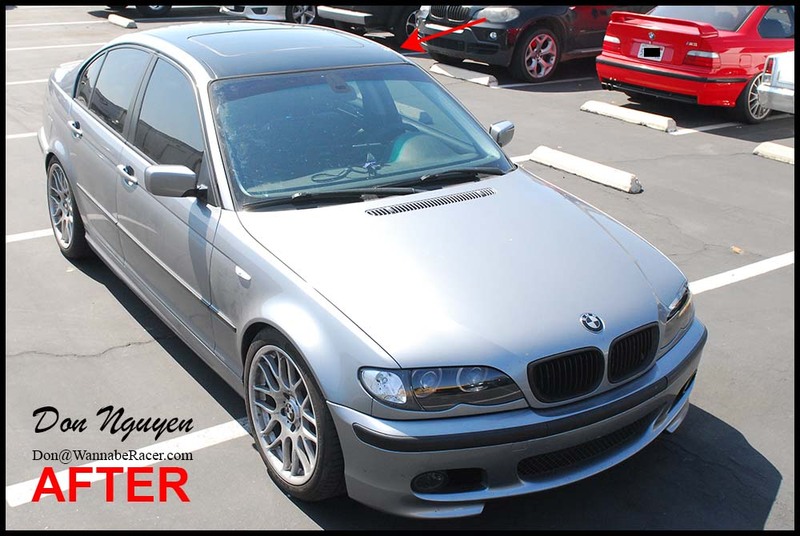 Any chance of you coming up to Norcal, Bay Area?